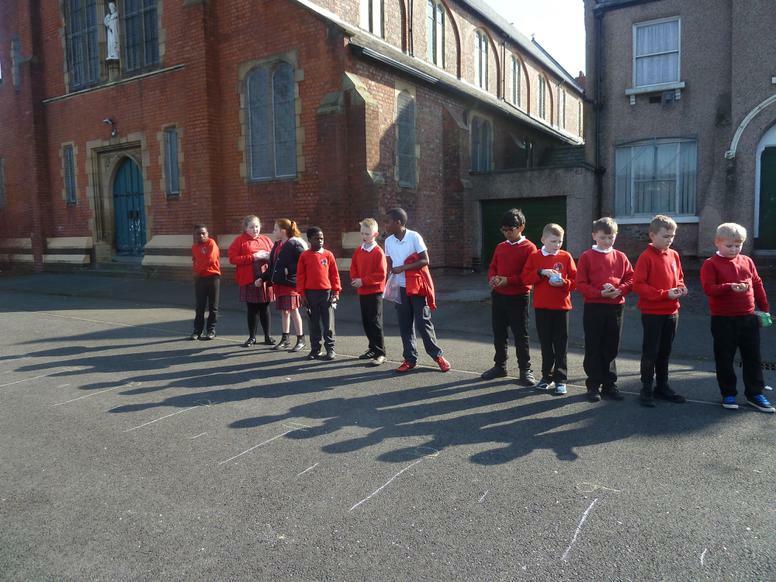 ‘two up two down’ house with a back yard, explored a variety of shops, a doctors surgery, a pub and a church. 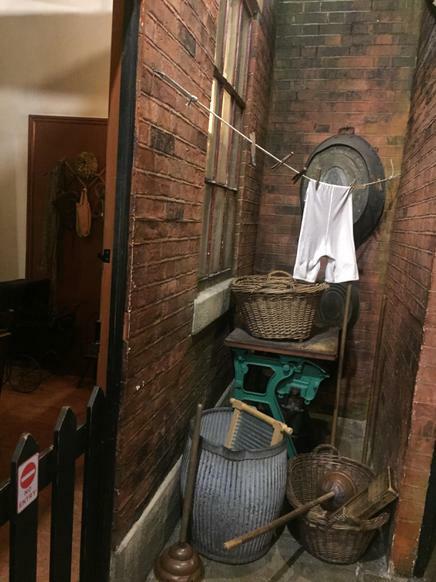 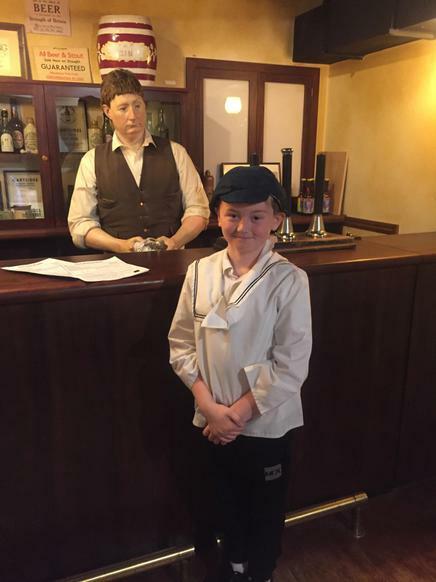 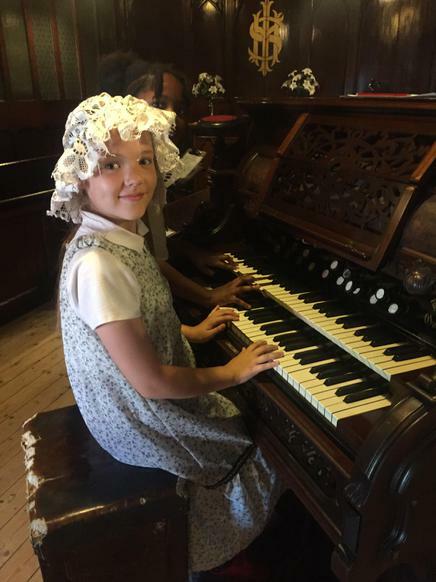 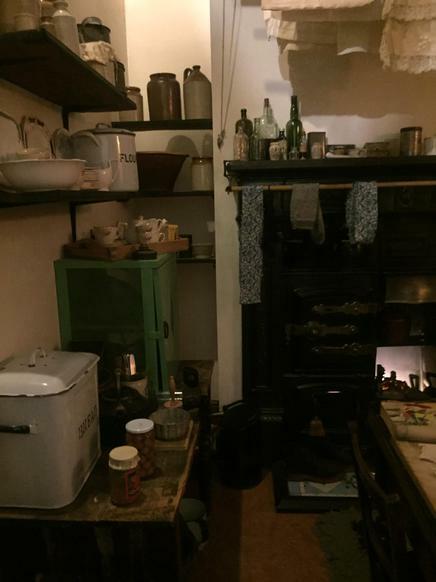 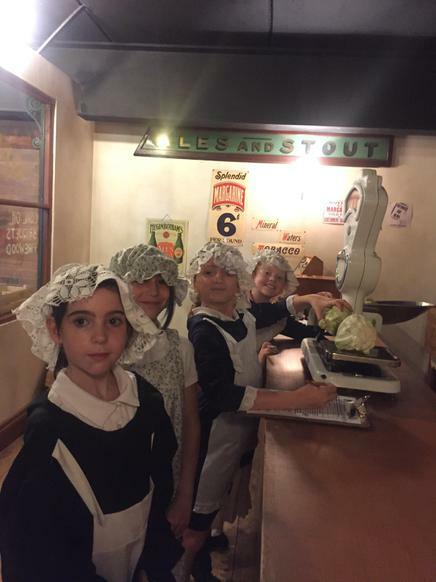 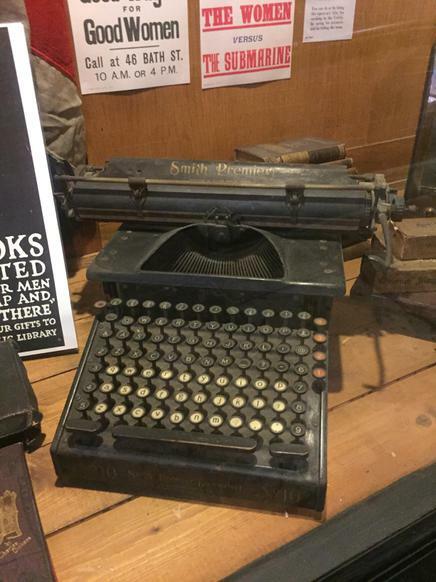 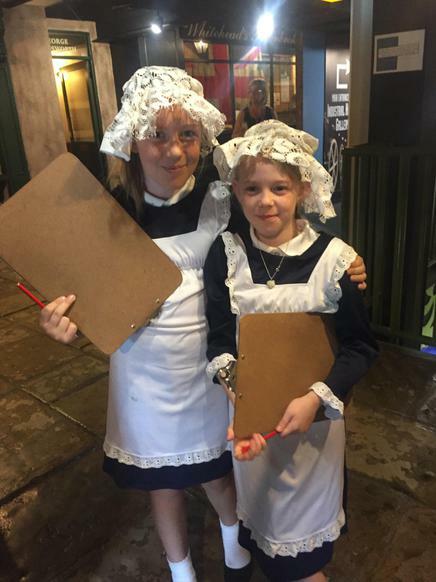 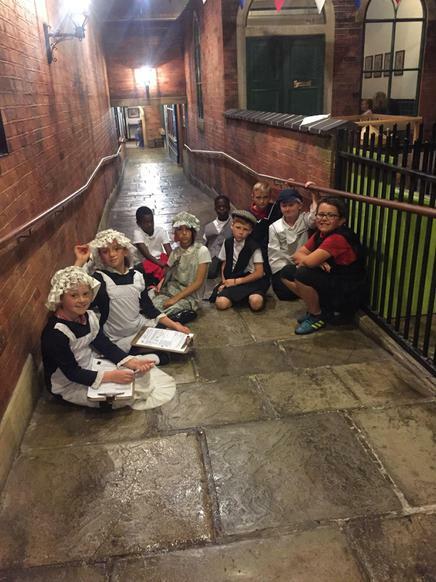 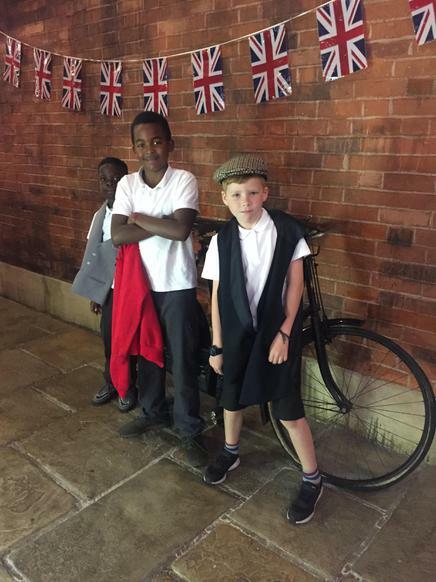 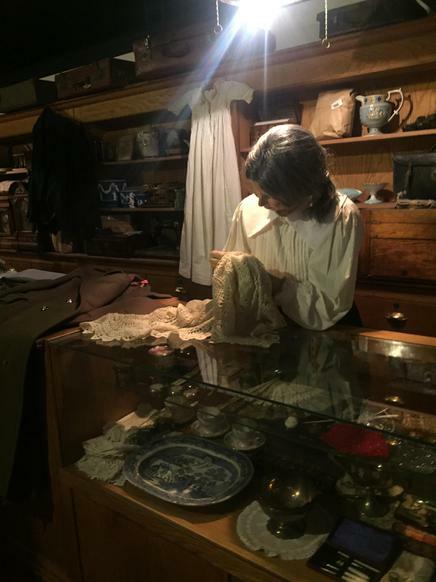 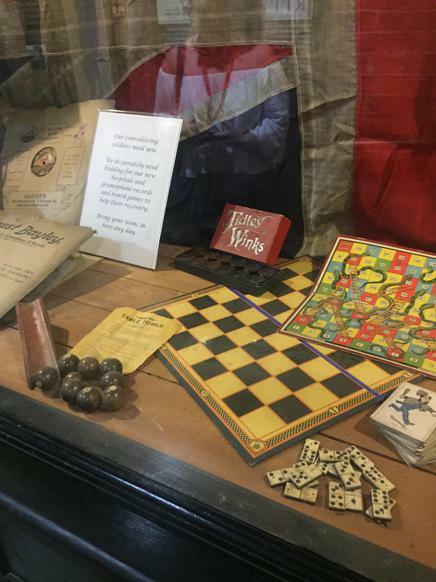 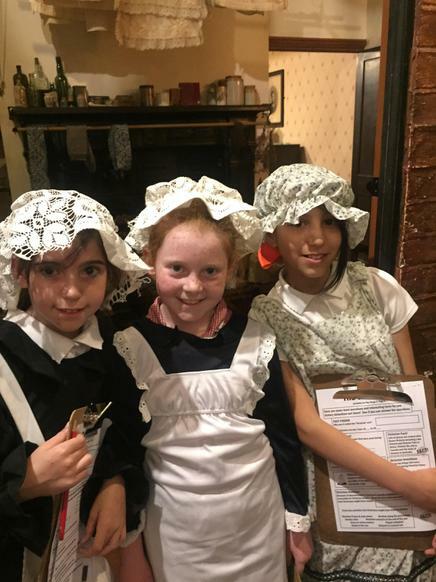 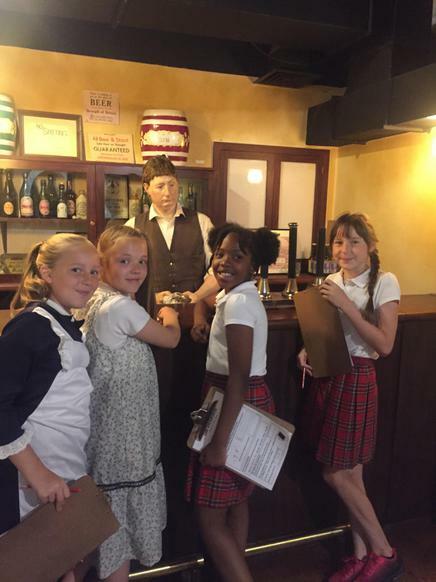 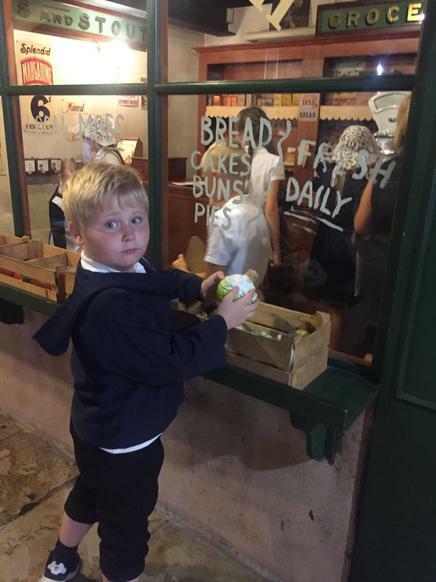 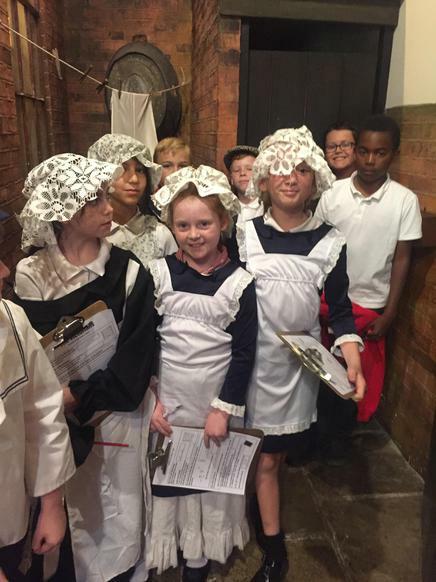 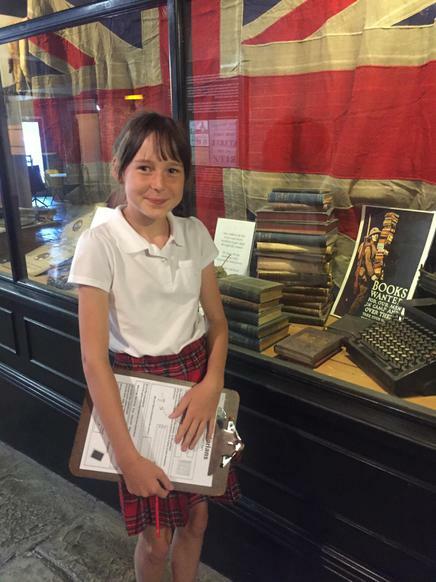 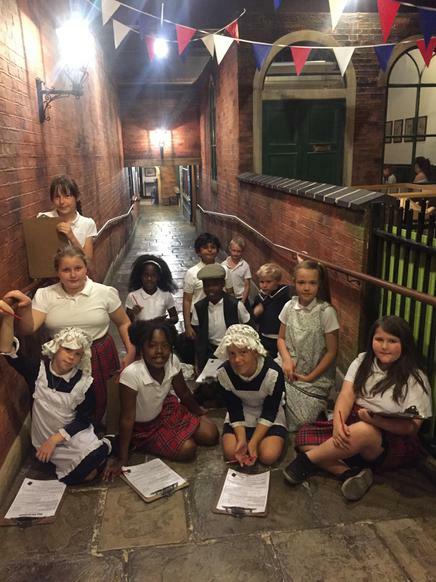 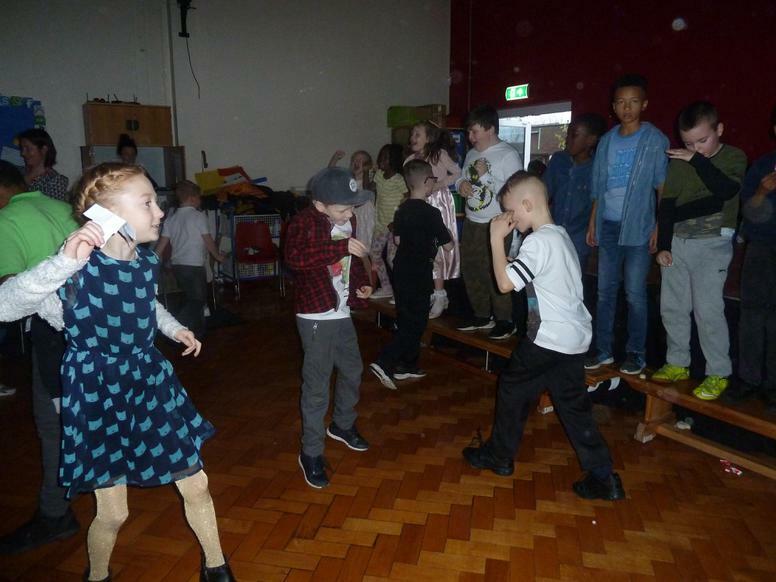 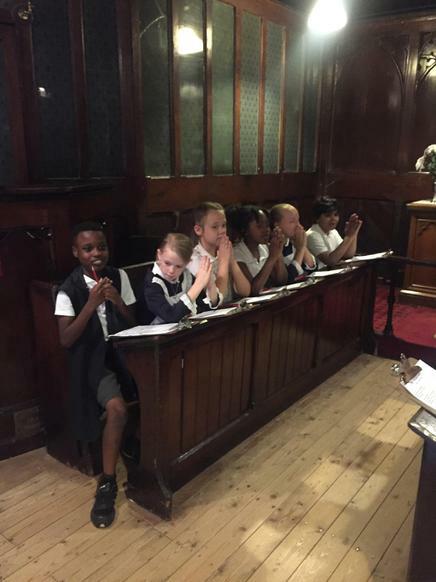 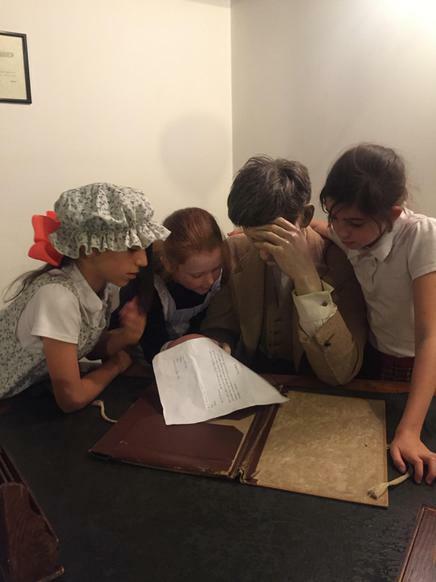 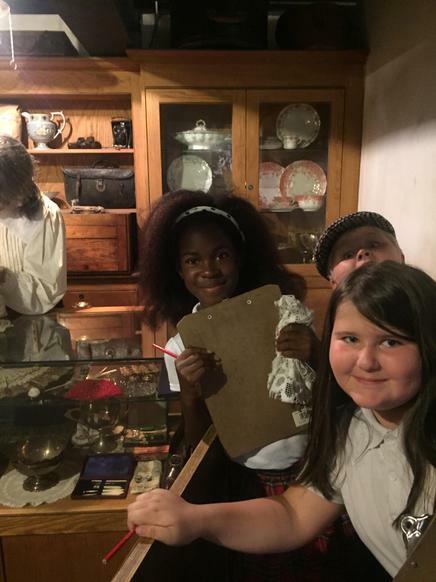 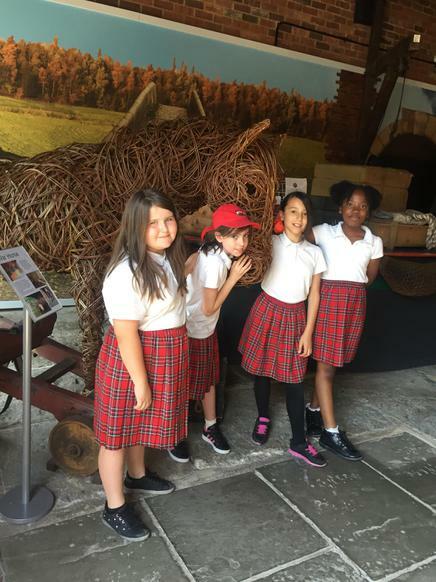 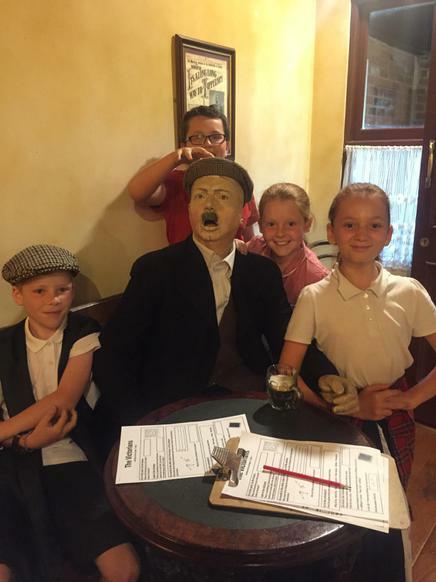 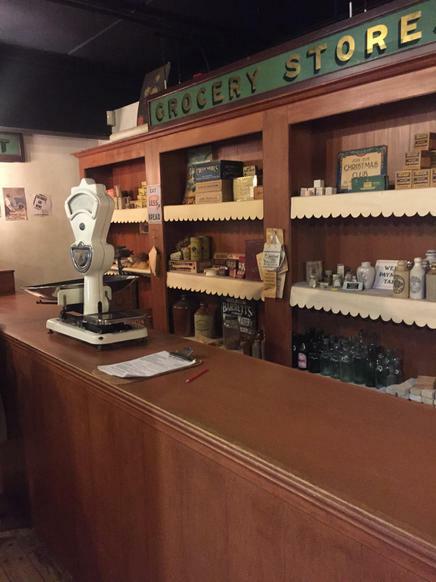 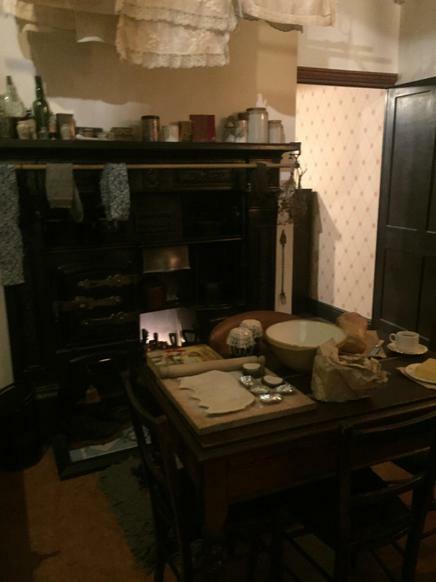 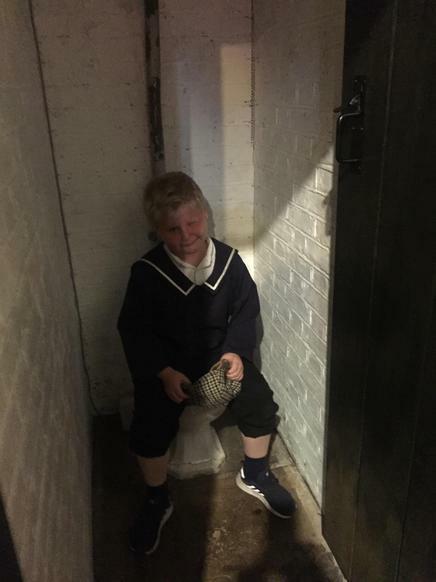 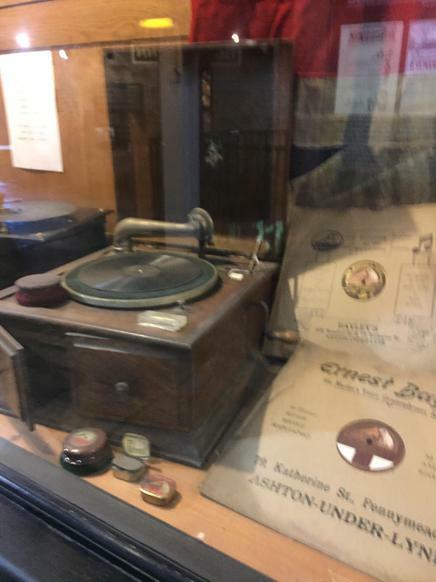 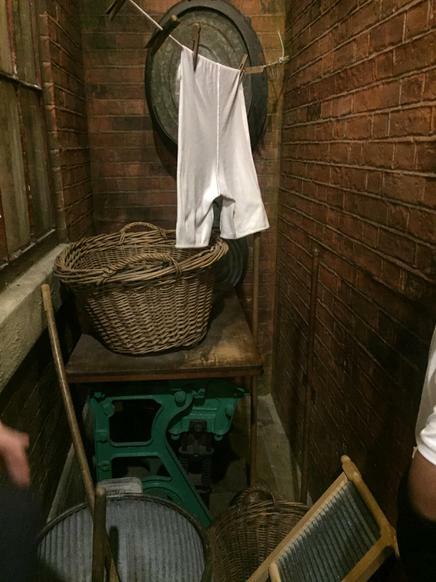 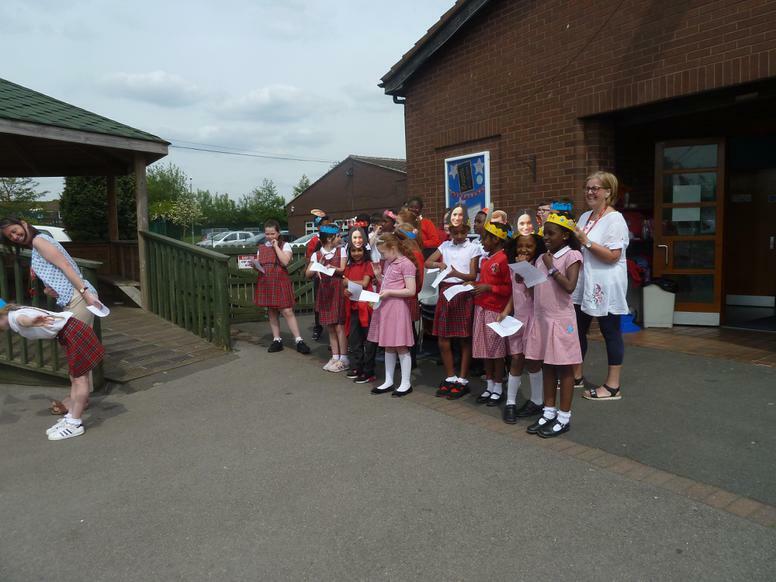 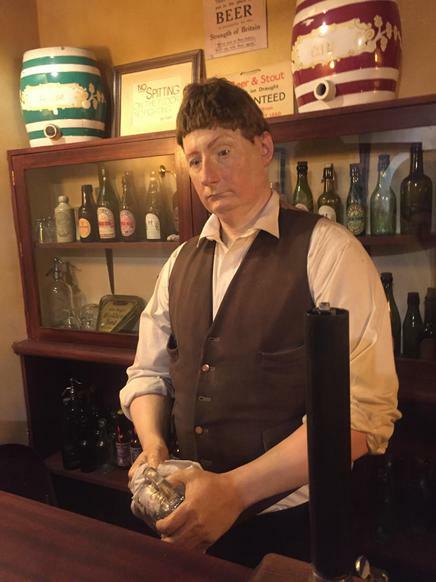 The experience brought the Victorian era to life allowing the children to consider the past and how their lives differ from those of Victorian children. 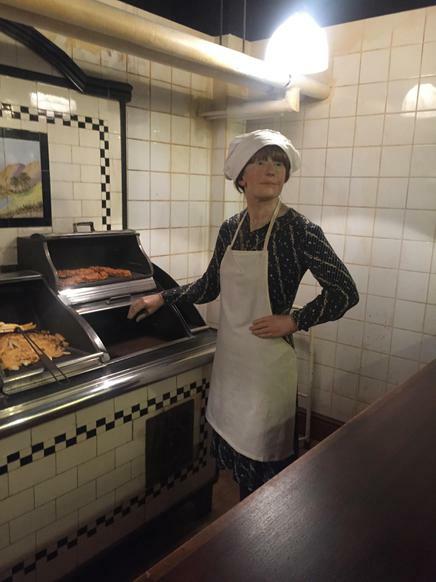 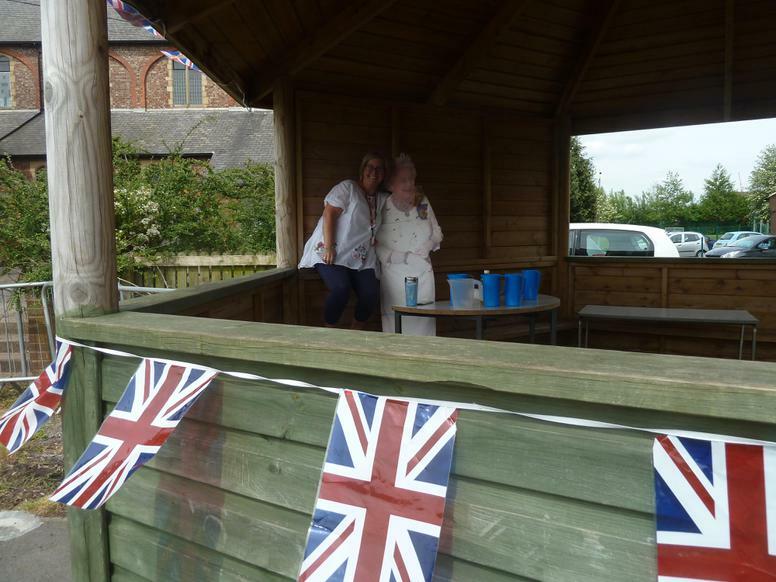 Does anyone recognise this lady? 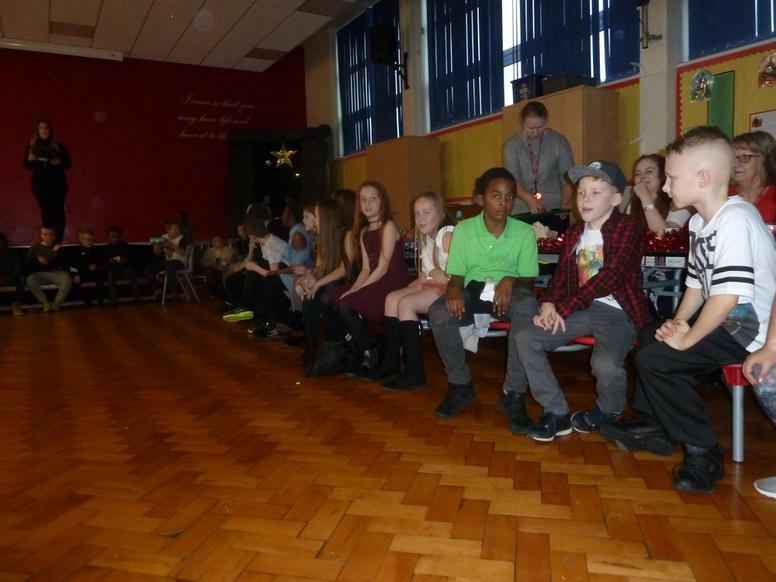 The audience applaud the Orchestra and the conductors - Well done, Faren! 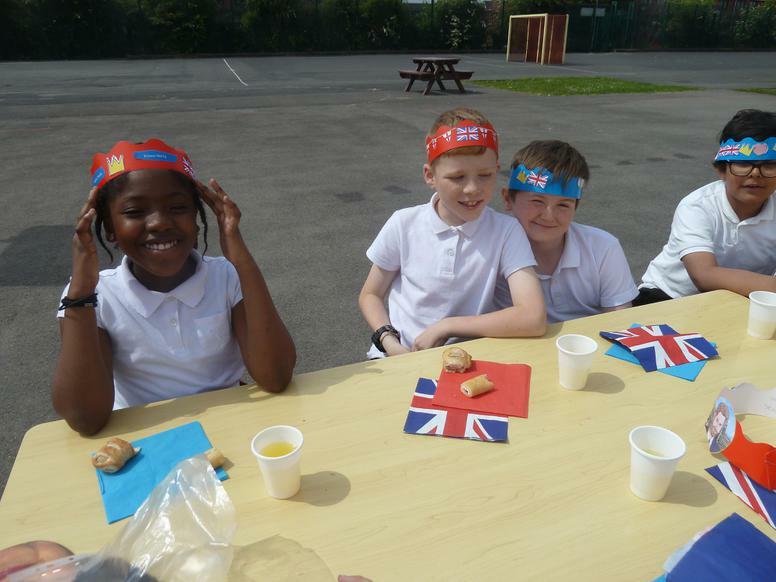 On 23rd April we celebrate the patron saint of England, St George. 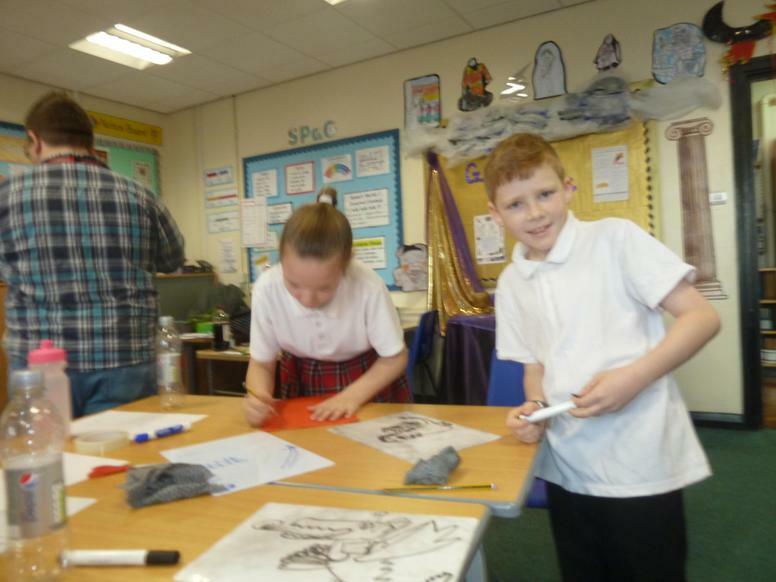 St George was a brave Roman soldier who protested against the Romans' persecution of Christians and died for his beliefs. 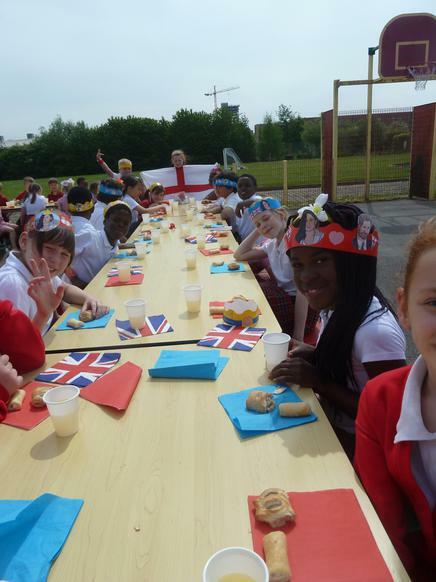 St. George is the patron saint of England. 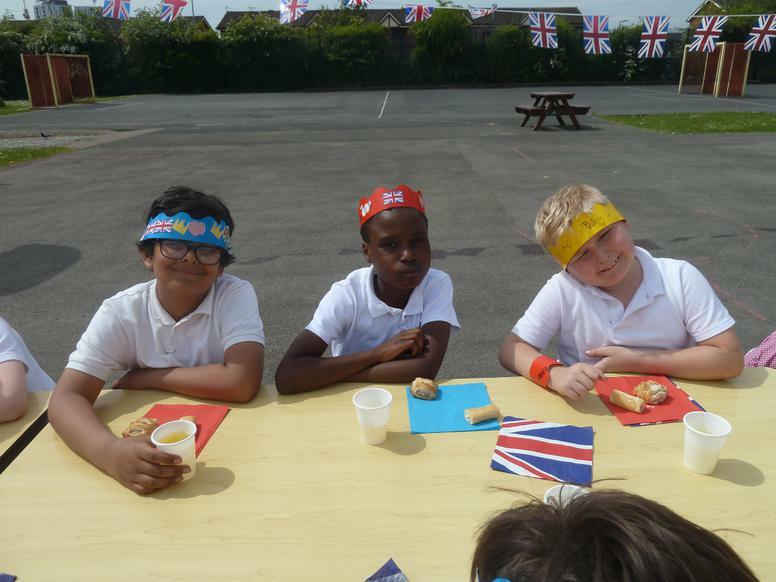 His emblem, a red cross on a white background, is the flag of England, and part of the British flag. 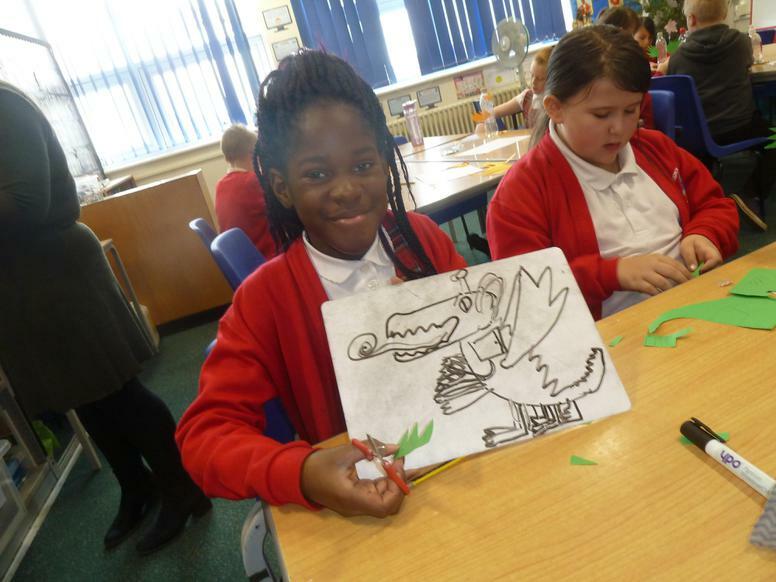 The most famous legend of Saint George is of him slaying a dragon. 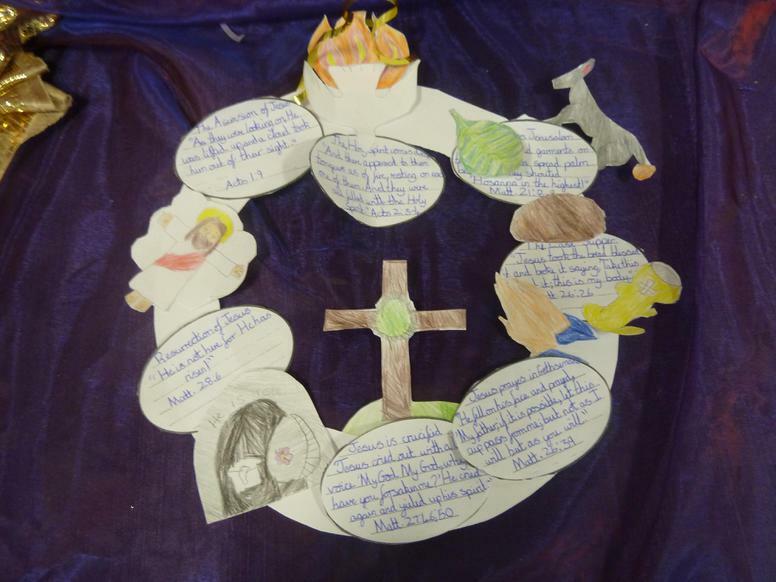 This represents good overcoming evil. 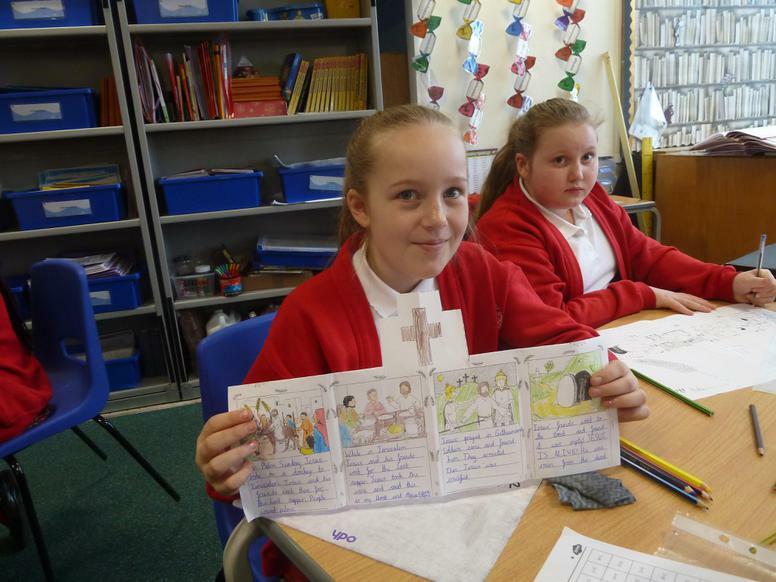 Year 5 write and share the story of St George and the Dragon. 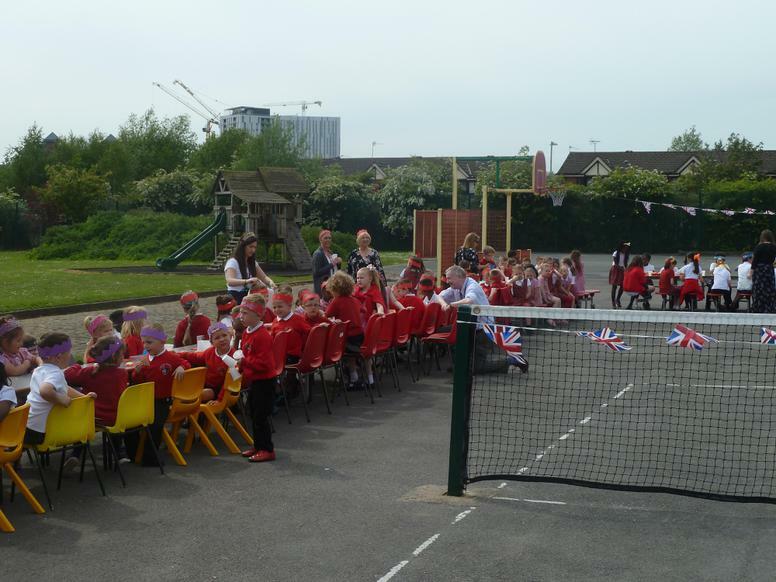 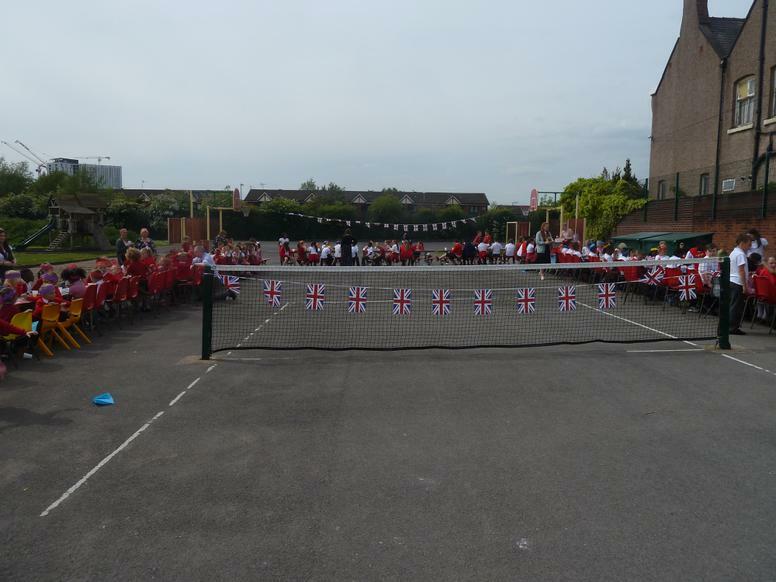 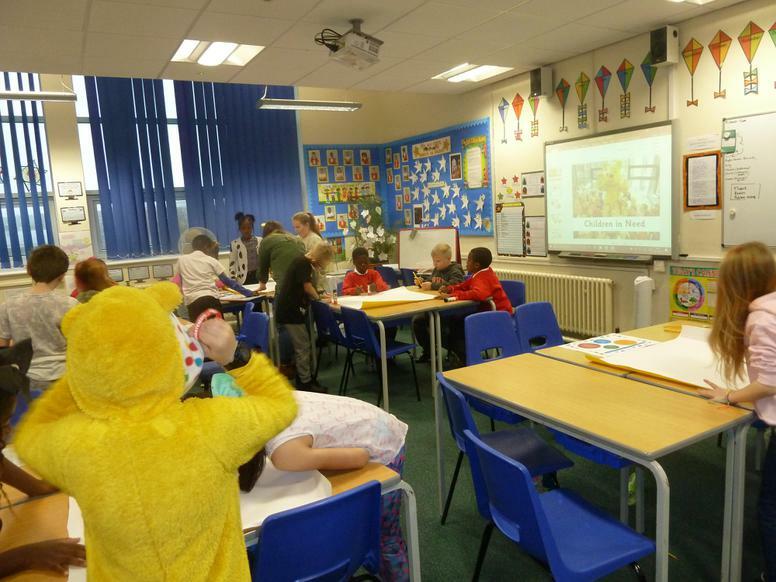 We would like to send a huge THANK YOU to all the EYFS /KS1 teachers and children who welcomed us into their classrooms. 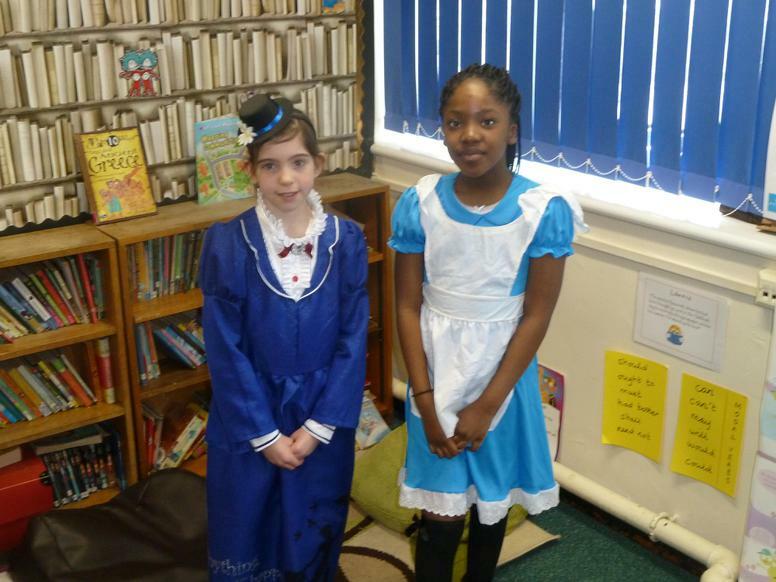 All classes were wonderfully well behaved and listened to our stories with enthusiasm. 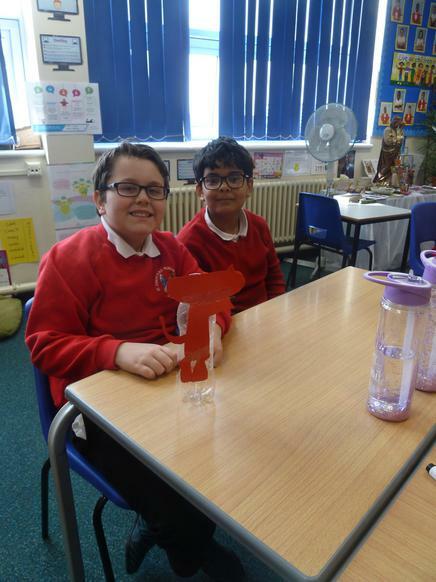 Look at our visitor! 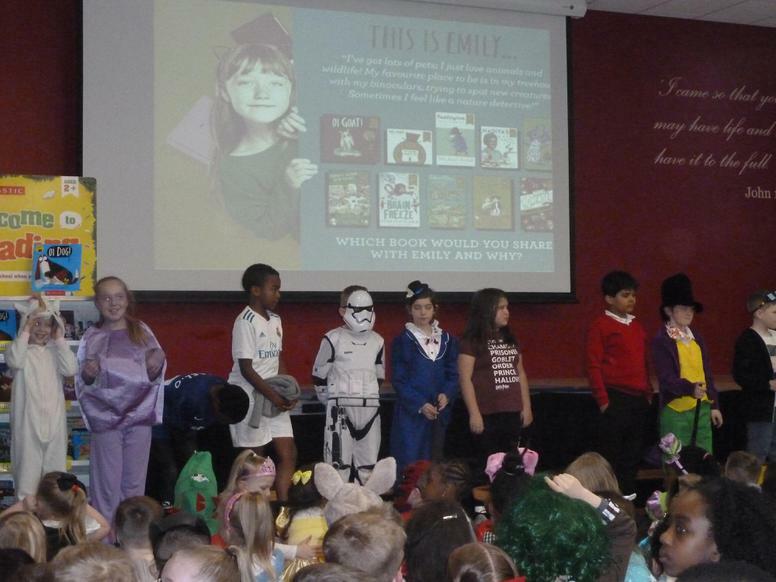 Who recognises this wonderful writer and reader who shared his story with Year 5? 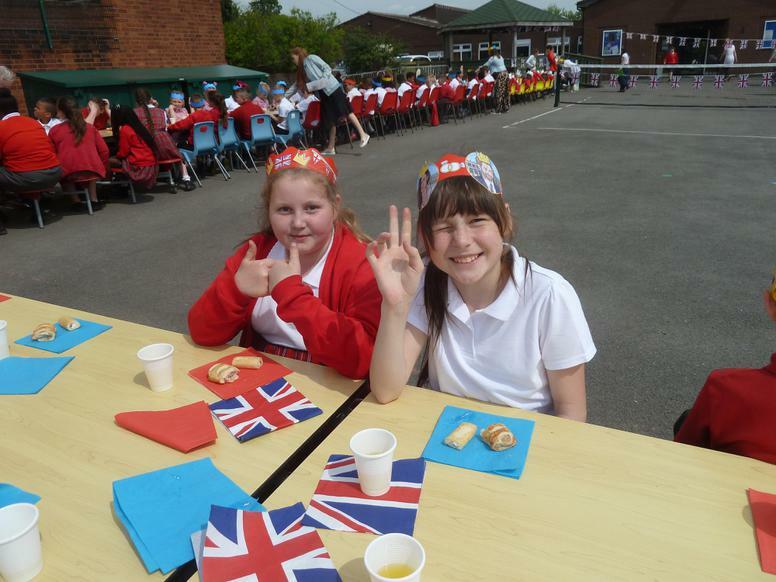 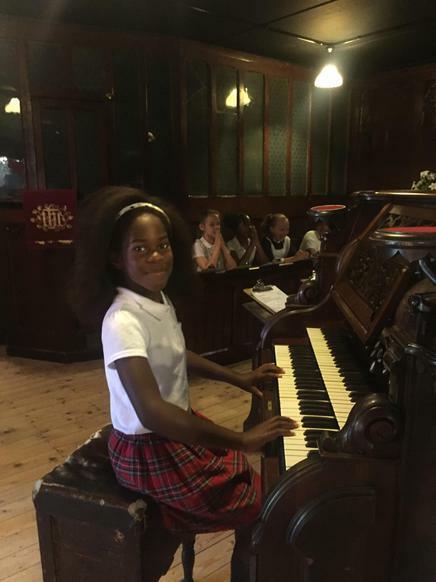 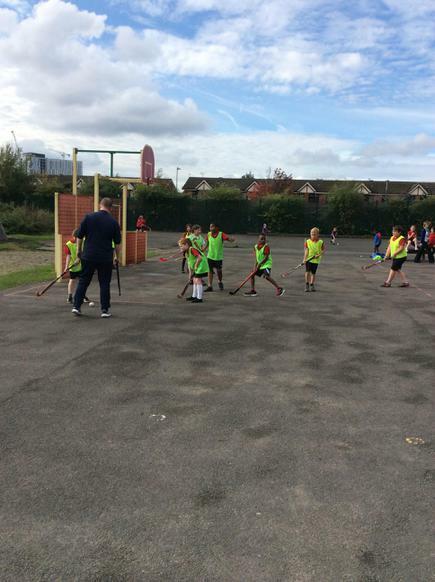 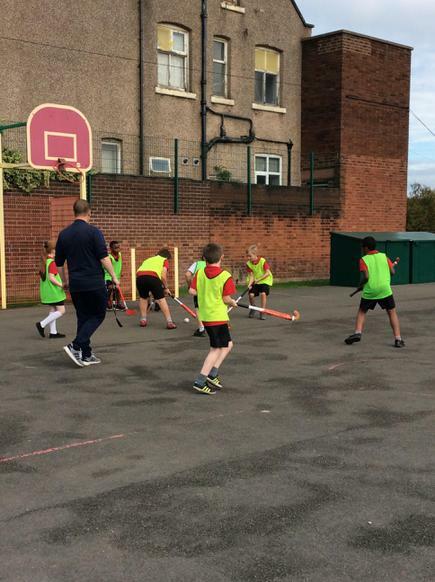 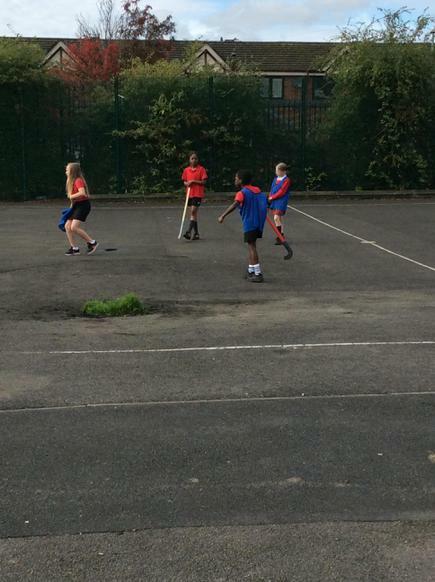 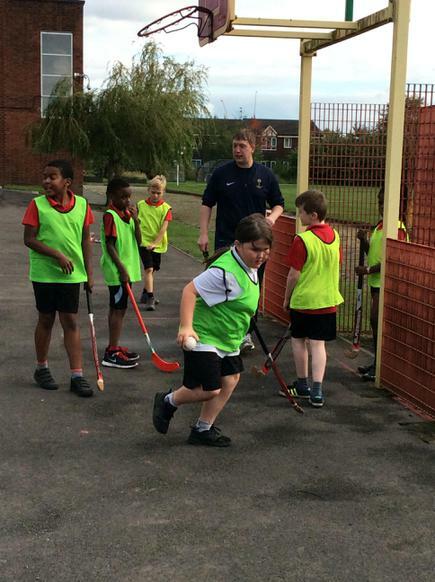 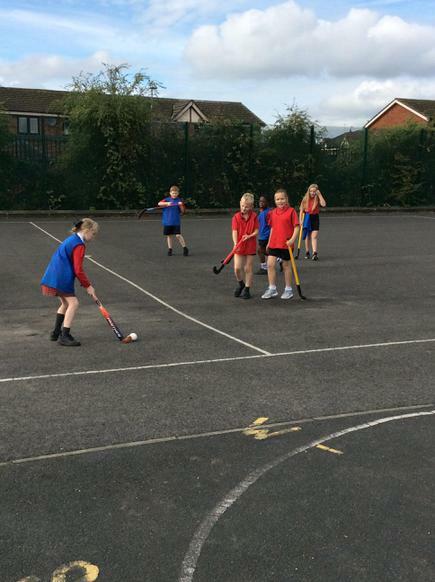 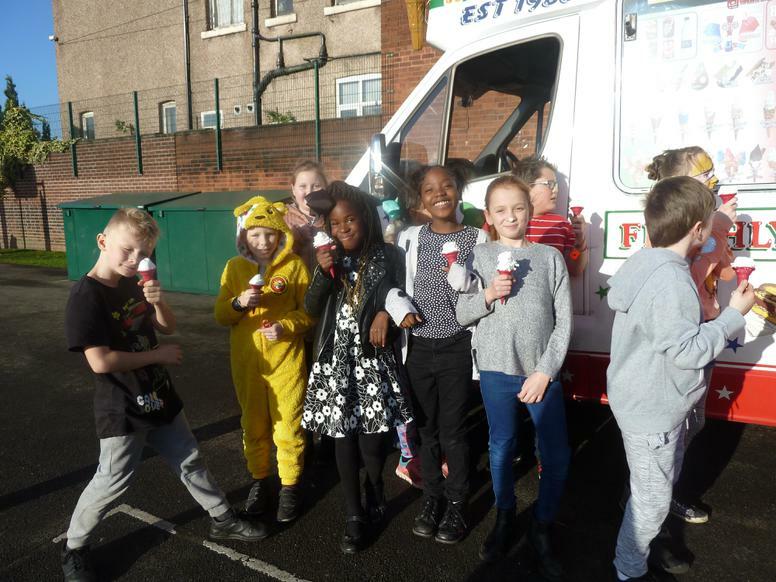 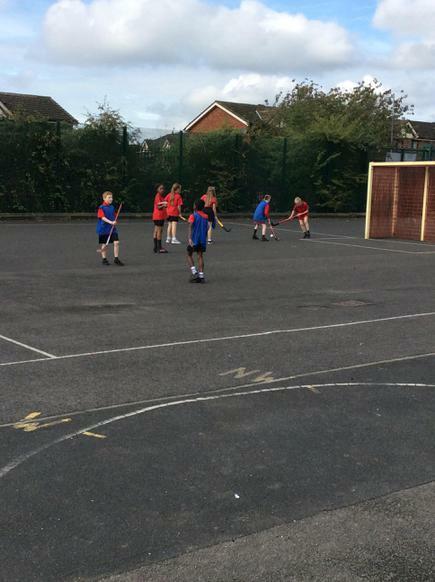 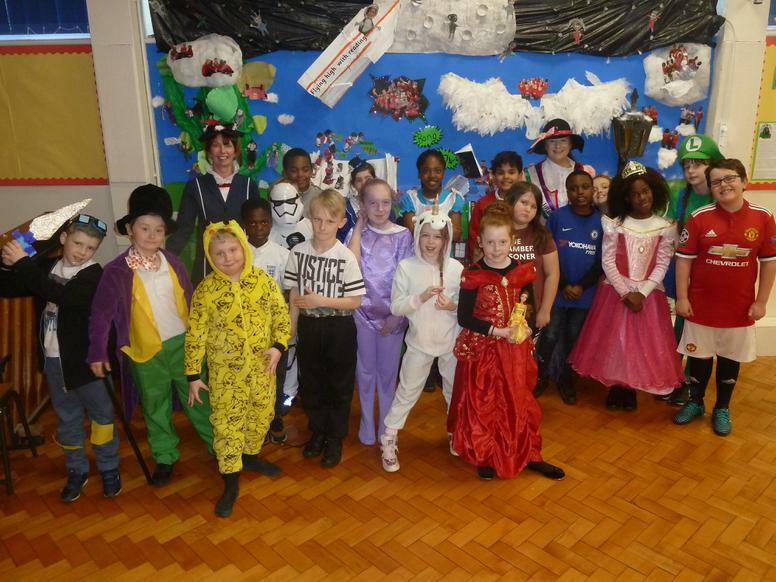 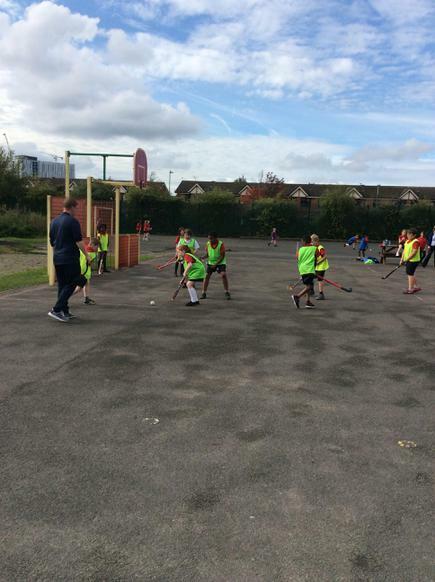 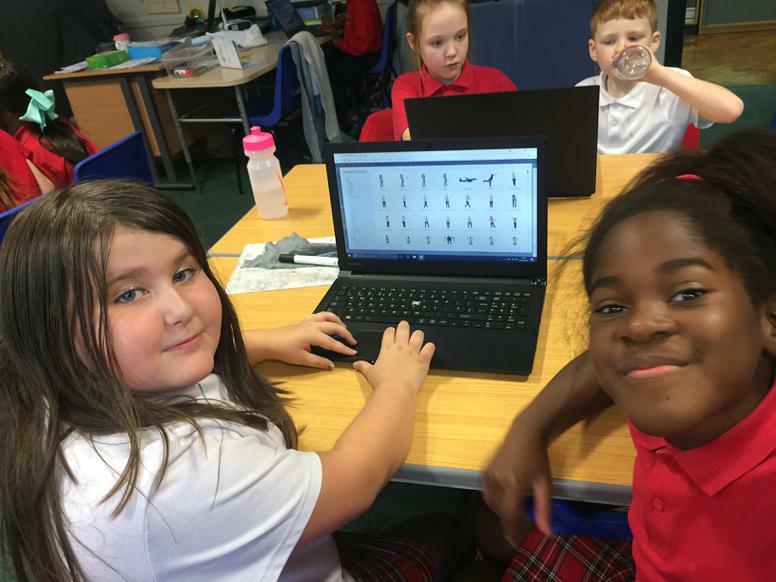 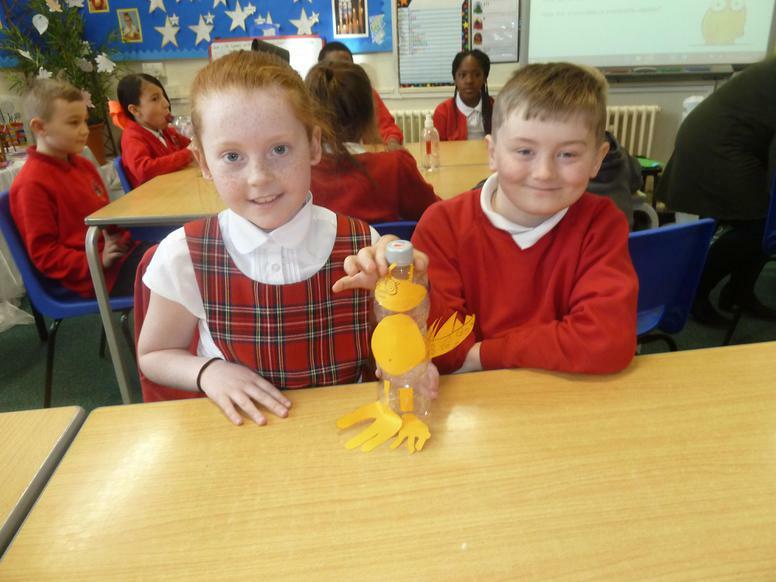 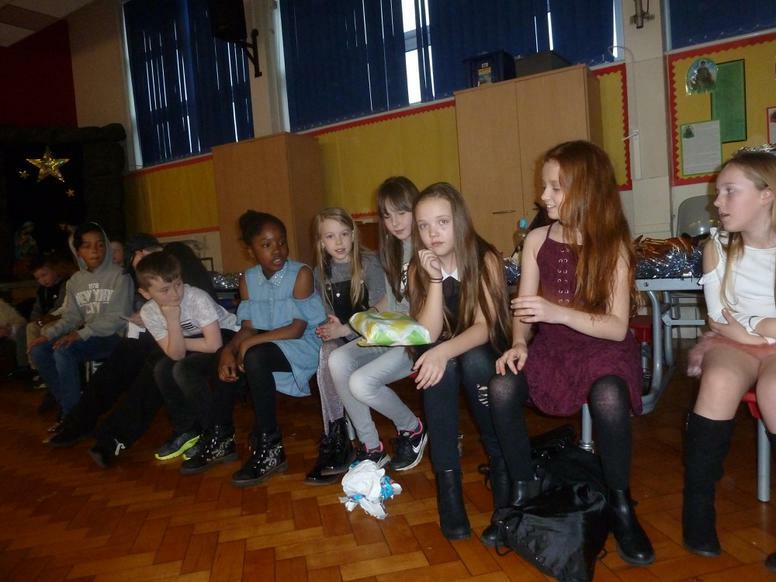 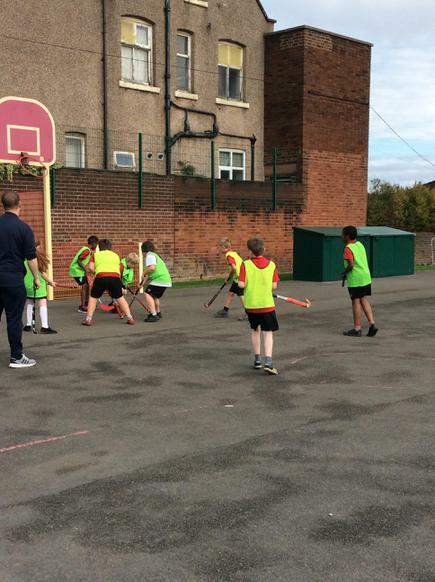 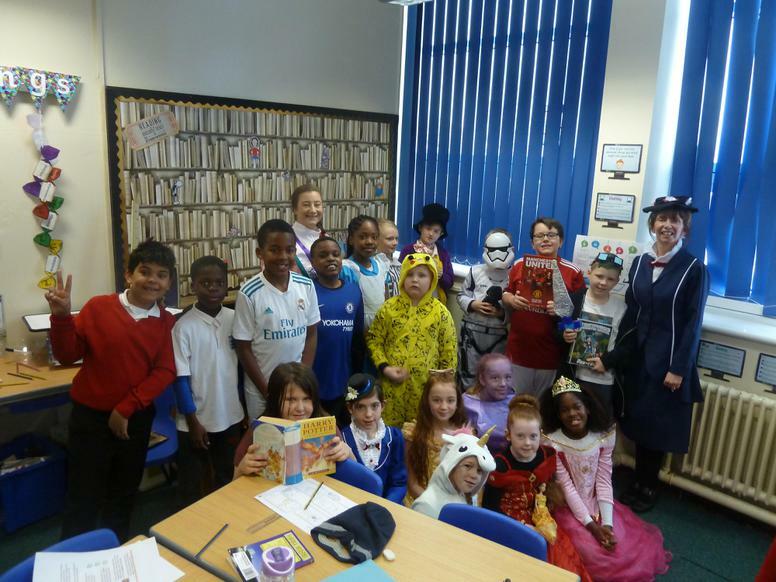 Year 5 have made a great start to the new school term. 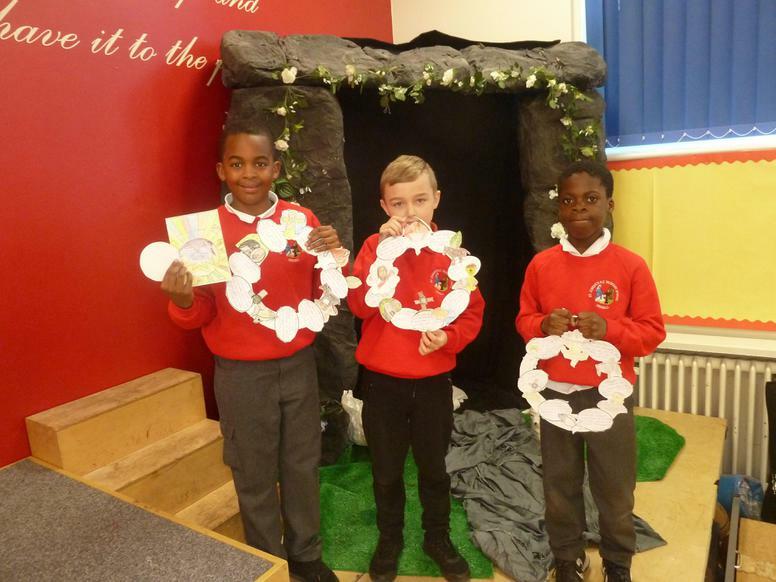 The Easter season comes to a close at Pentecost. 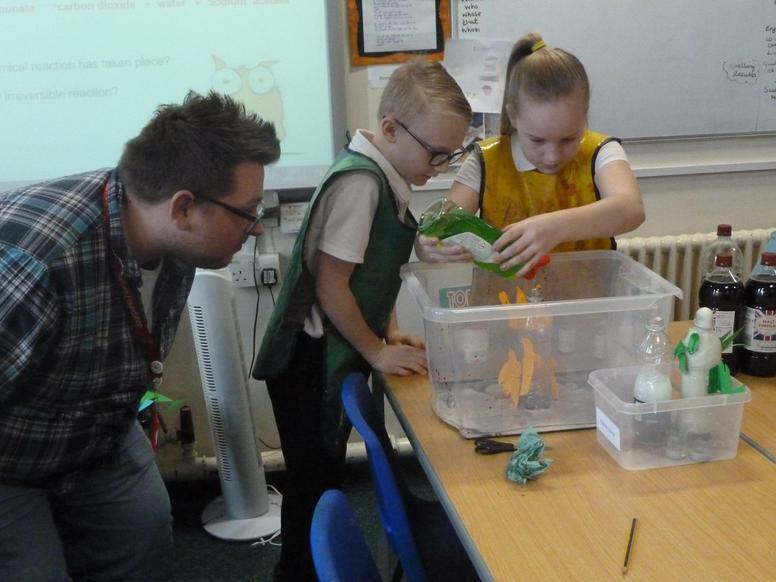 we have had a special 'Newspaper Afternoon' hosted by, a welcome visitor in our school, Mr J King. 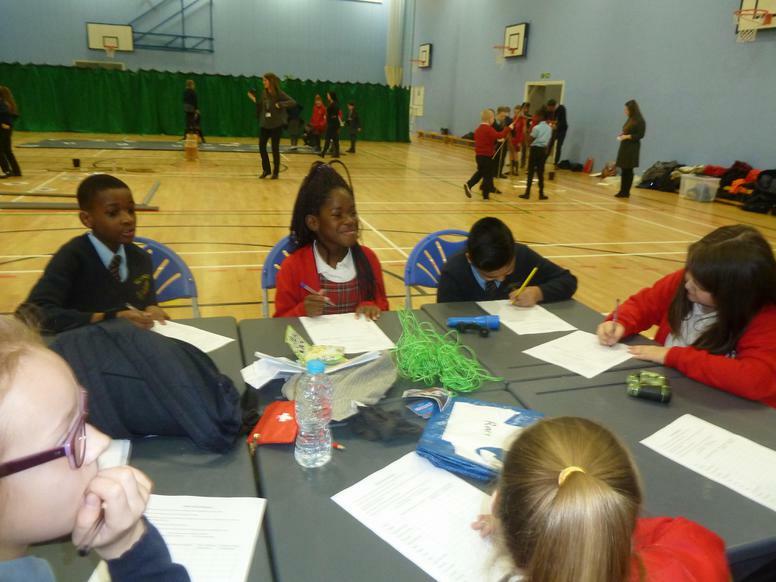 Year Five (and the teachers) would like to pass on their appreciation for this wonderful opportunity to develop and improve writing skills. 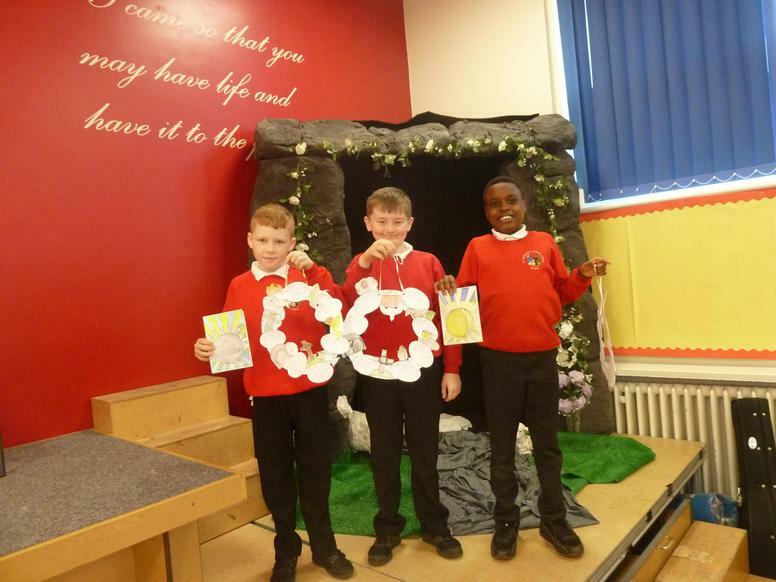 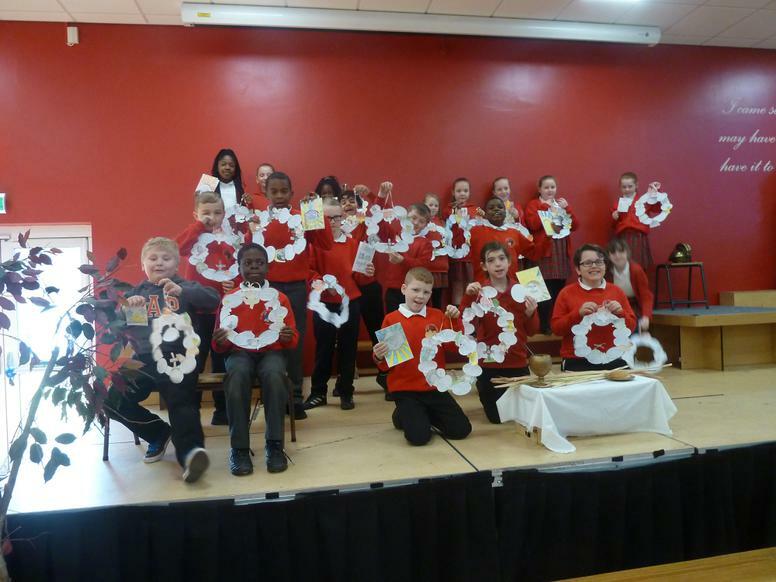 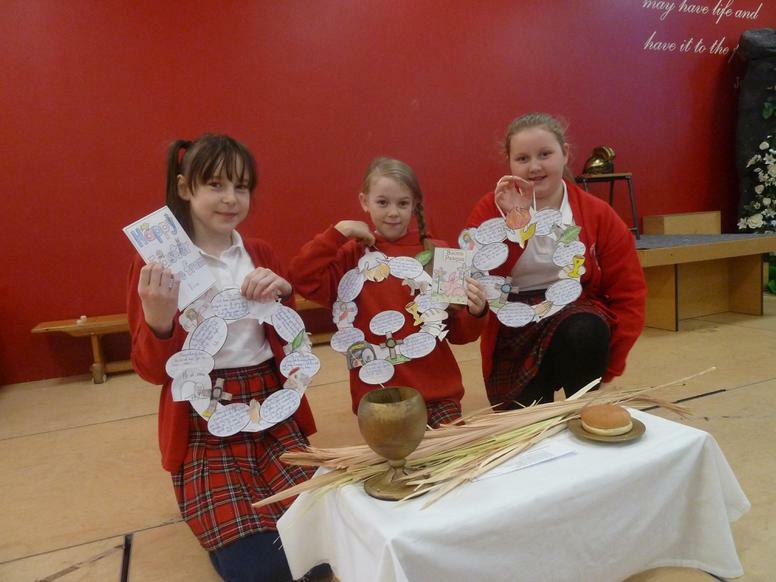 Y5 are thinking about the events of Holy Week and offering prayers each day to thank Jesus for His unconditional love for us and to ask the Lord to help us join together as a community to love and care for each other, to repent and forgive, to be true disciples. 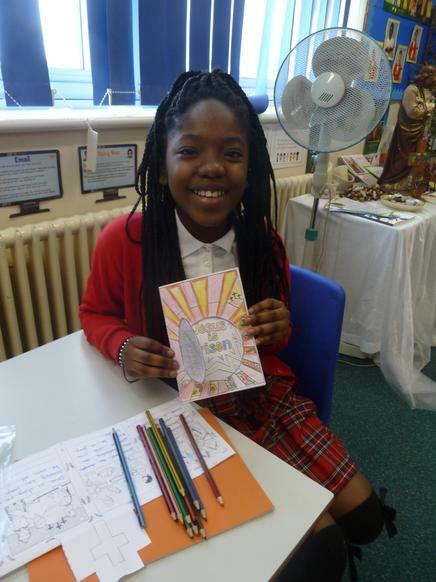 "You shall love the Lord your God with all our heart and with all your soul and with all our mind and with all your strength. 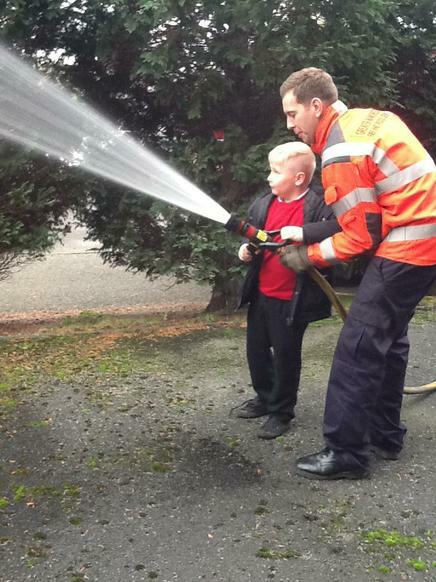 You shall love your neighbour as yourself." 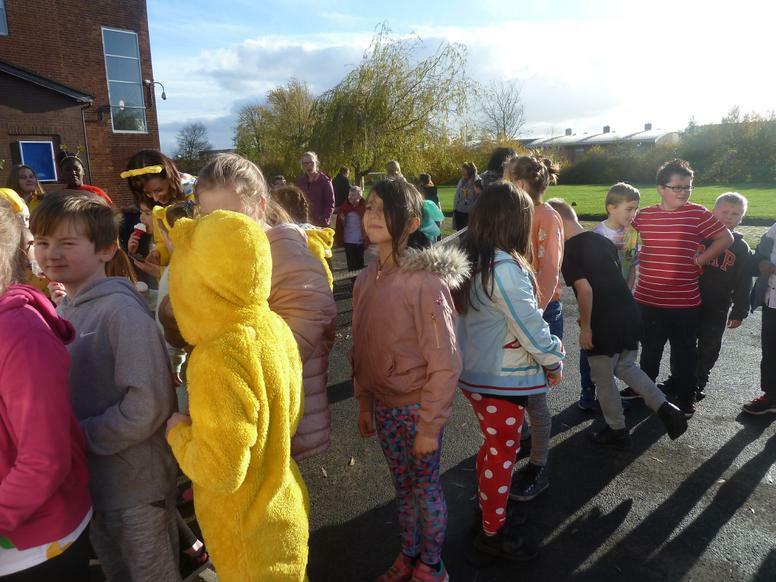 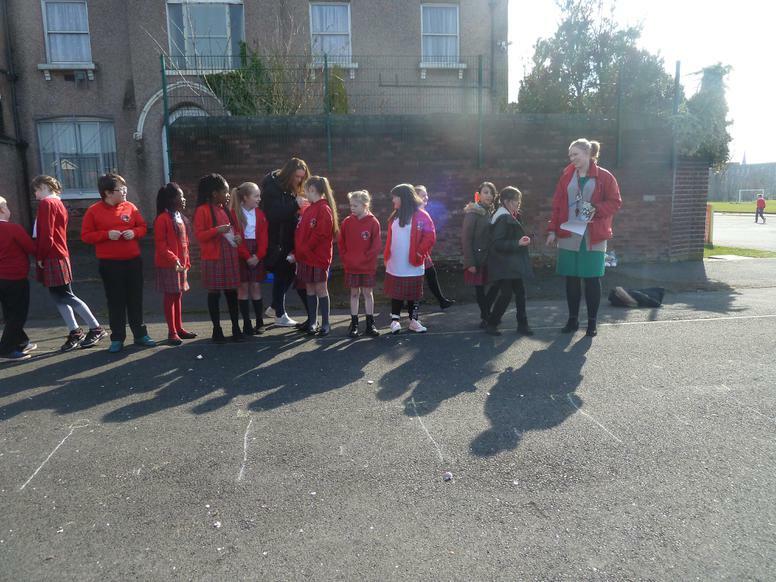 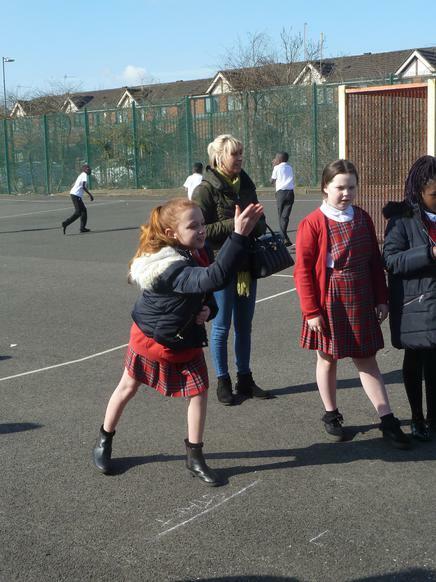 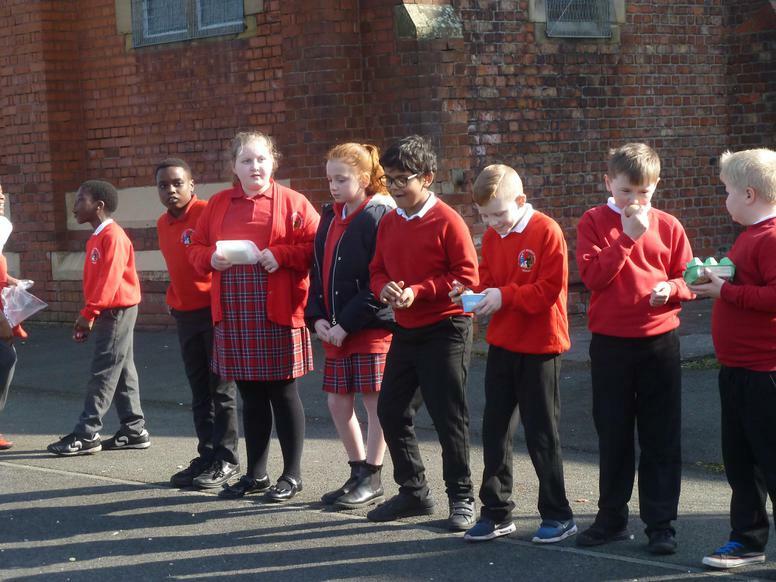 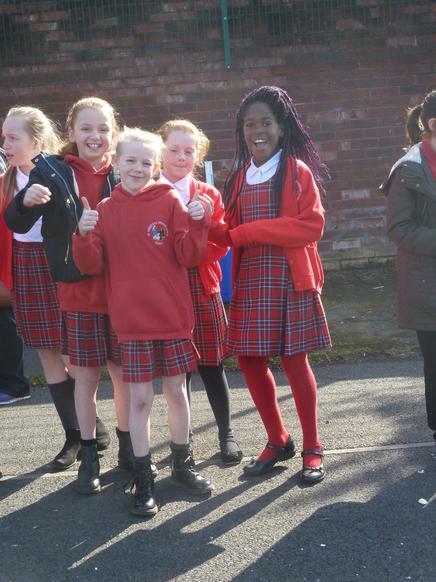 Egg rolling during Holy week is certainly a tradition at St Joseph's and this year is no exception. 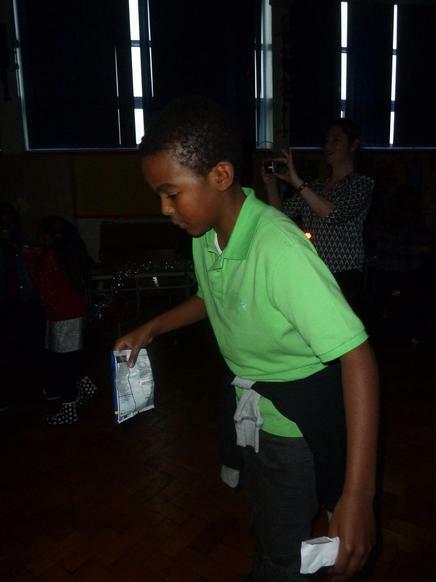 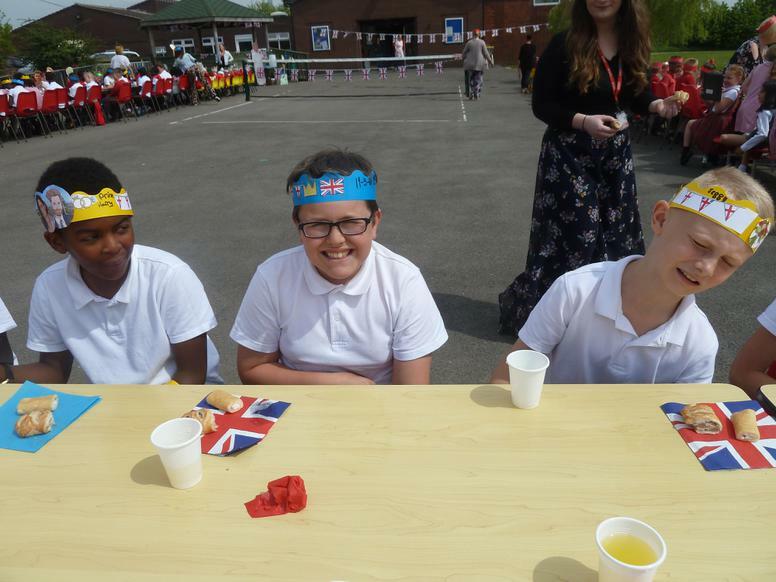 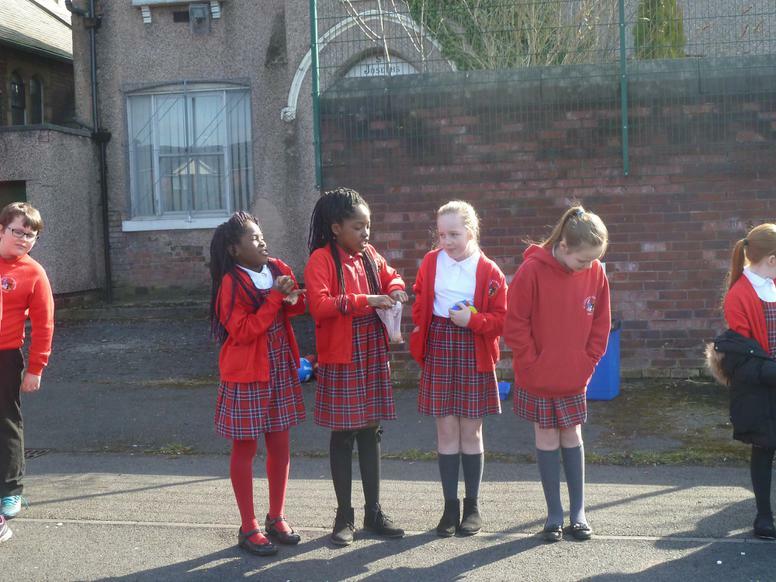 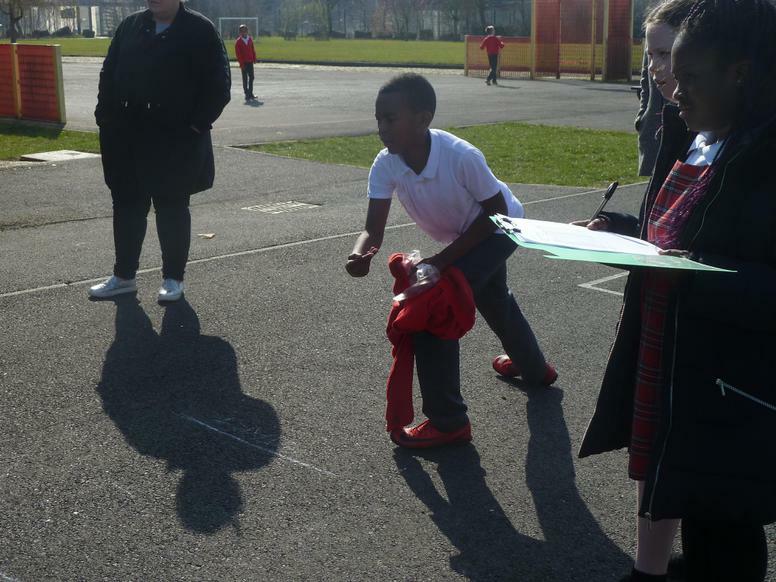 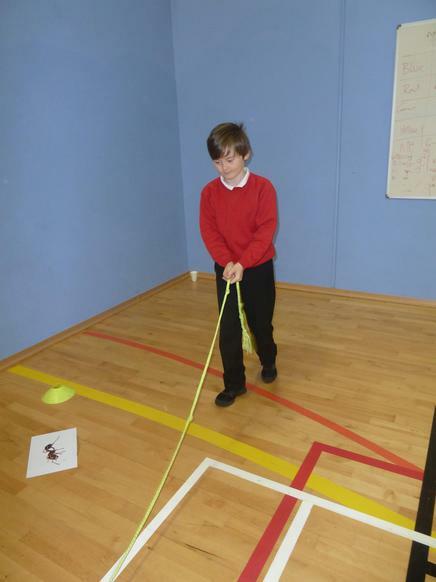 On Monday 26th March each class enjoyed competing to roll our hard boiled eggs the furthest. 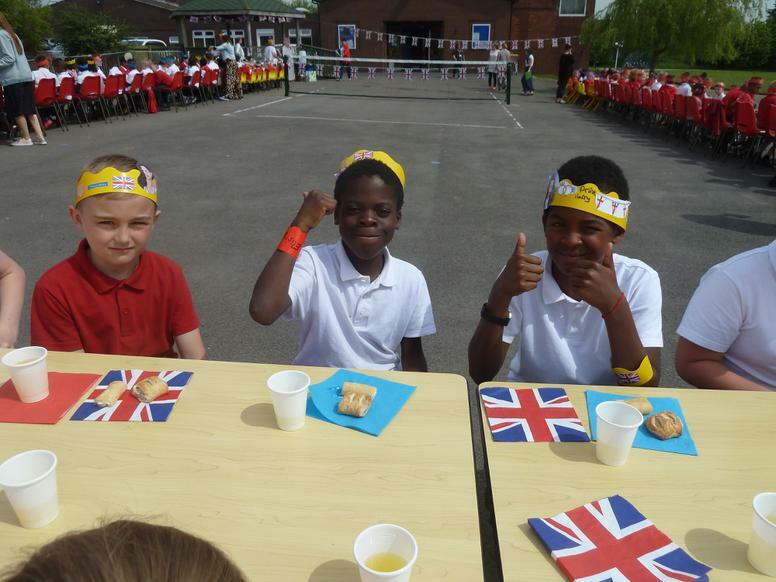 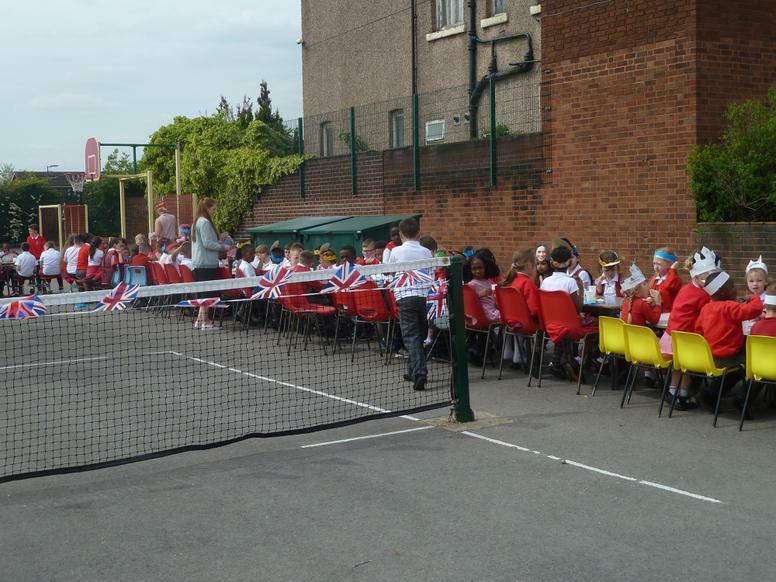 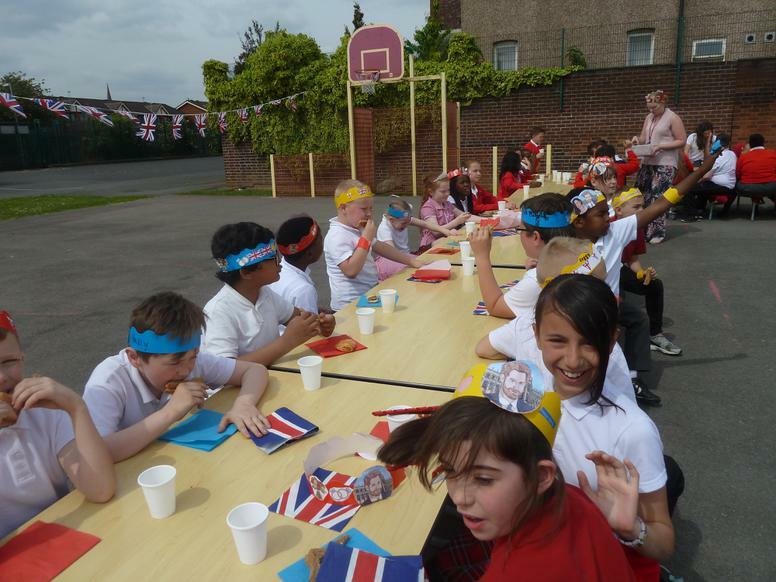 The event went ahead with good humour, much cheering and lots of encouragement from everyone. 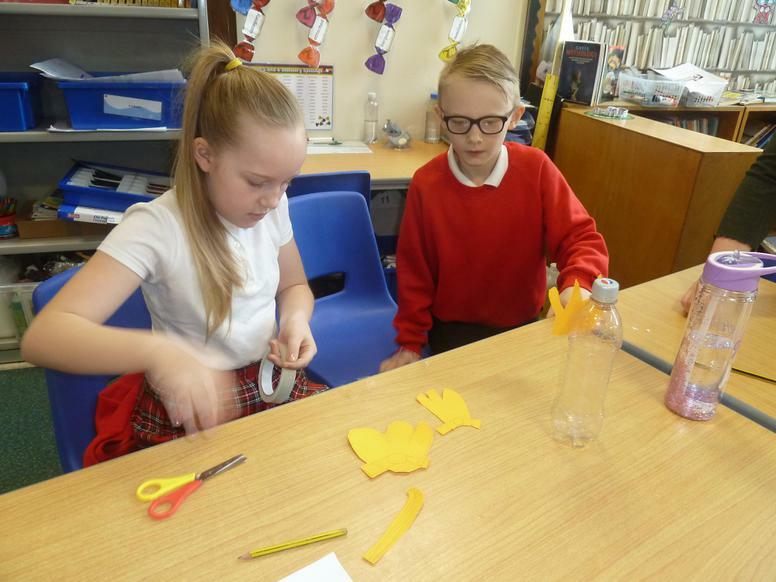 The rolling of eggs represents the rolling away of the stone from the tomb in which Jesus' body was placed after the crucifixion. 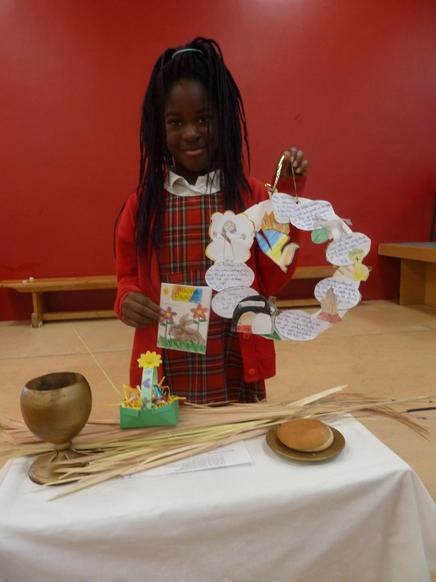 It symbolises new life in Jesus through the Resurrection. 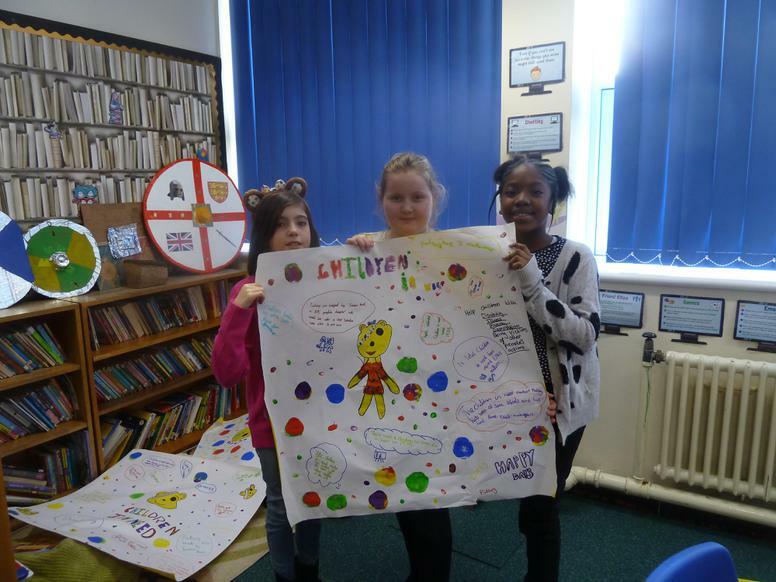 We've reached our Accelerated Reader target! 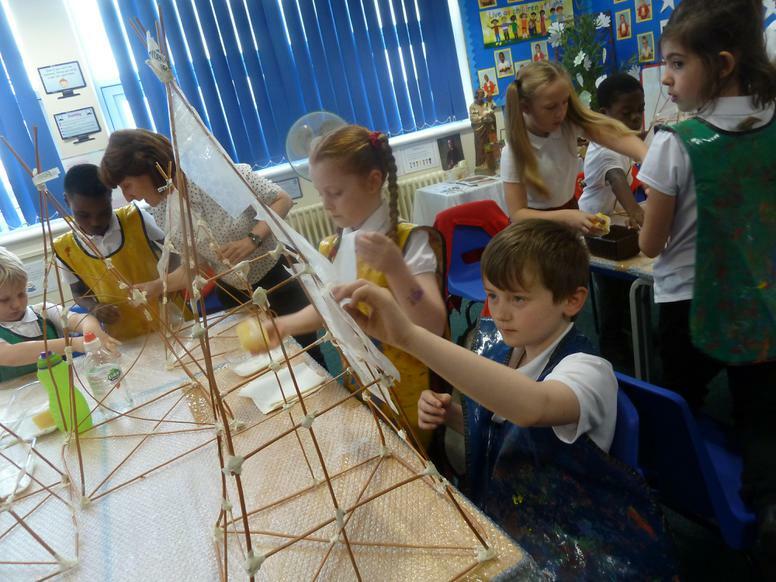 The activity involved art, design and science. 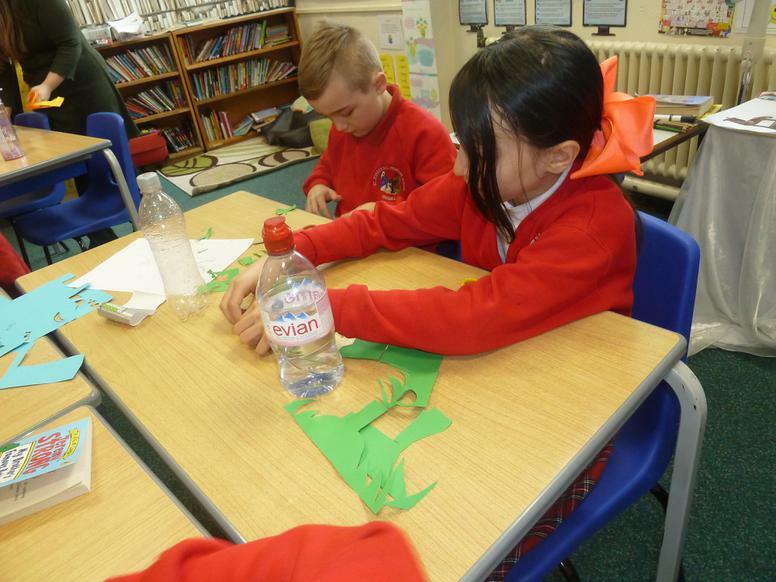 We started by exploring reversible and irreversible changes before working in pairs to create a monster using cardboard. 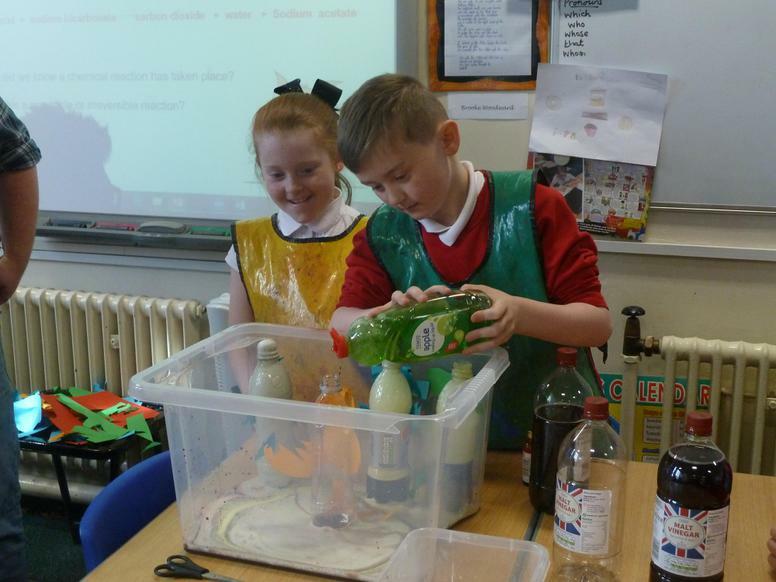 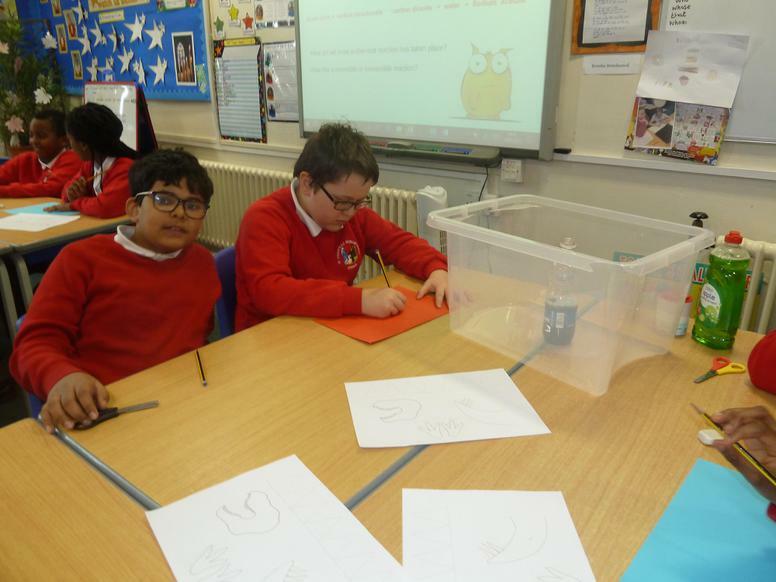 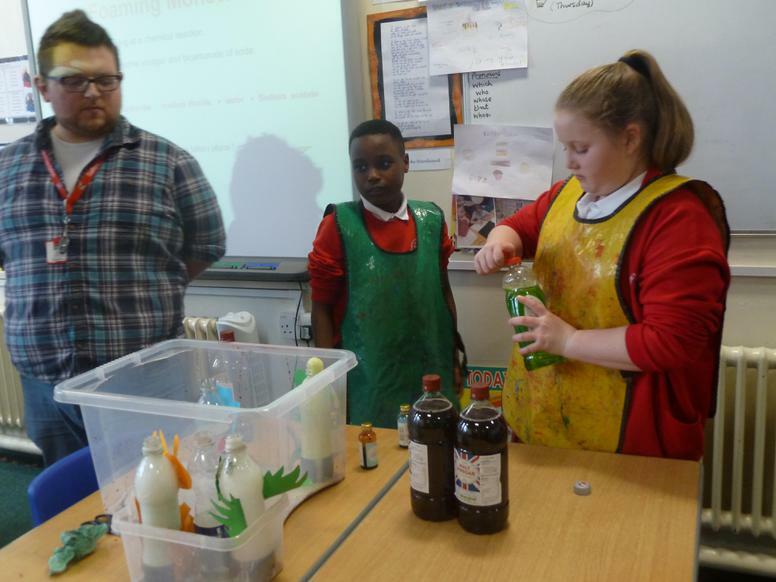 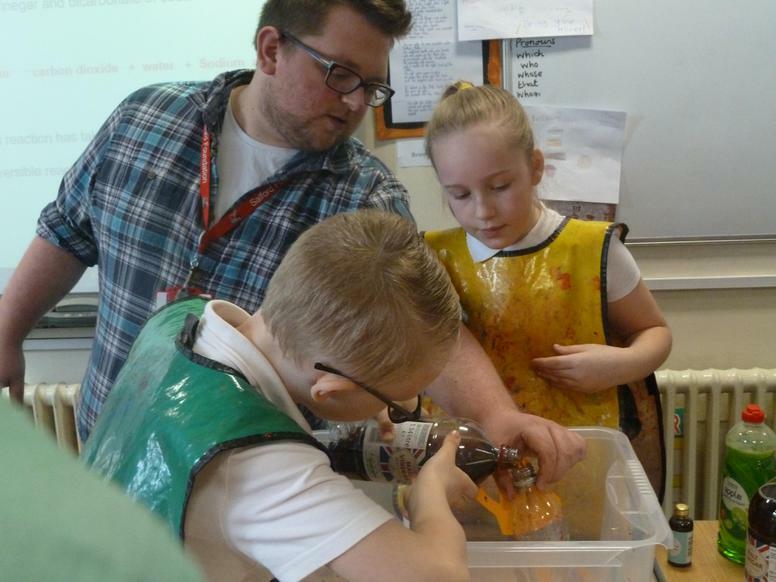 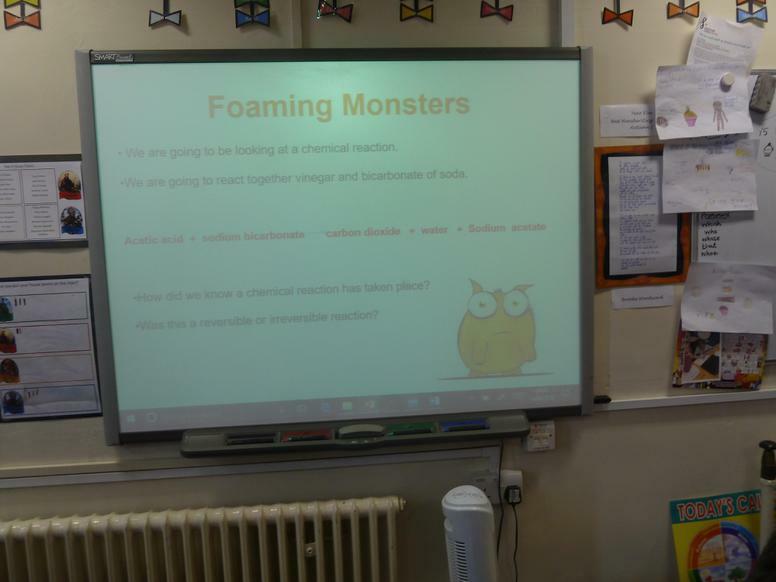 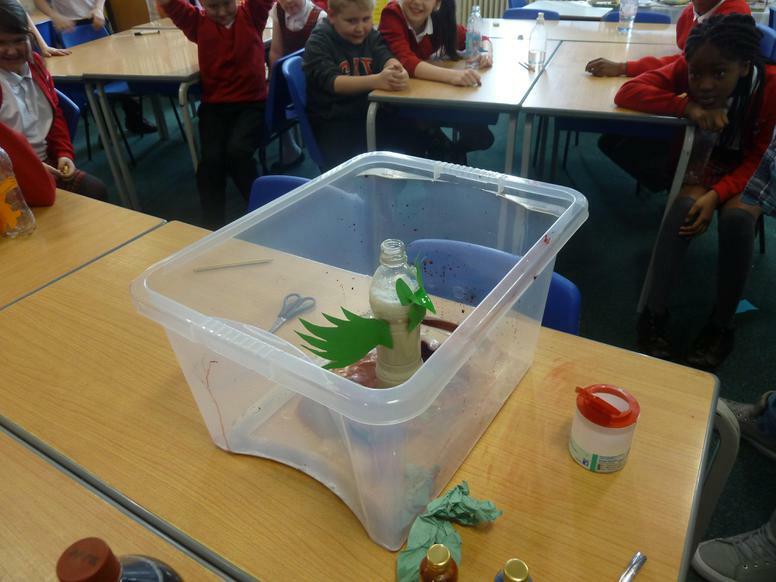 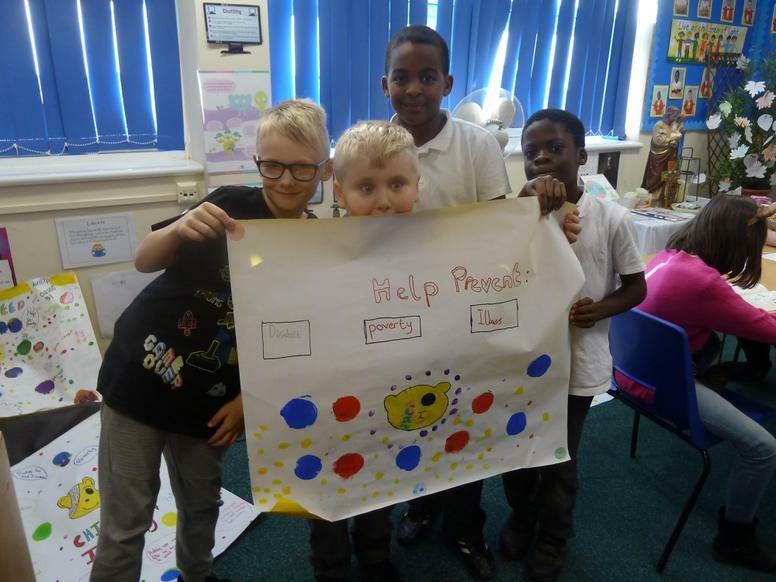 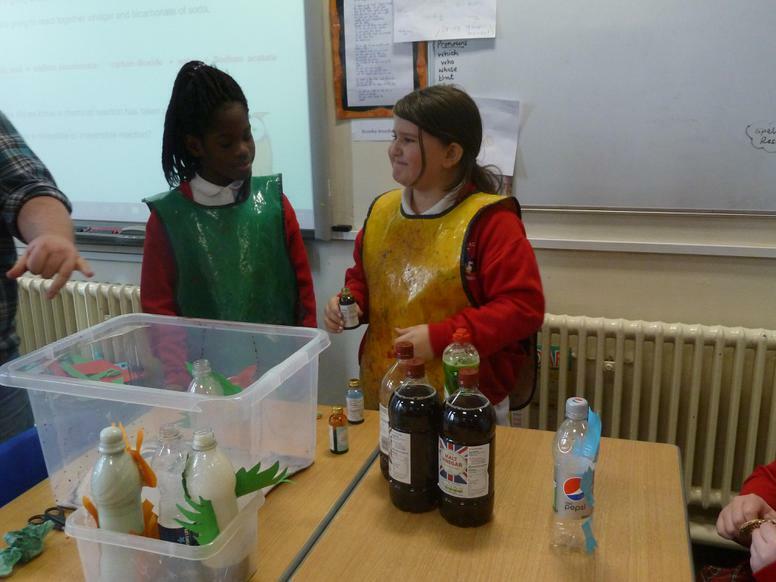 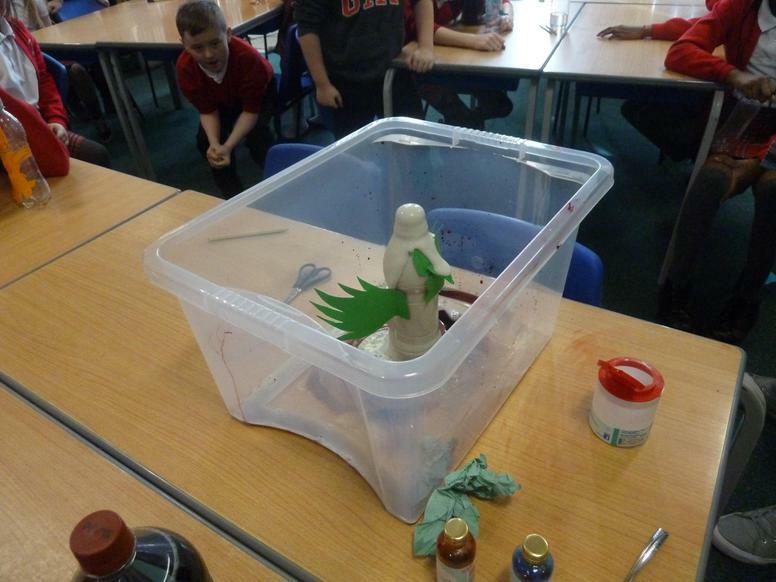 The children then used their knowledge of chemical reactions to make their monsters erupt with a burst of foam. 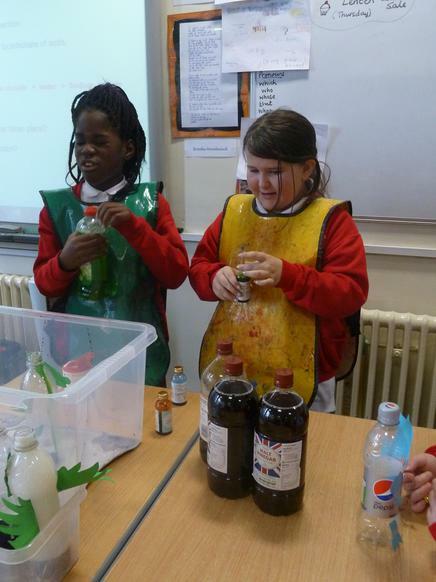 They mixed vinegar, bicarbonate of soda, washing up liquid and food colouring (to make it more exciting). 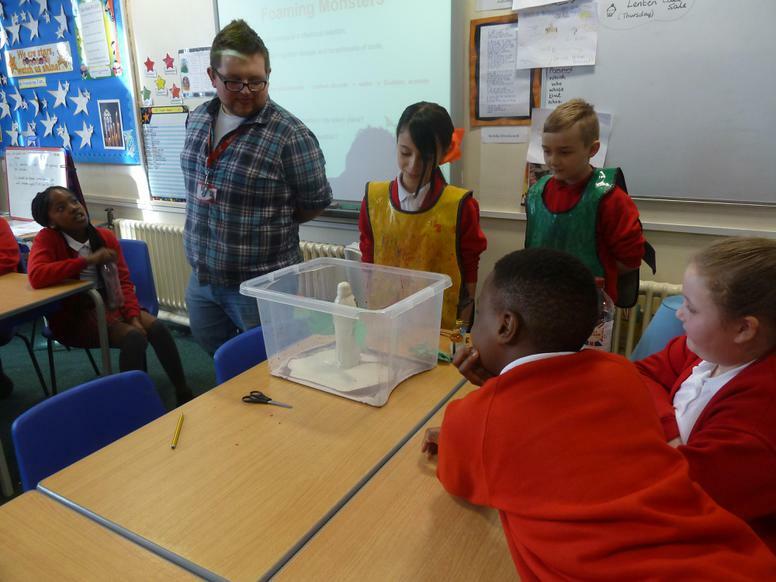 We would like to thank Mr King for this interesting and educational session. 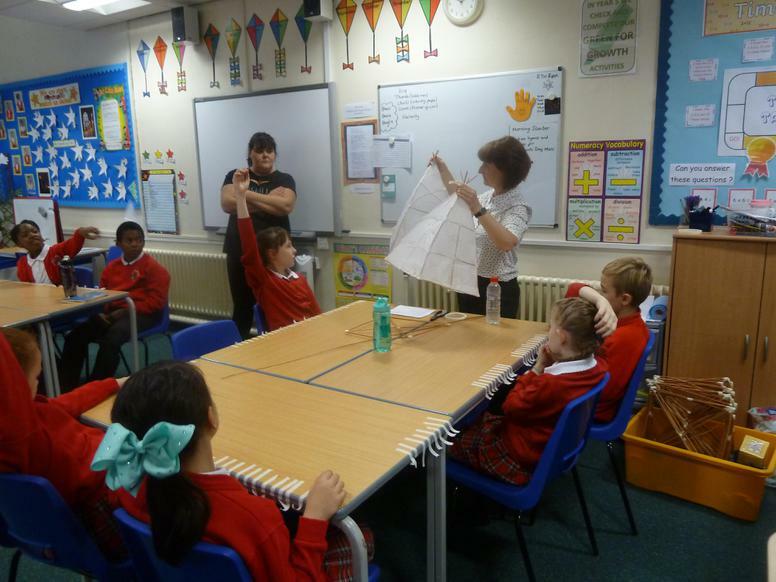 The whole class (and teachers) thoroughly enjoyed the morning and learnt so much. 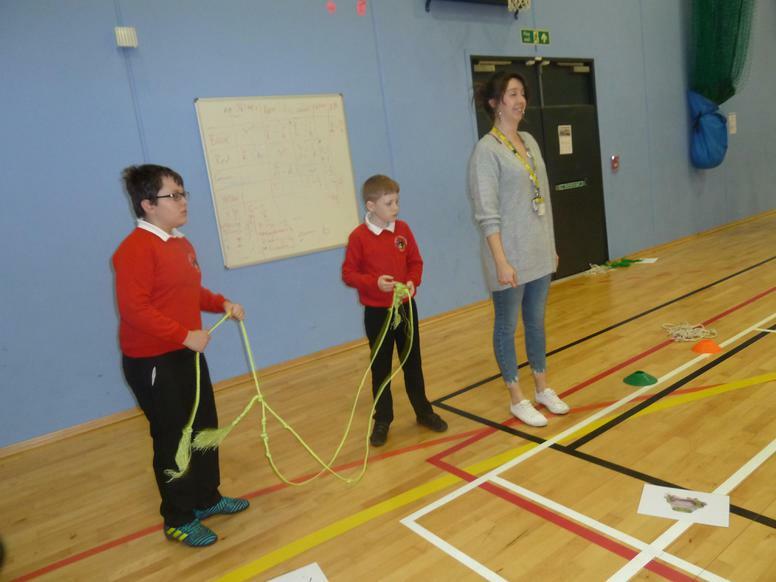 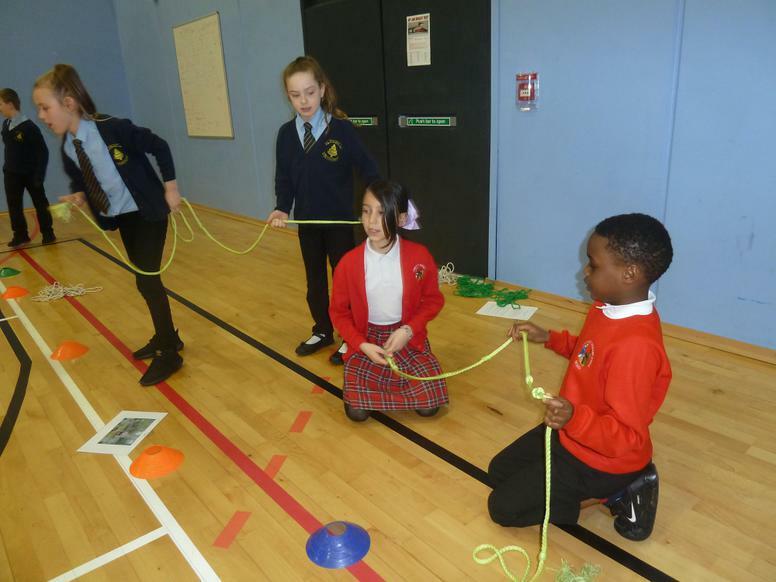 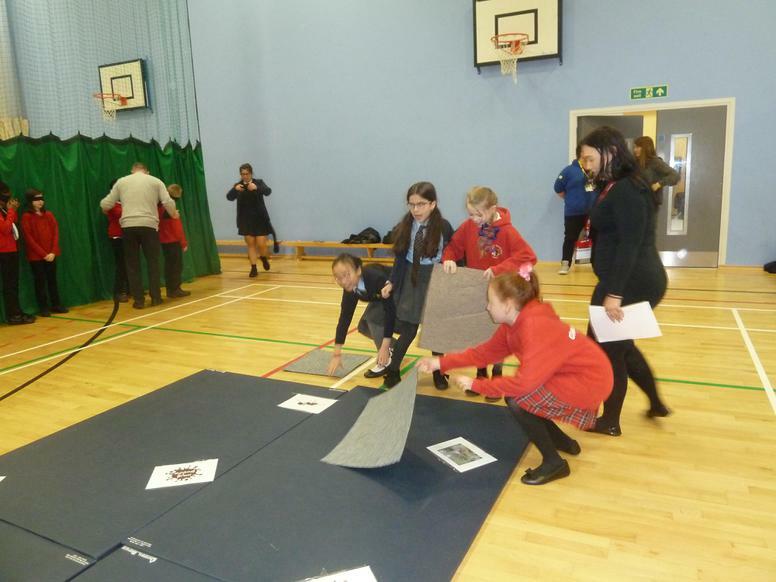 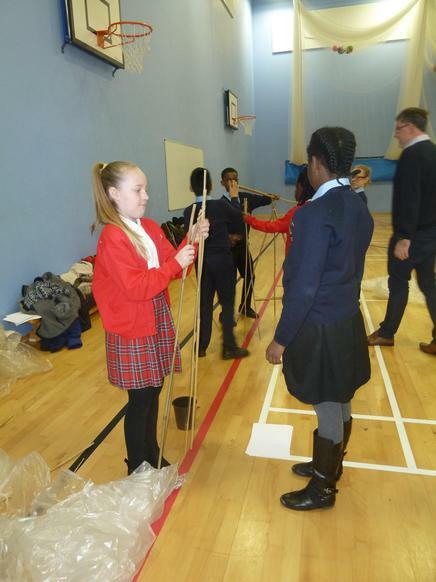 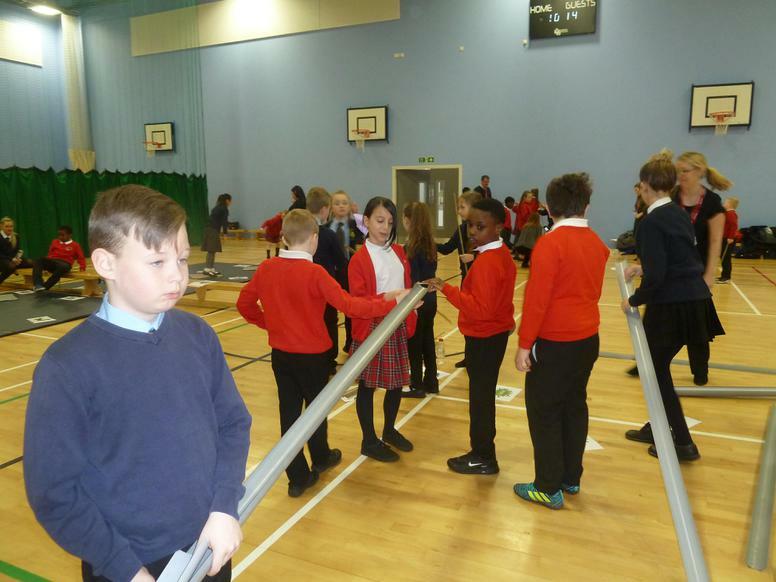 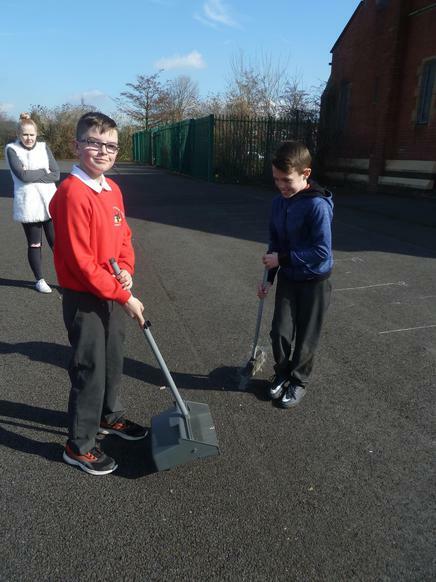 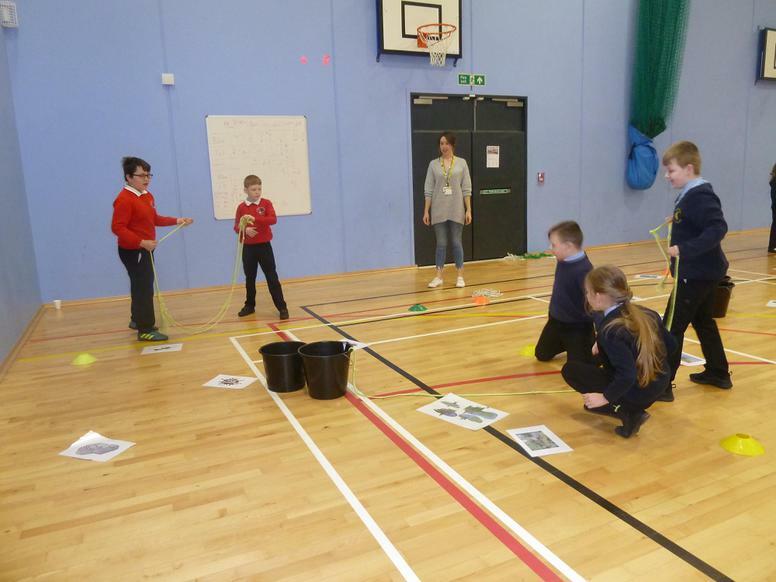 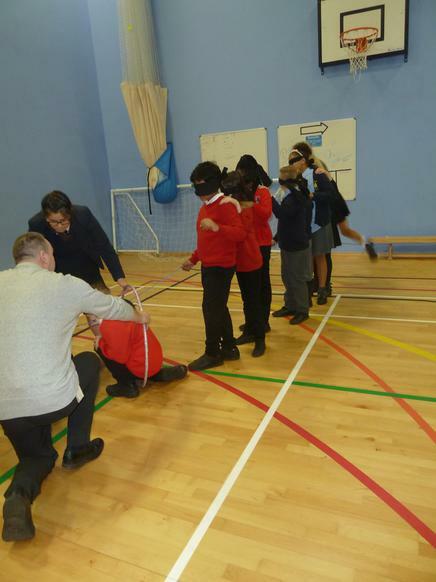 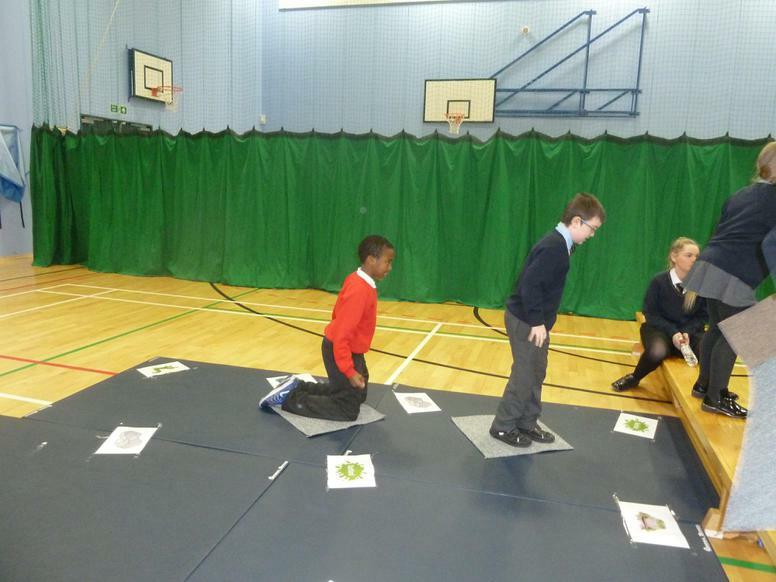 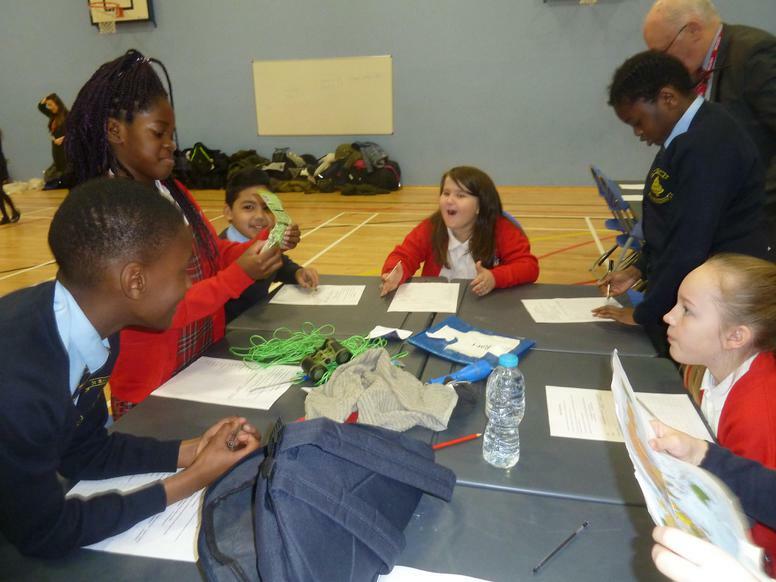 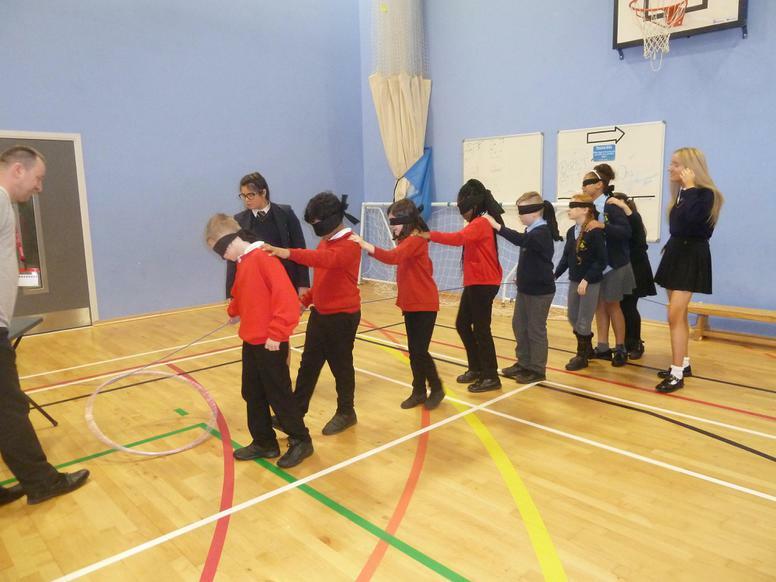 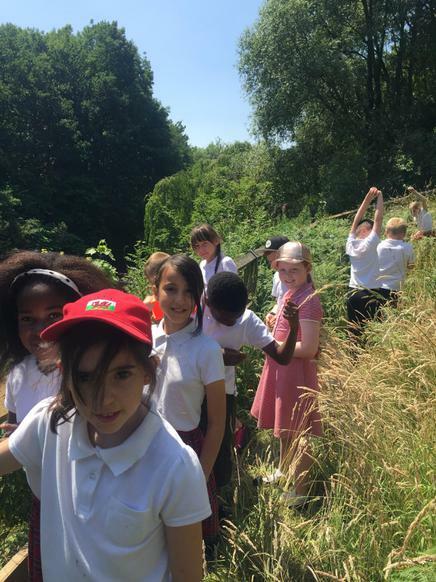 We were welcomed by staff and pupils from All Hallows and spent a fun filled morning working along side St Boniface Primary school children to complete an array of exciting and challenging activities . 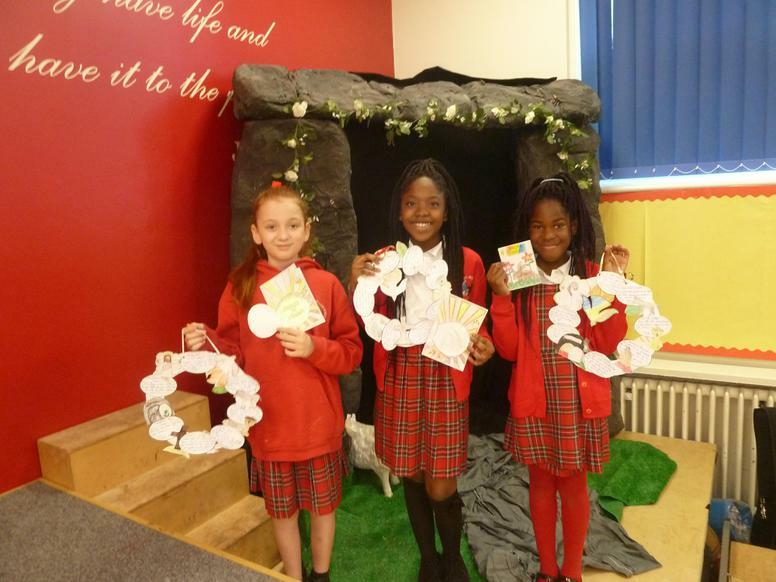 St Joseph's has always been a school with a special love of books and reading. 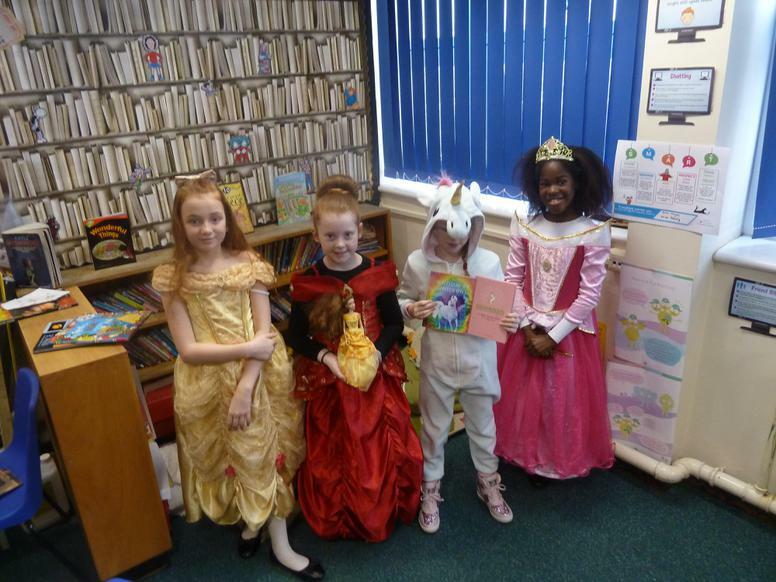 We know that books can make us FLY in all areas of our education. 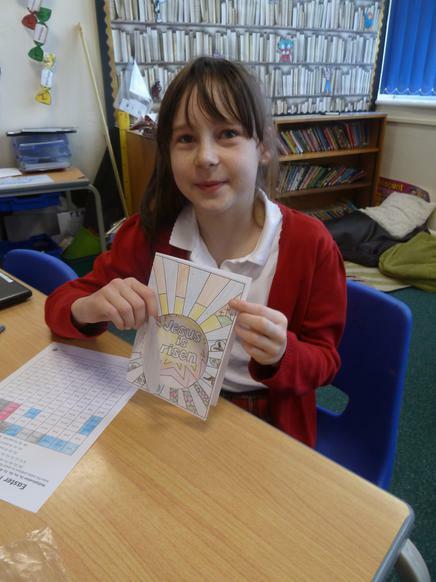 Our imaginations soar as we read. 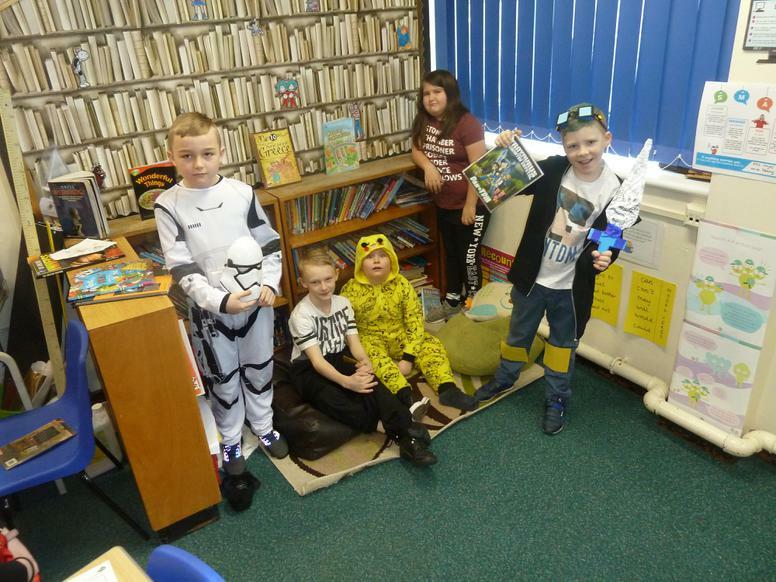 Books can take us anywhere! 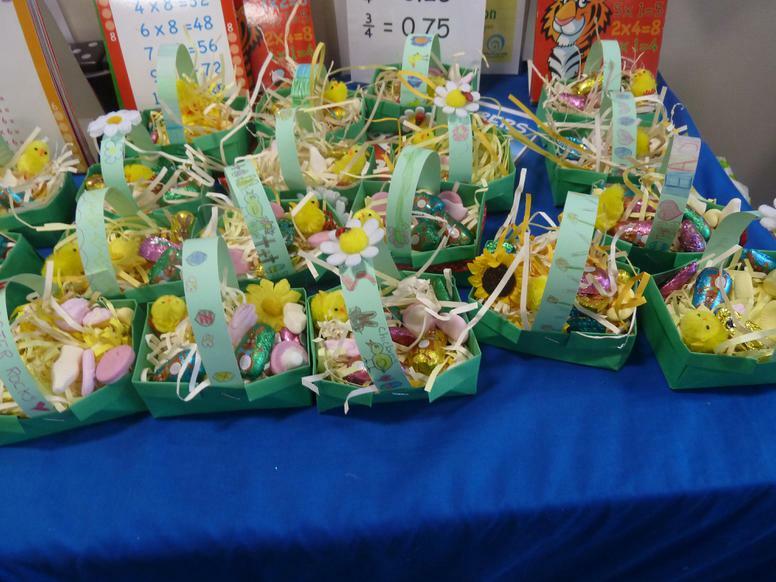 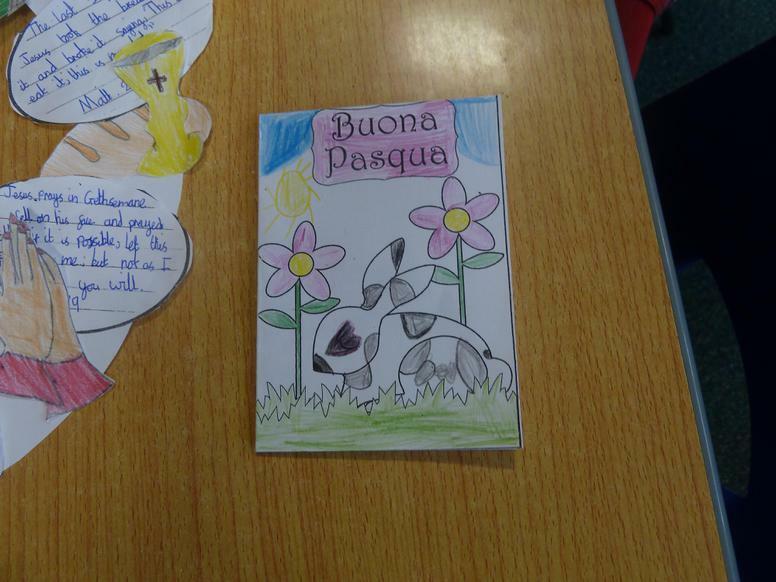 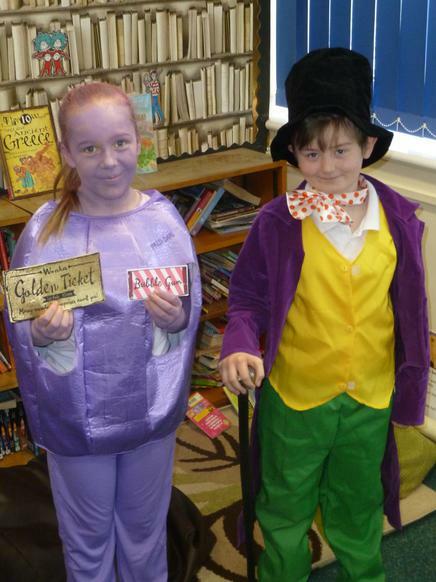 The competition involves creating a display in school that portrays how important reading is to the whole school. 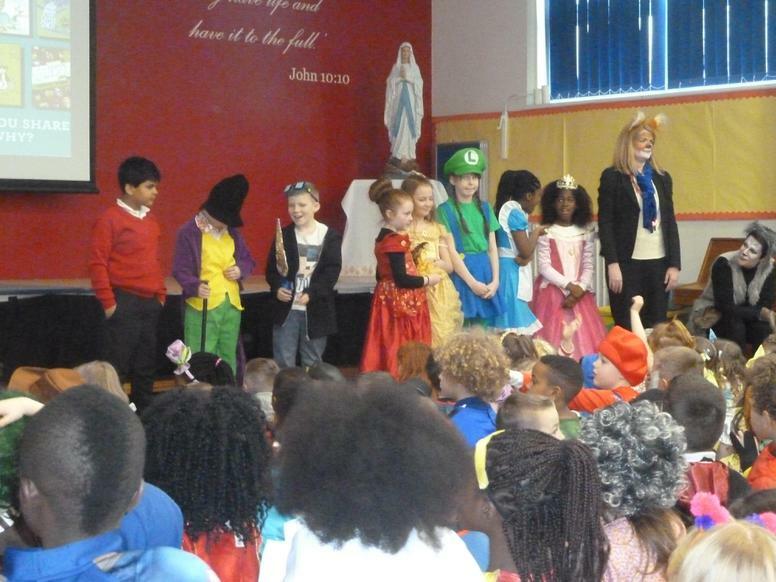 All three teams were confident, articulate and a credit to St Josephs. 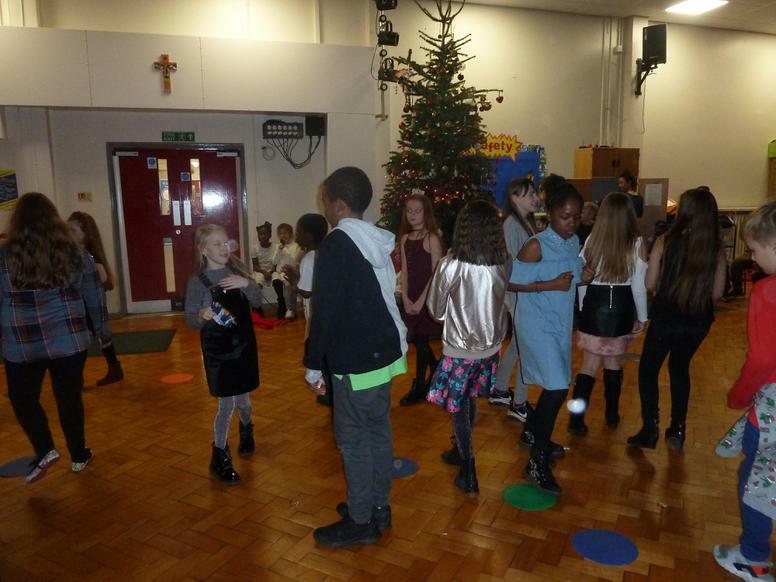 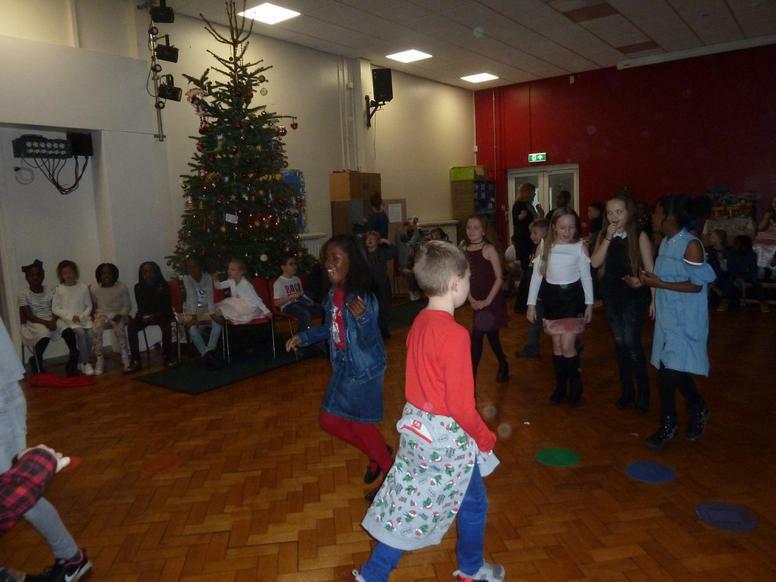 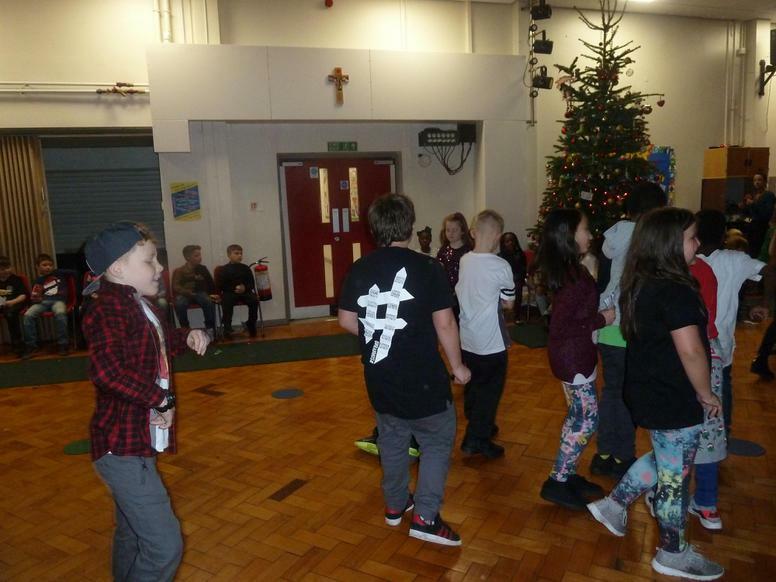 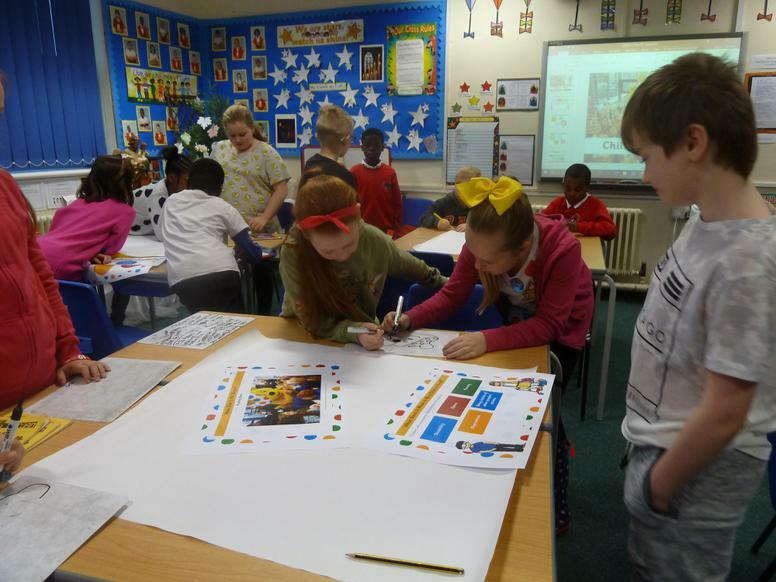 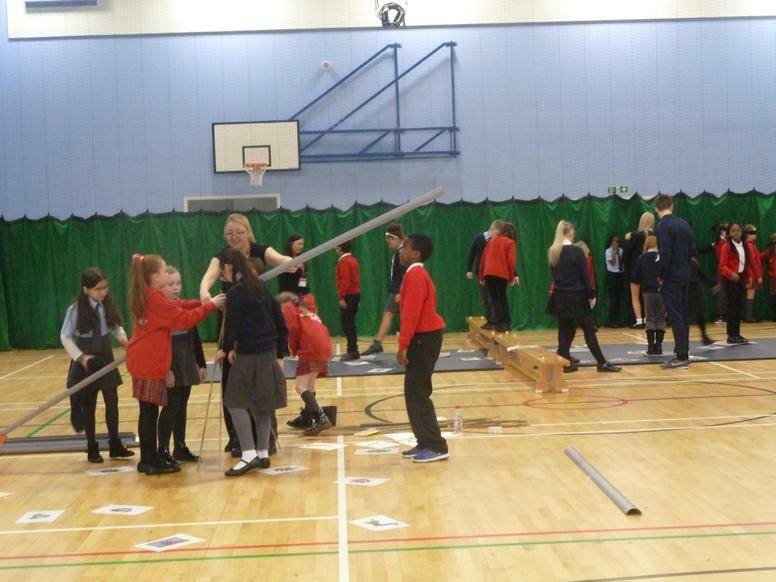 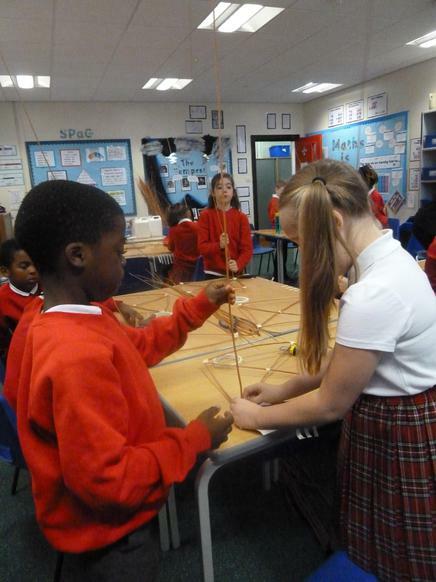 It was wonderful to see both year groups working together so successfully. 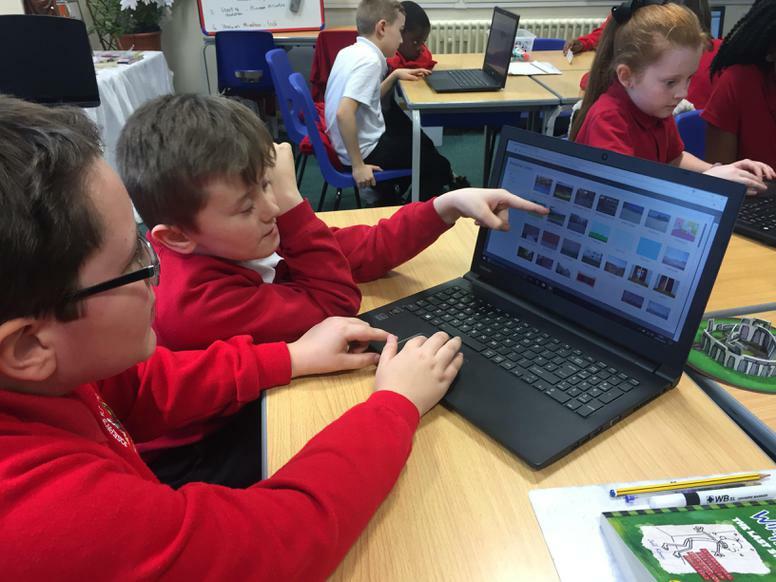 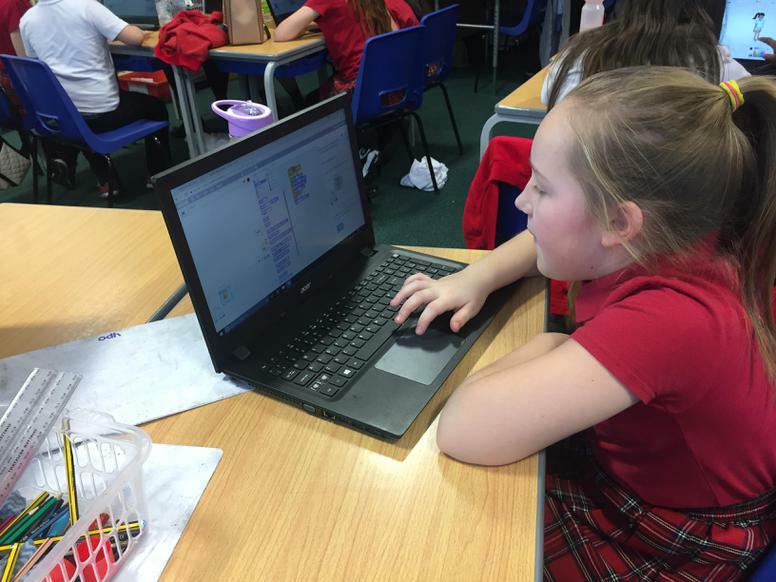 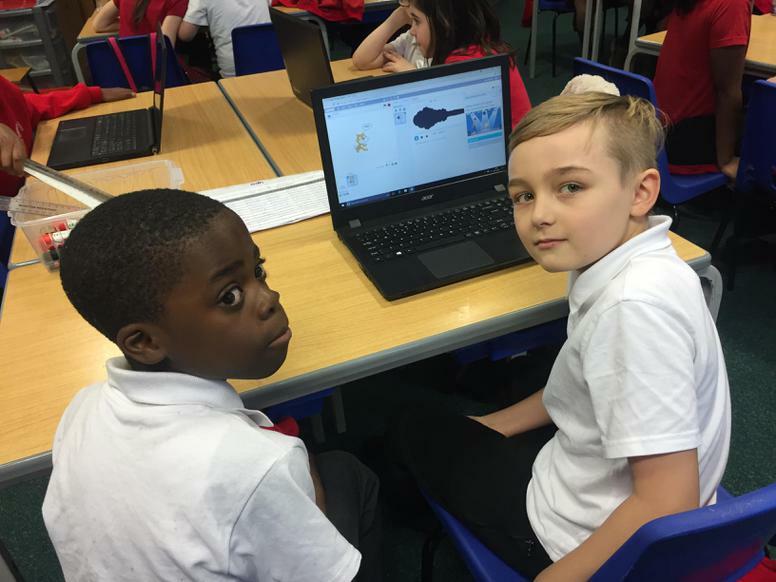 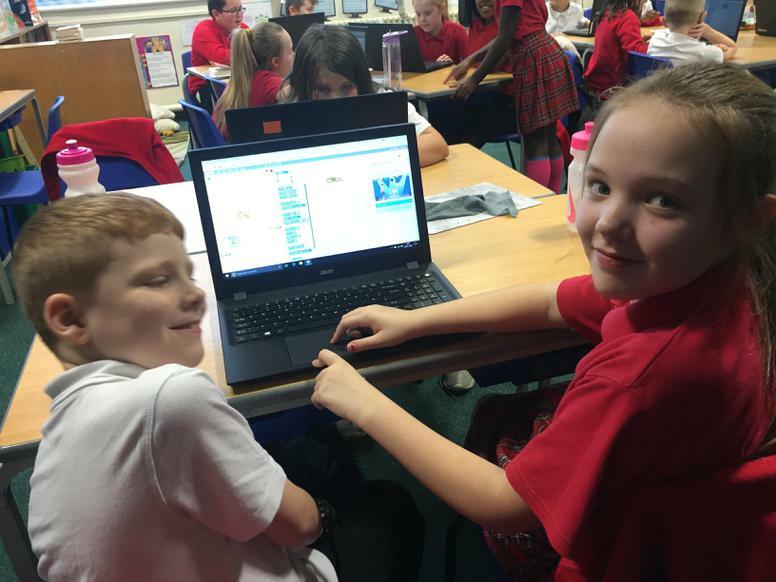 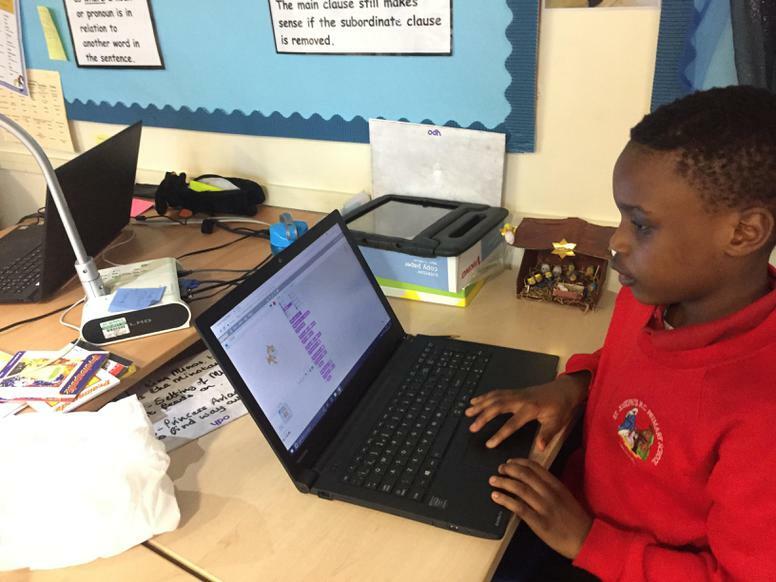 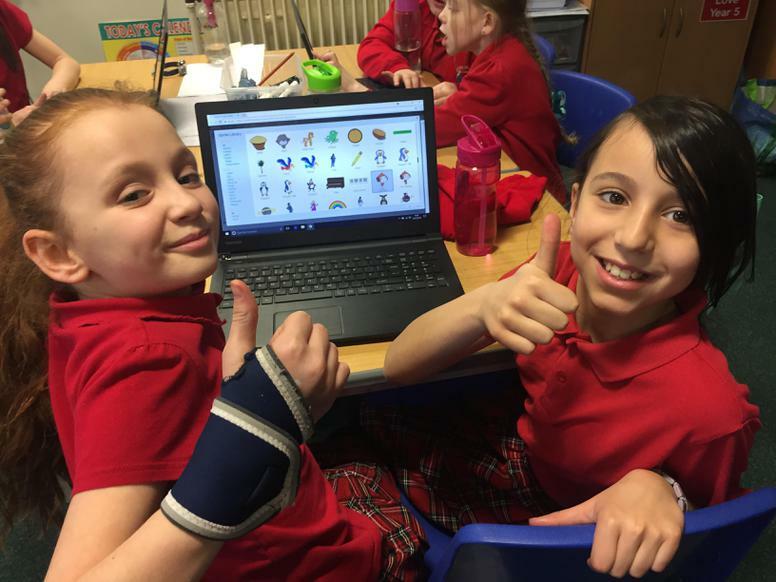 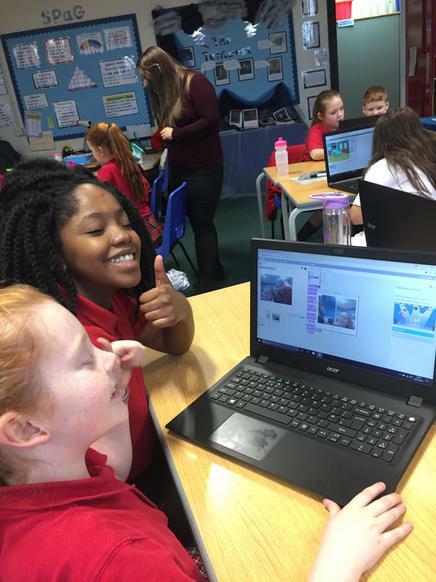 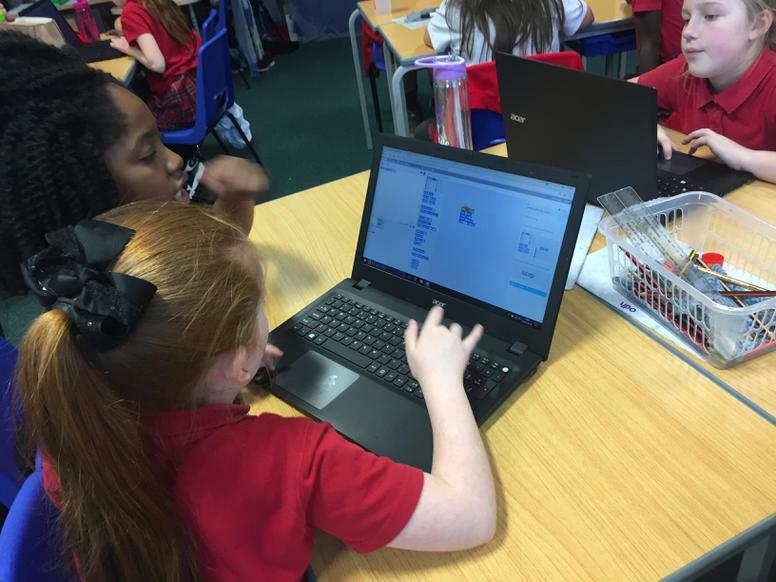 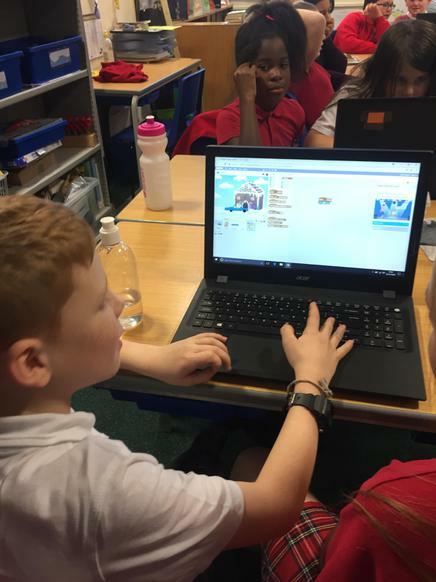 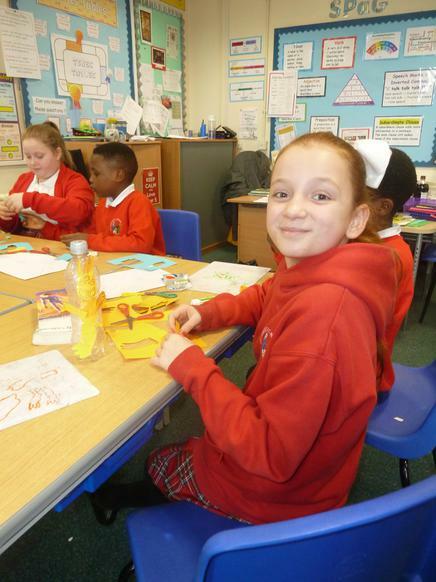 Year 5 have started 2018 with enthusiasm and are working hard in all subjects. 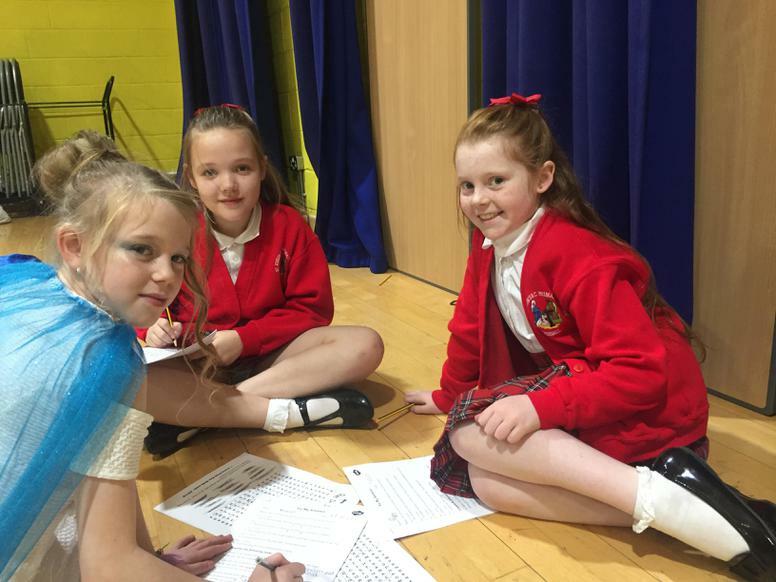 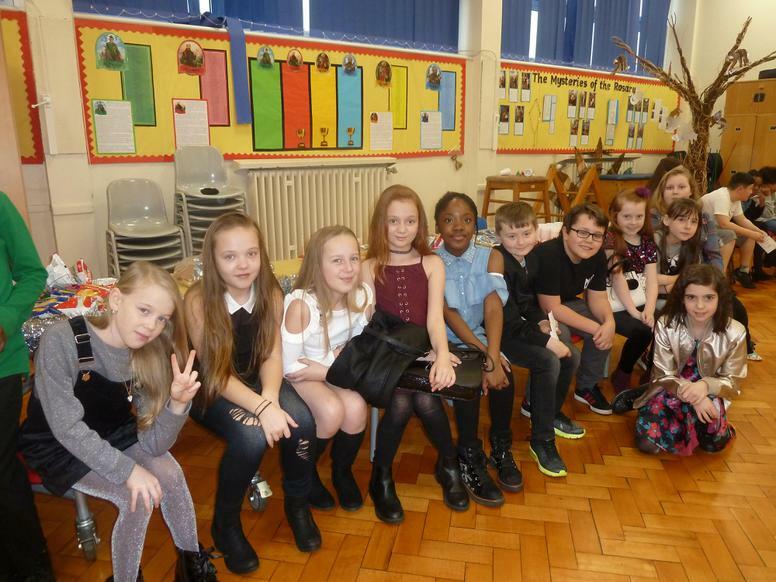 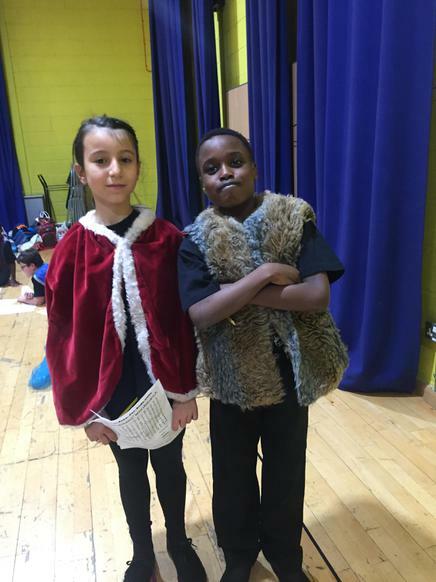 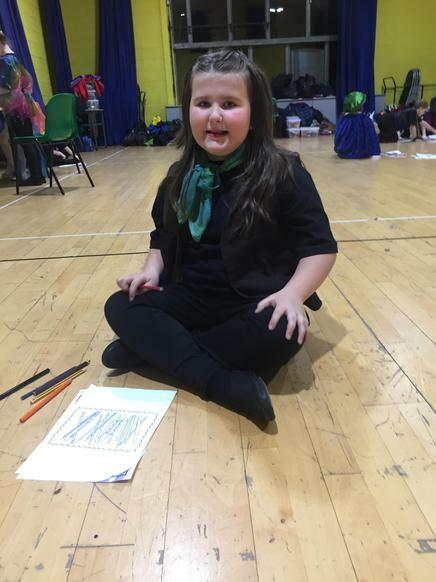 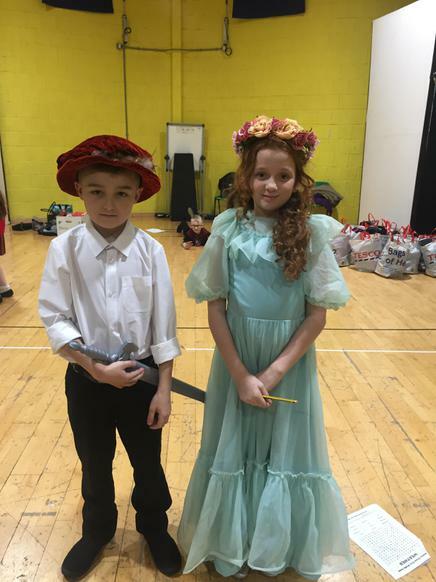 In year 5 the whole class has been working with passion, enthusiasm and genuine hard work in order to be part of the world's largest youth drama festival. 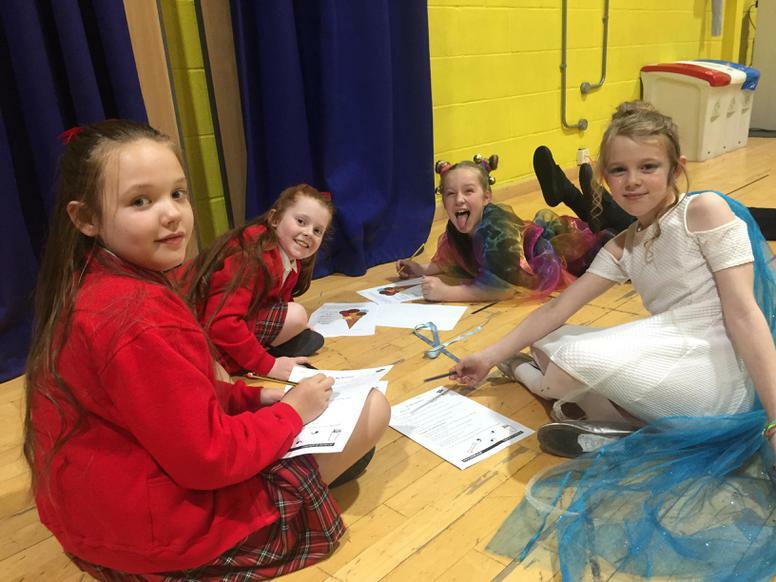 Closely studying Shakespeare's 'The Tempest' has provided a deep understanding of characters and their interactions within the play. 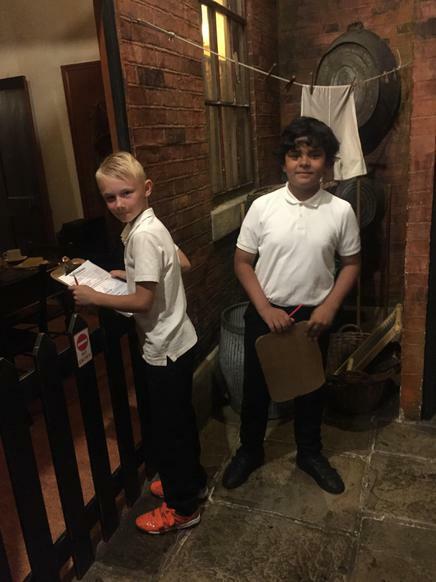 The plot, although complex and challenging has provided an exciting world for us to explore. 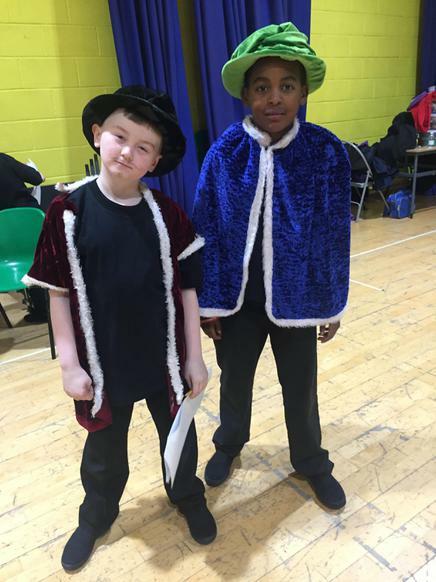 Emotions including power, revenge, love and forgiveness are all woven into Shakespeare's writing and we have joyfully unravelled them all in our English lessons and discussed their impact on lives in RE and SMSC. 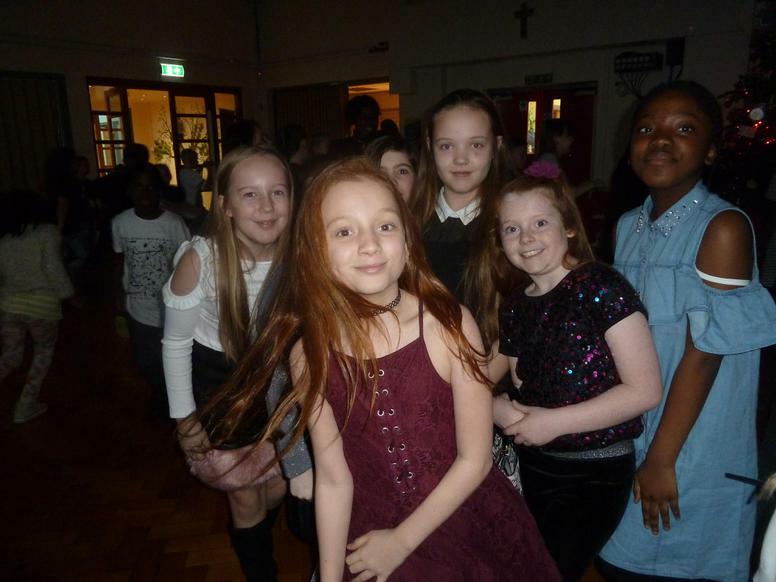 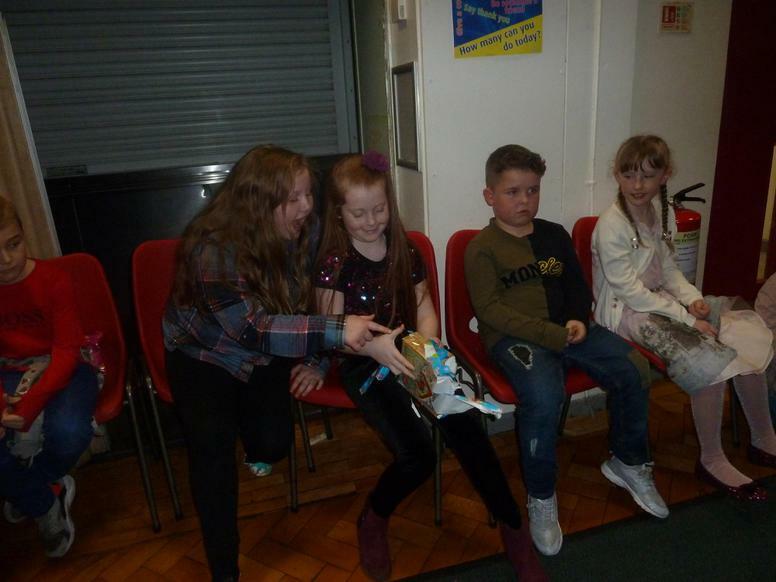 On Friday evening the culmination of all this hard work was celebrated at the Contact theatre in front of a huge audience. 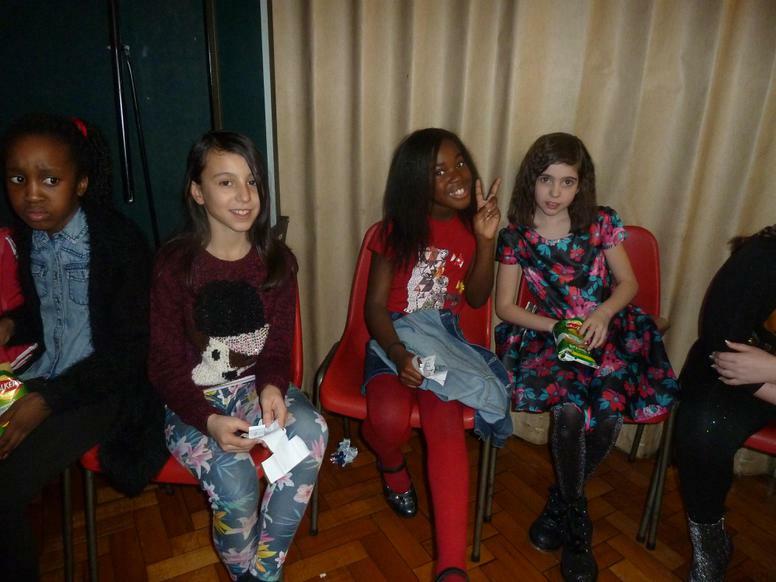 Backstage, waiting to perform at the Contact Theatre - exciting! 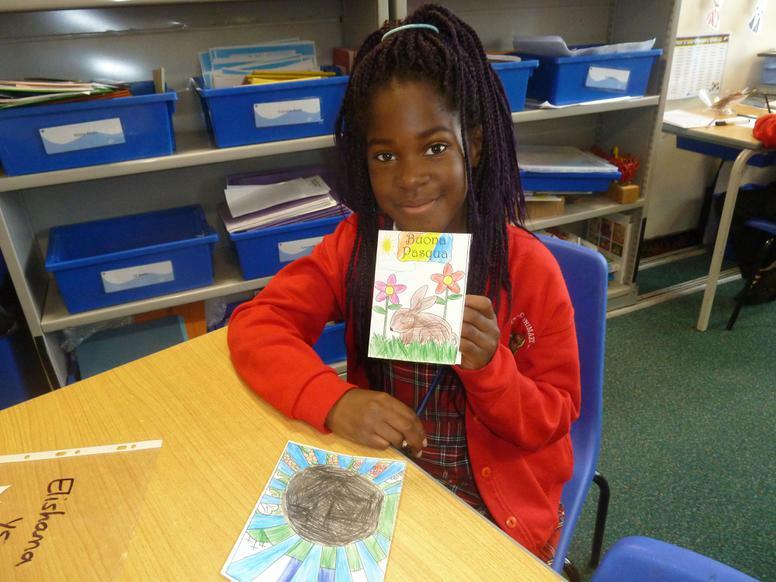 As we begin the second half of the Autumn term we look forward to the busy weeks ahead. 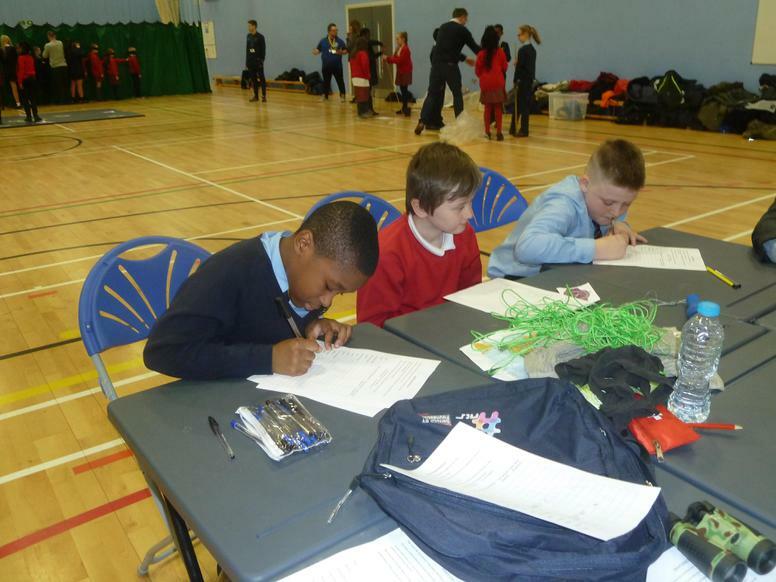 'Debate Mate' at Manchester University. 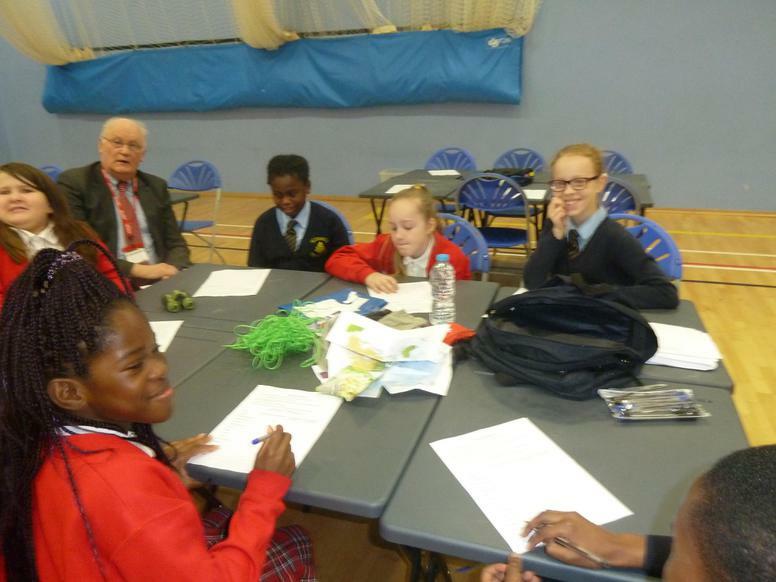 The debating club begins in school on Wednesday 15th November. 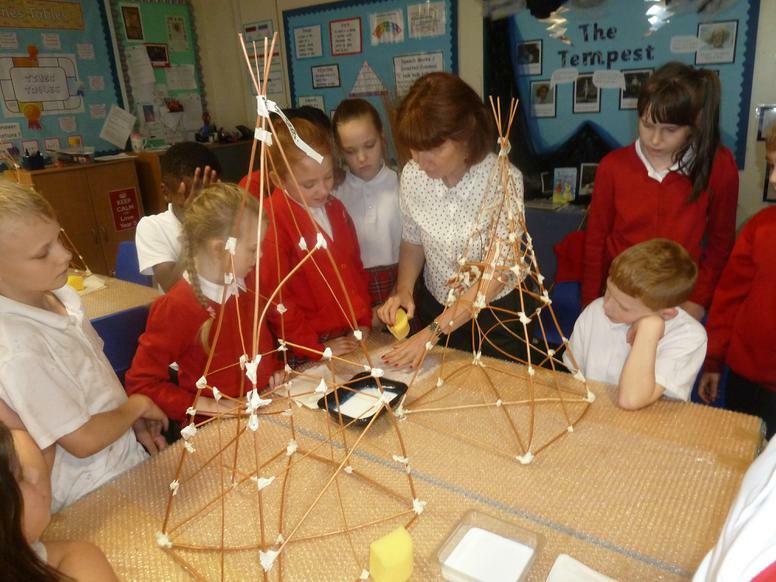 This is an exciting, challenging opportunity to learn a skill that will benefit pupils now and in the future. 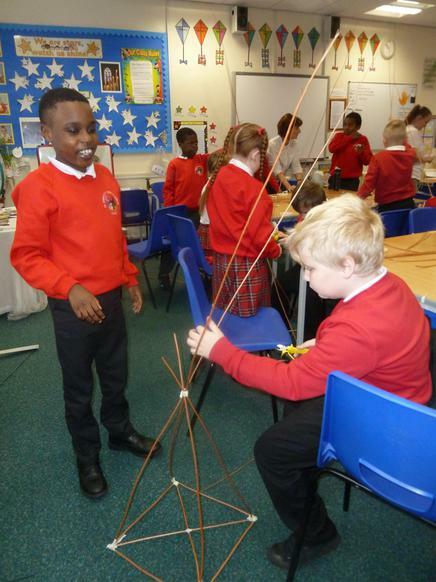 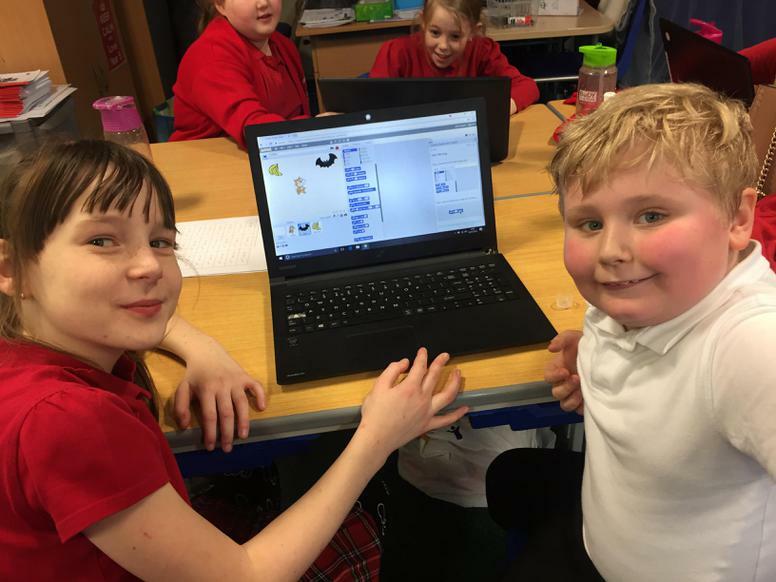 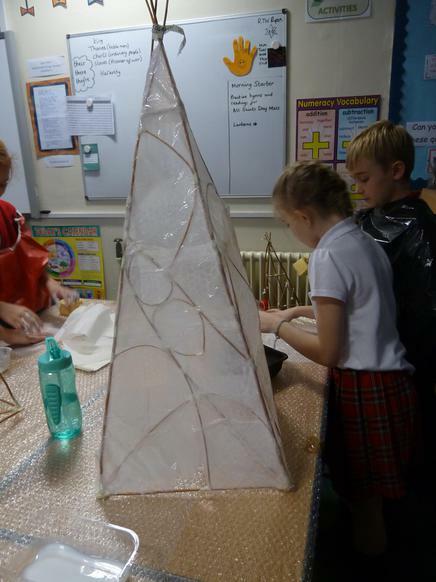 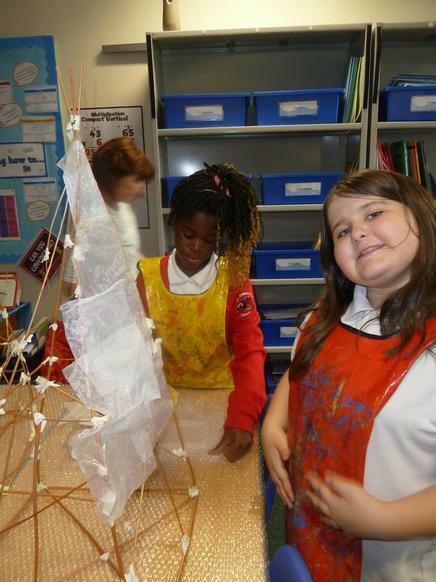 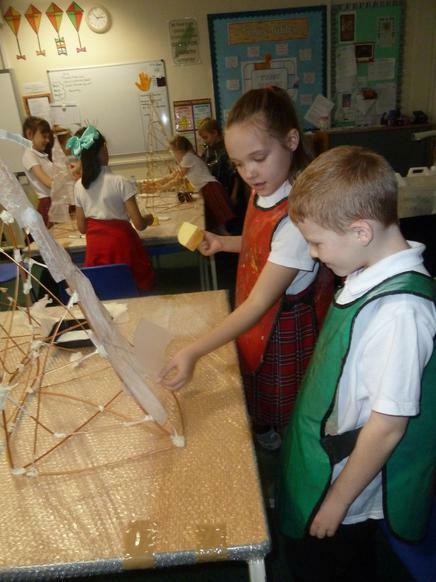 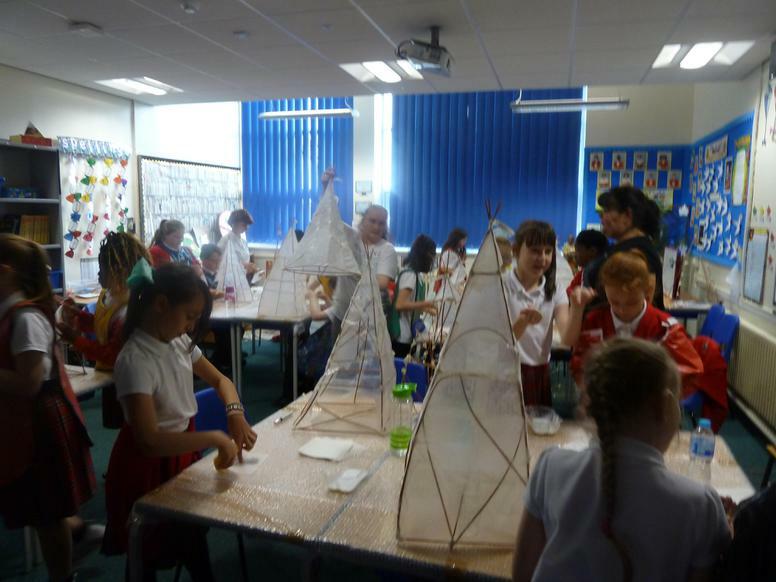 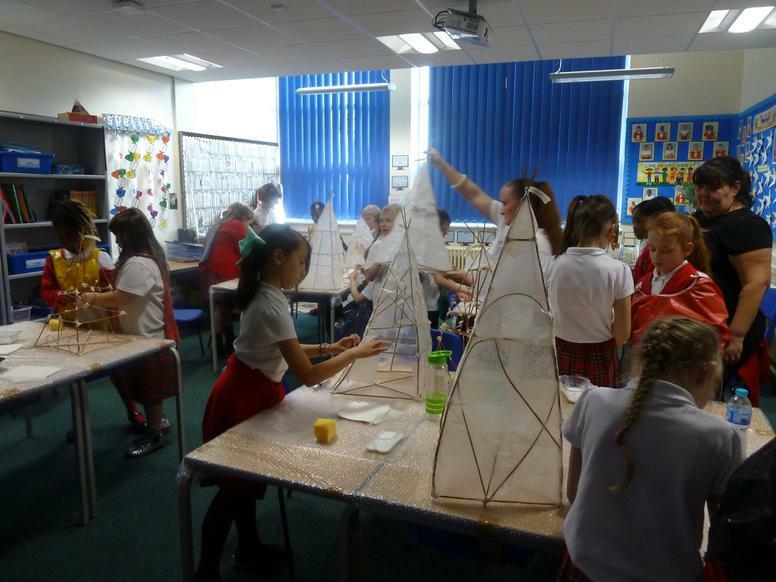 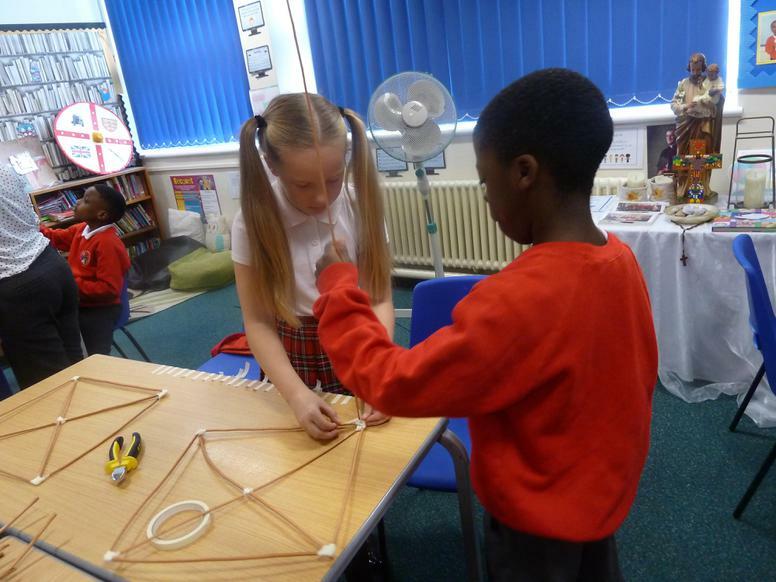 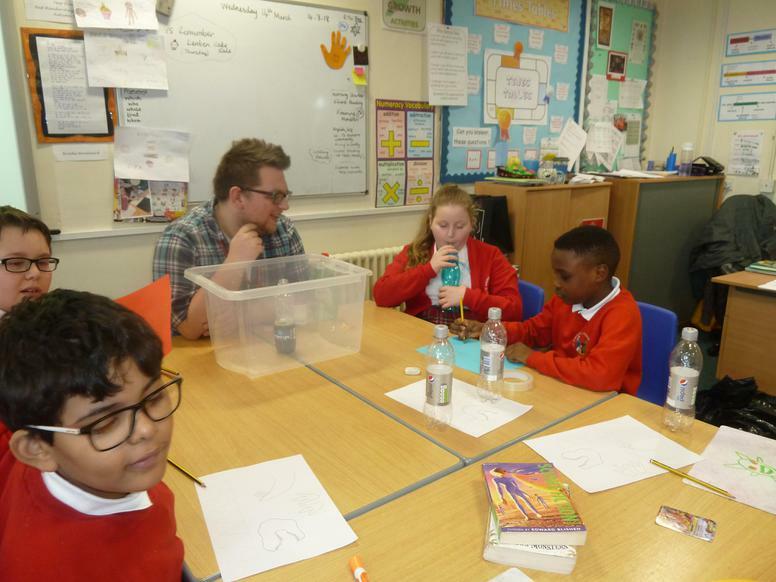 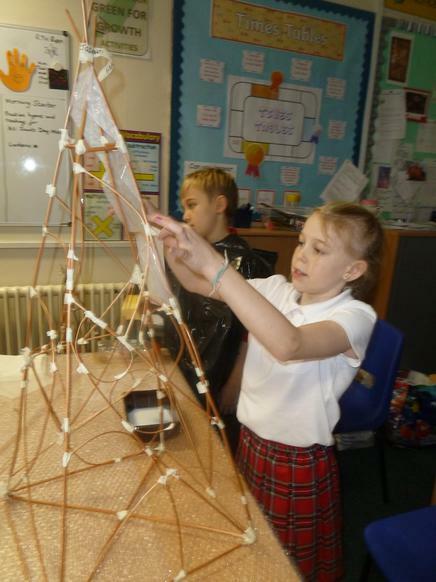 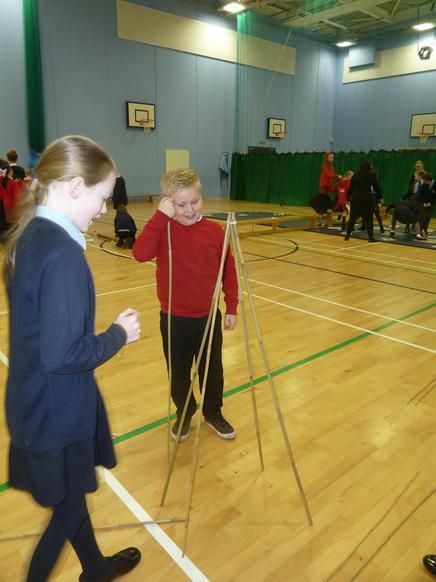 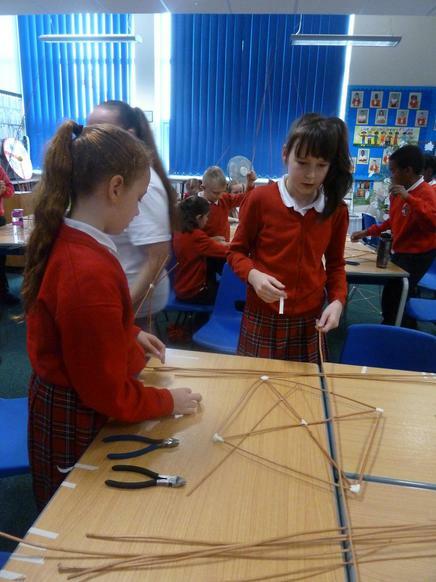 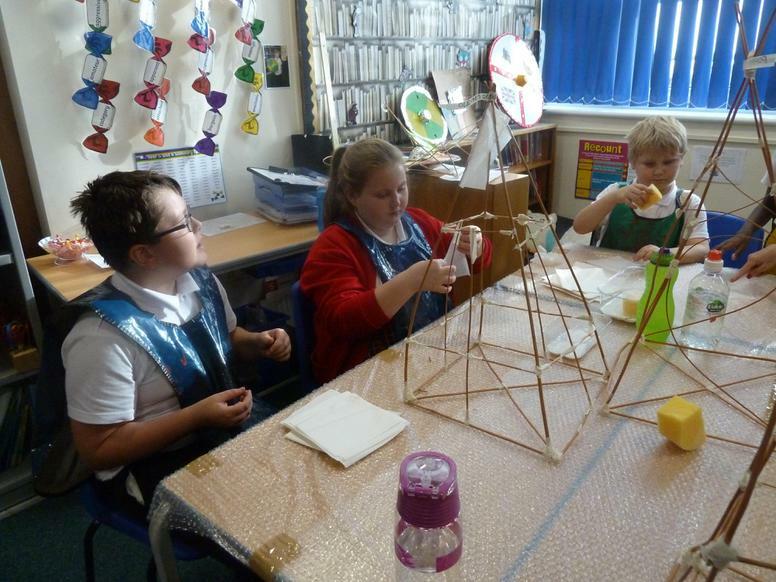 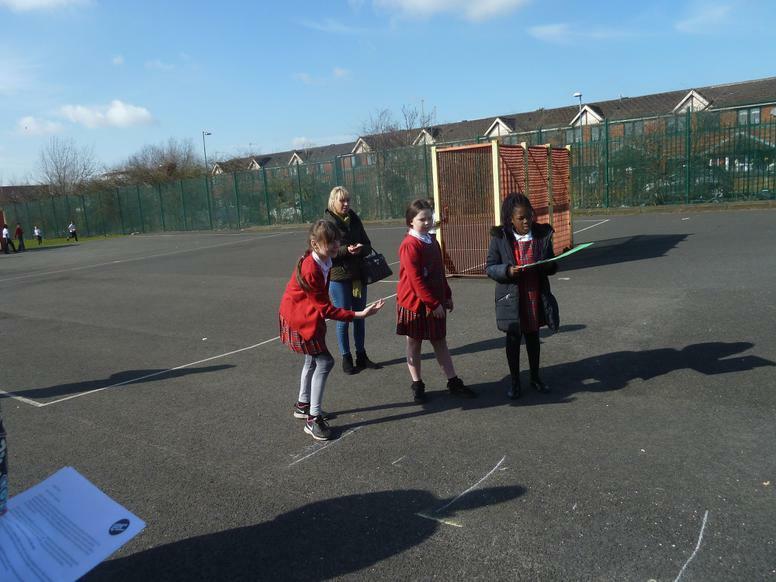 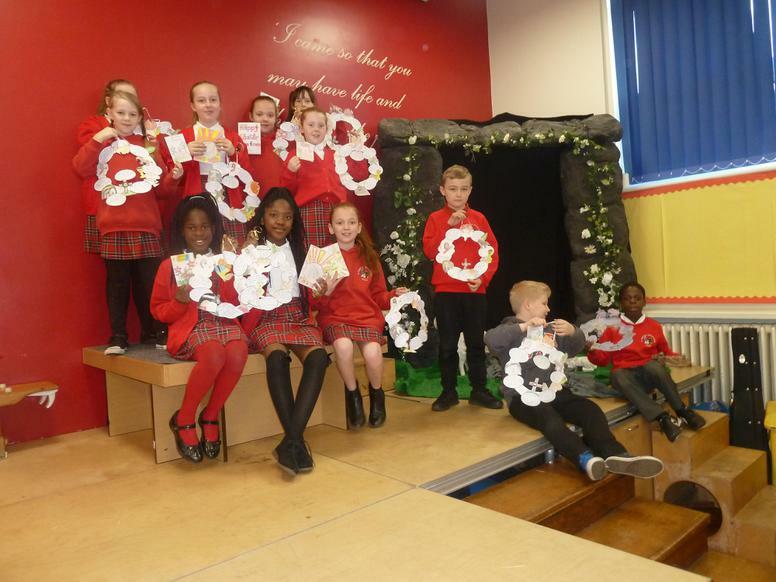 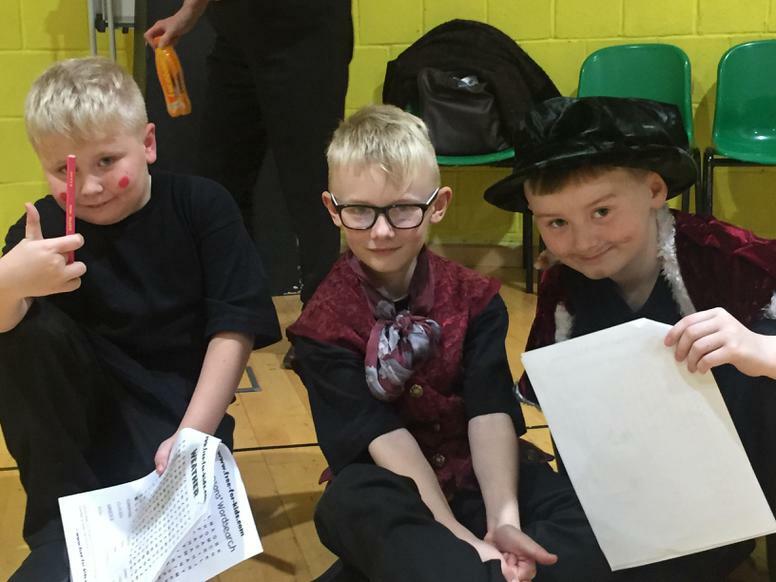 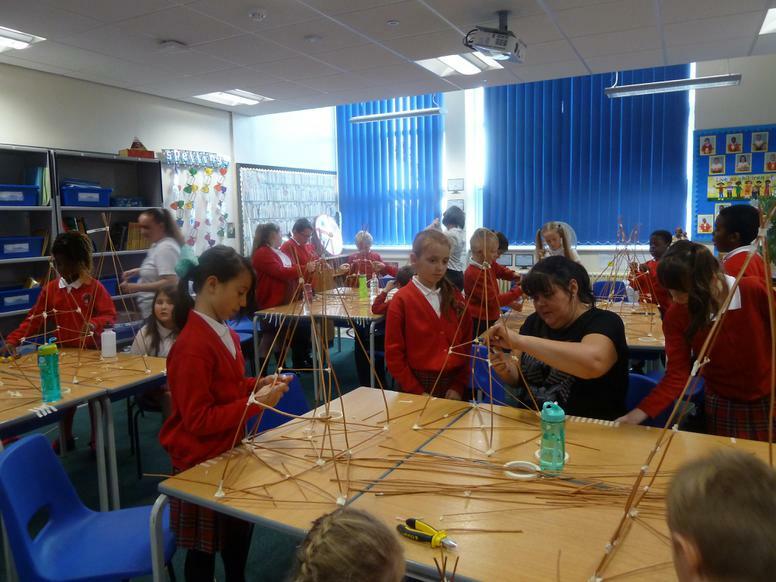 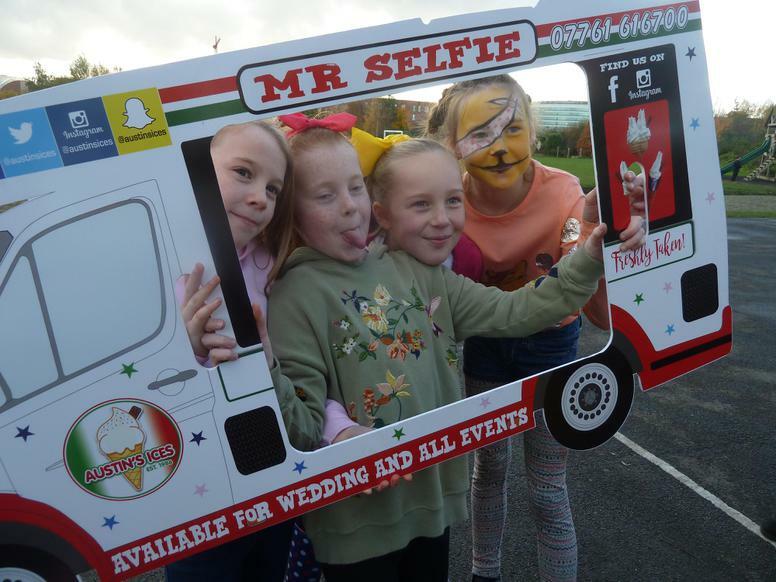 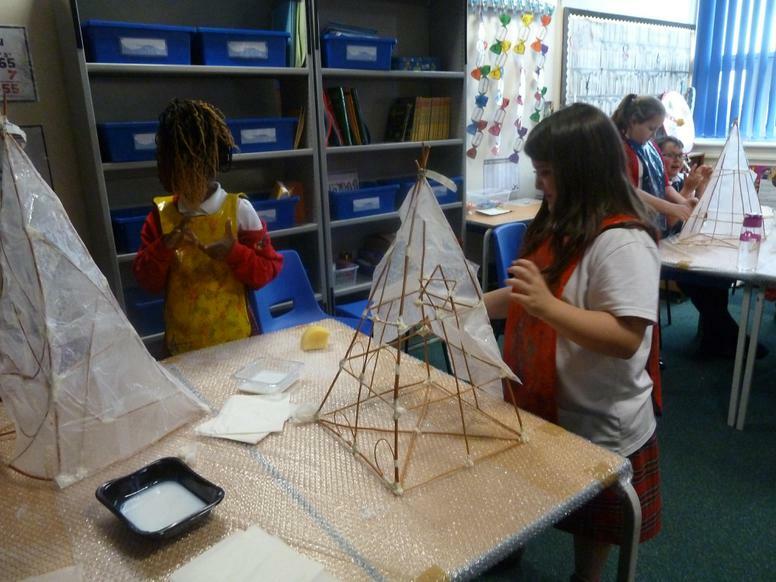 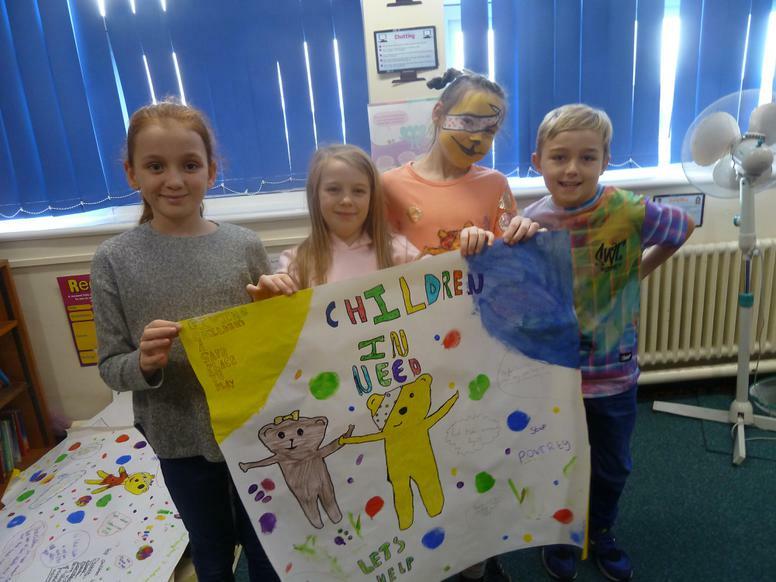 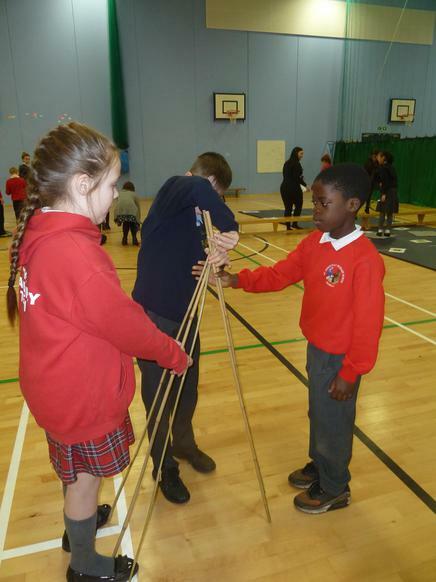 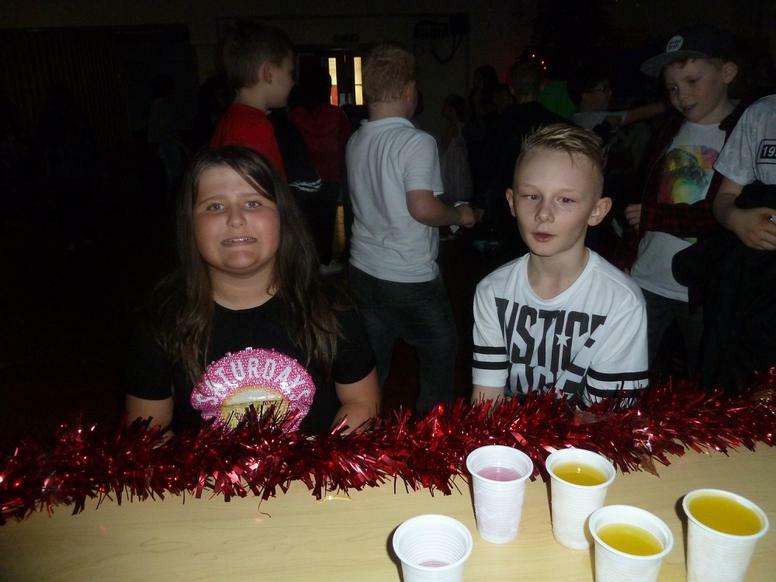 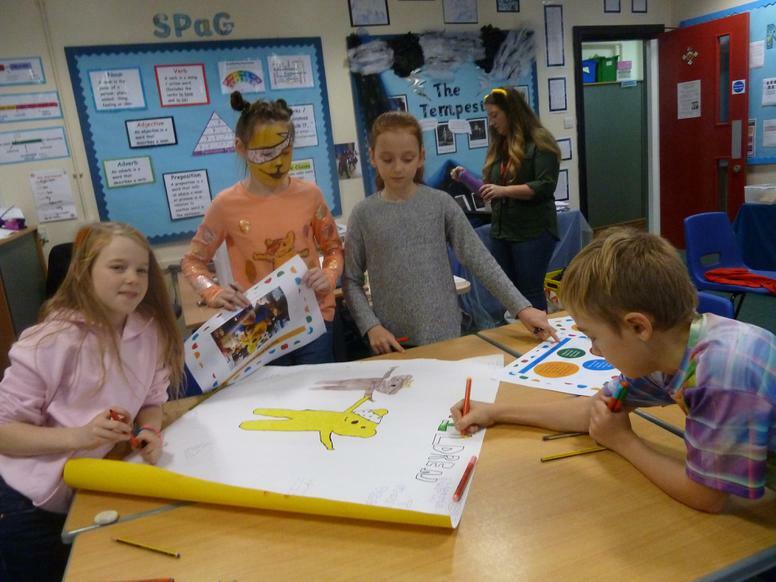 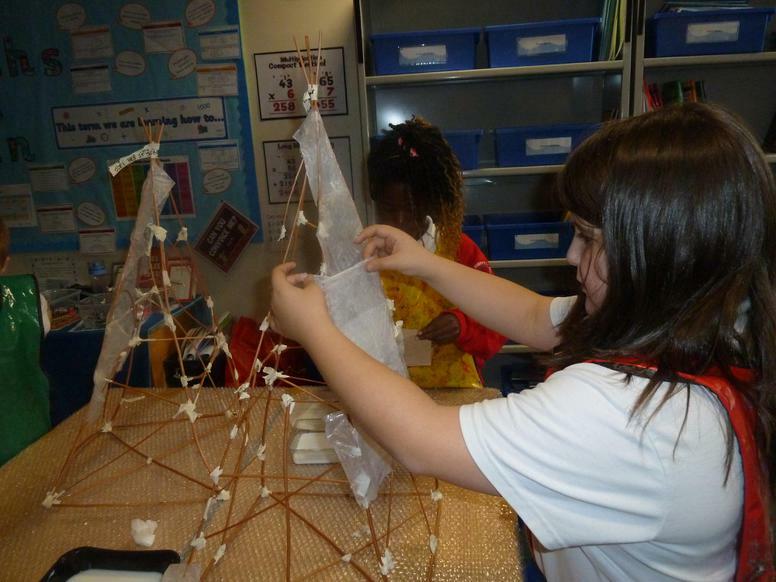 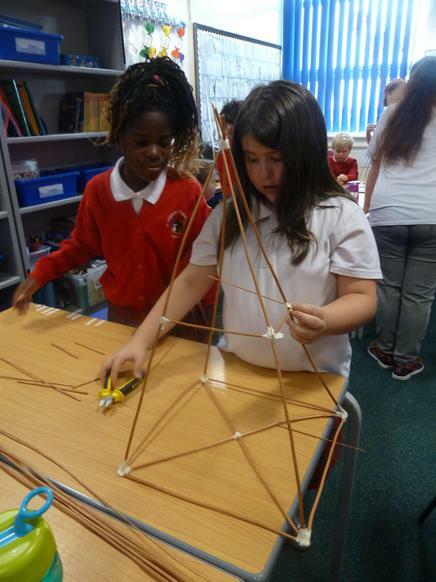 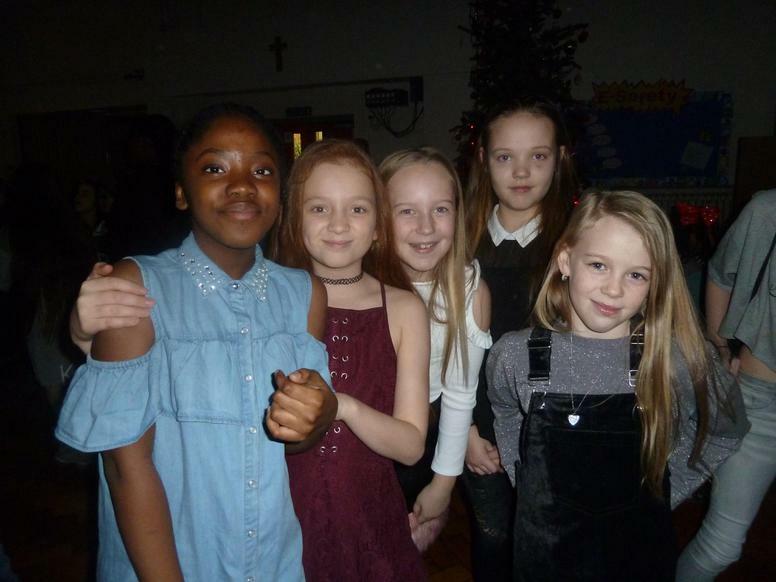 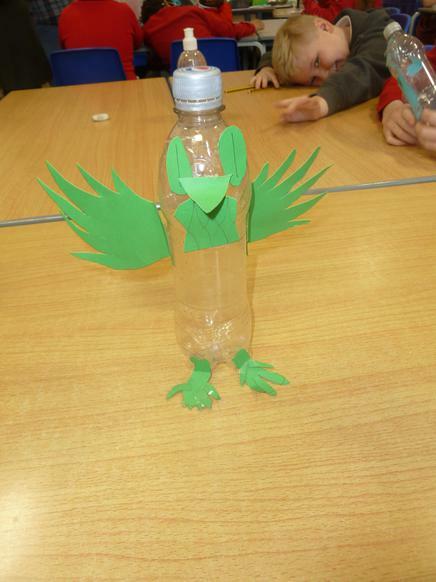 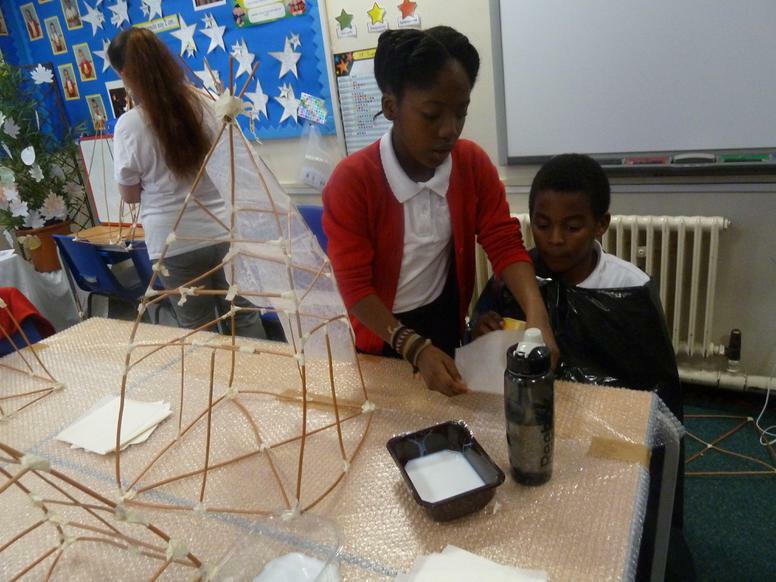 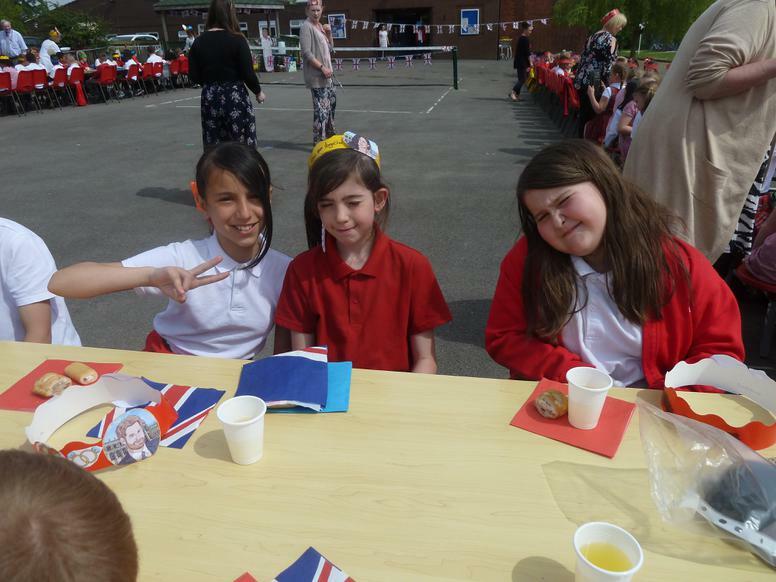 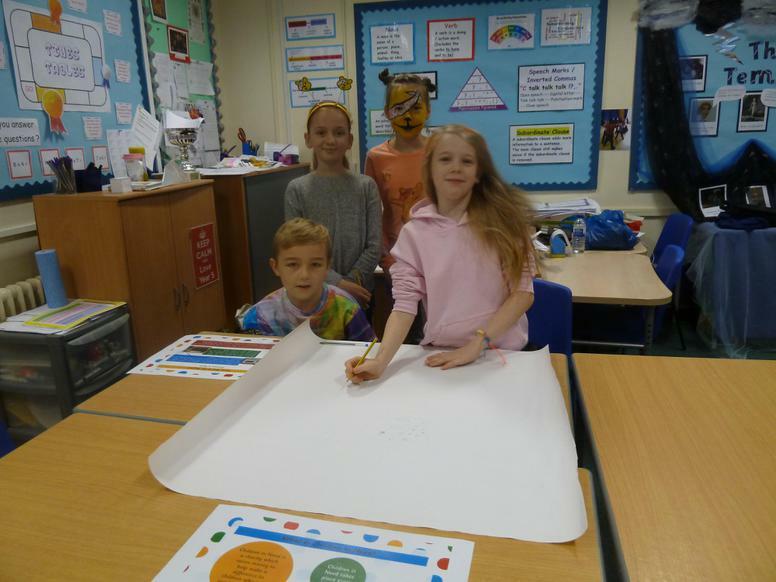 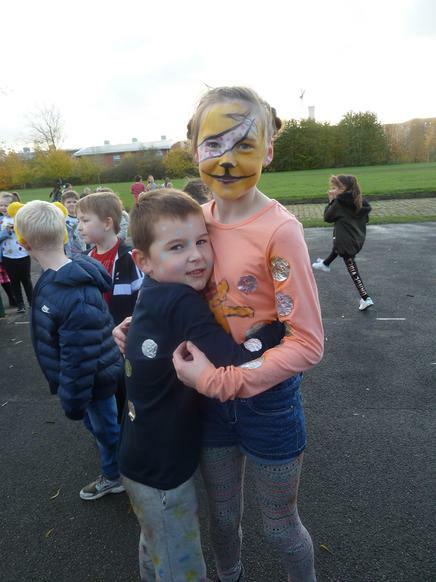 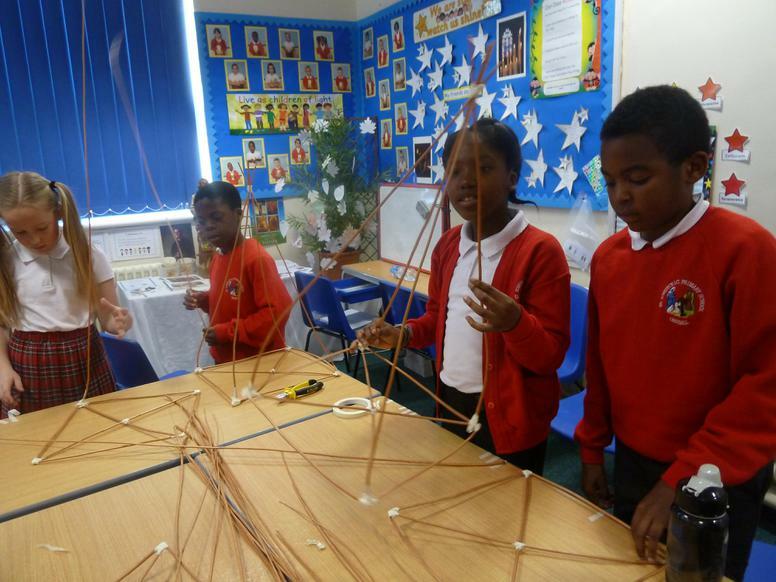 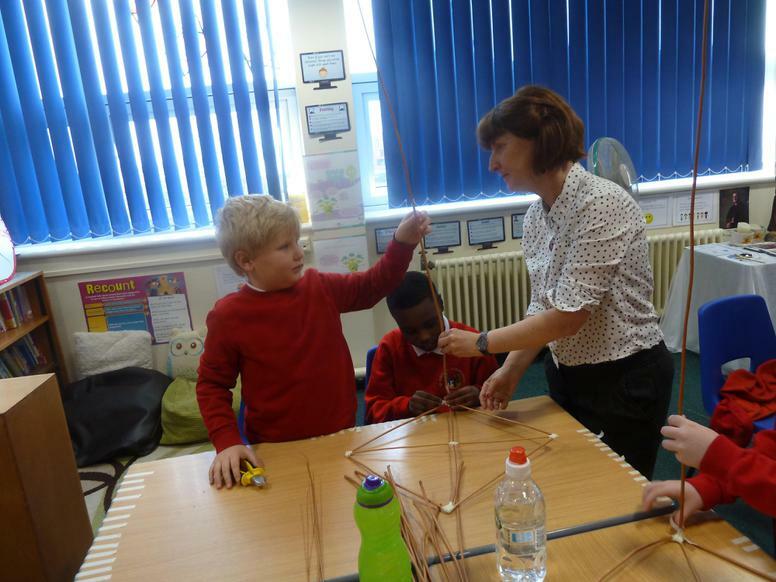 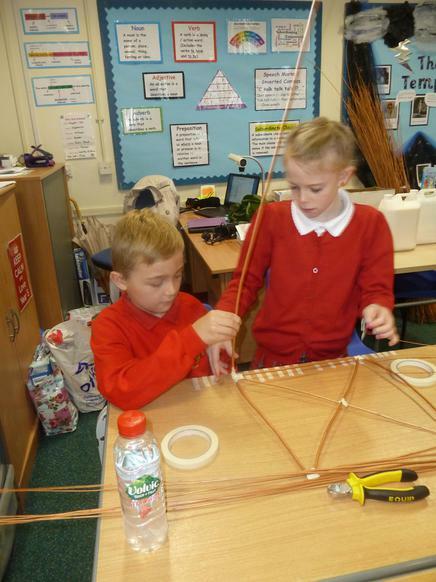 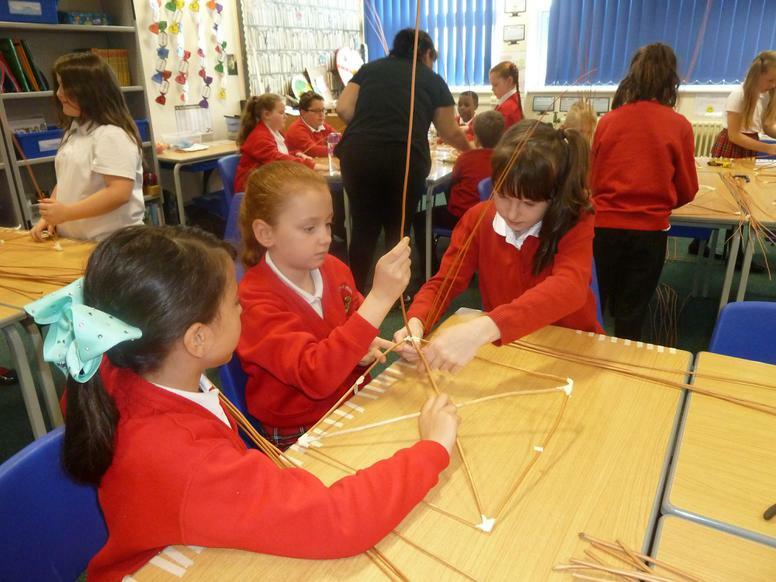 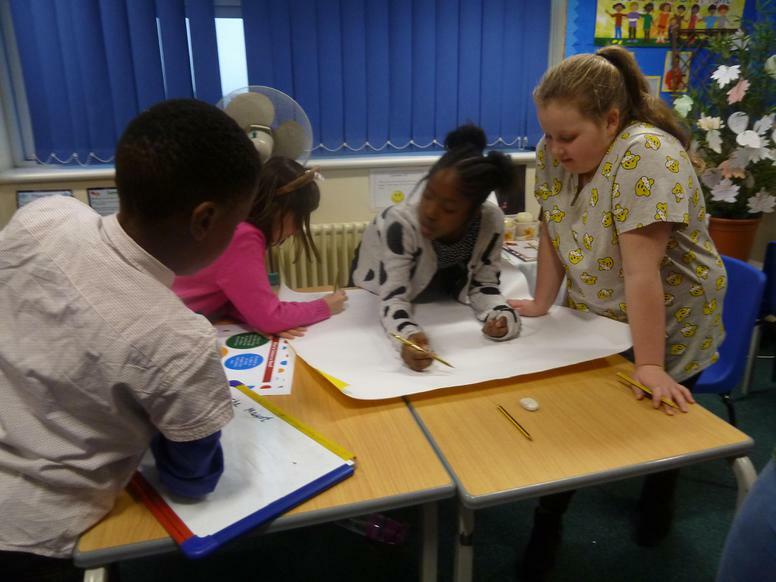 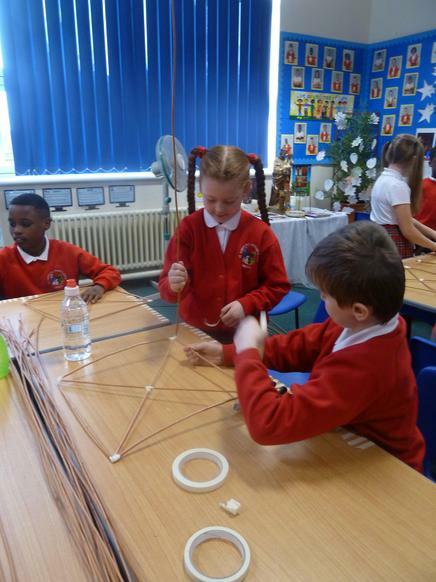 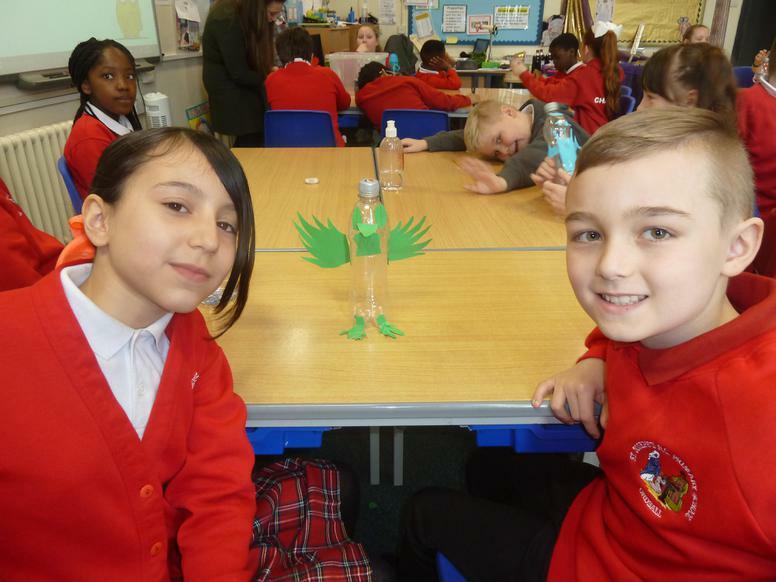 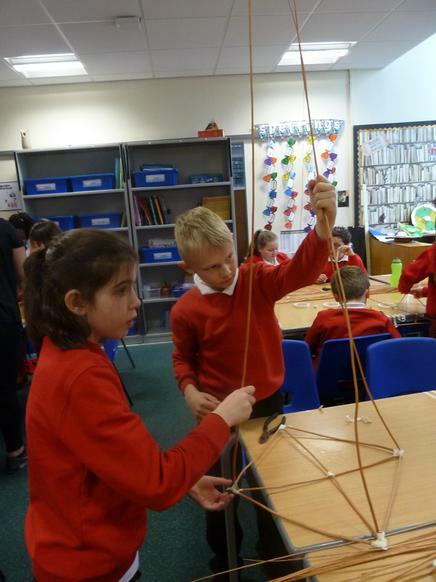 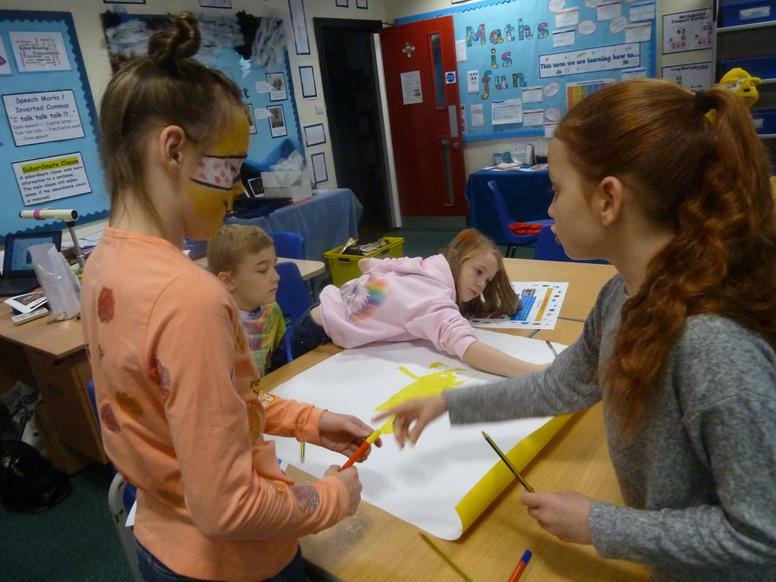 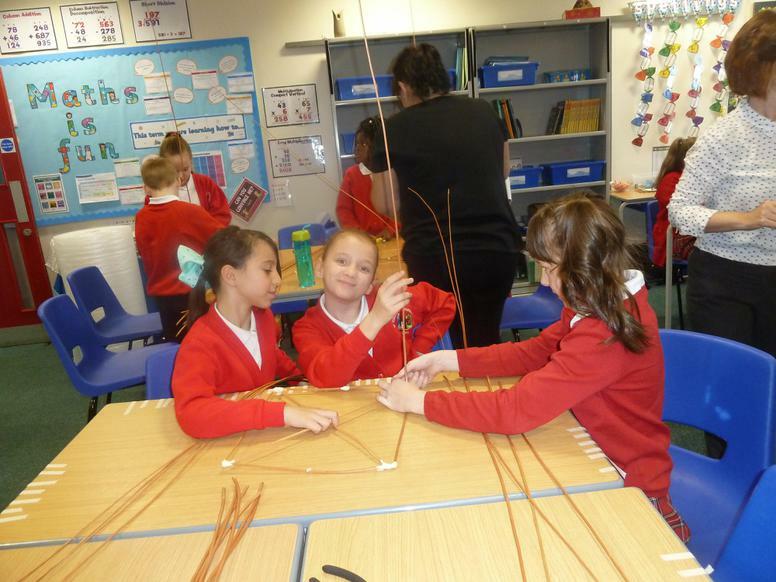 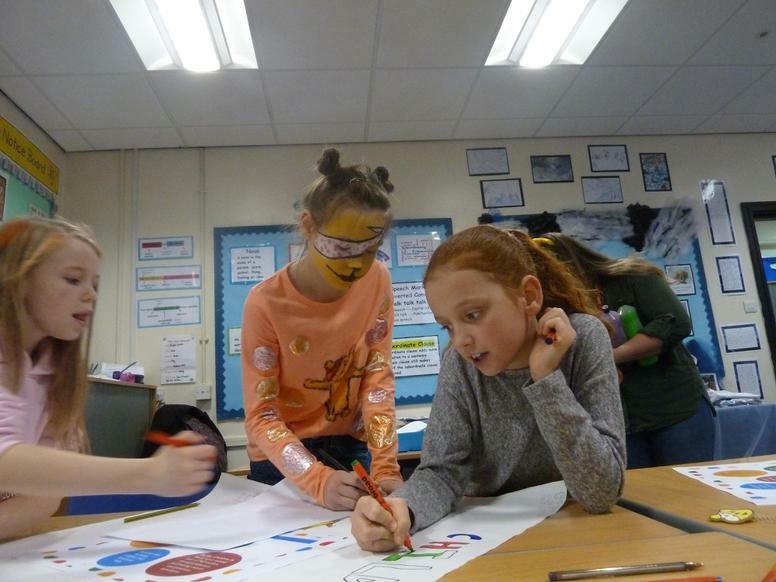 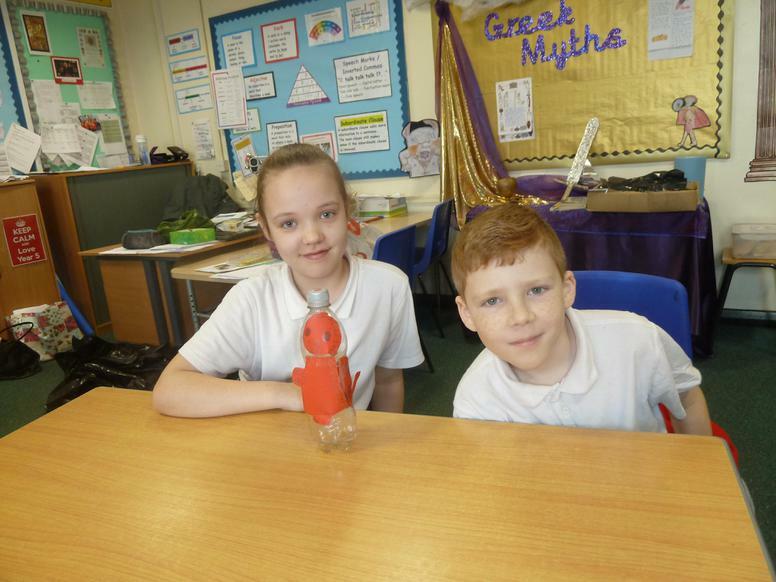 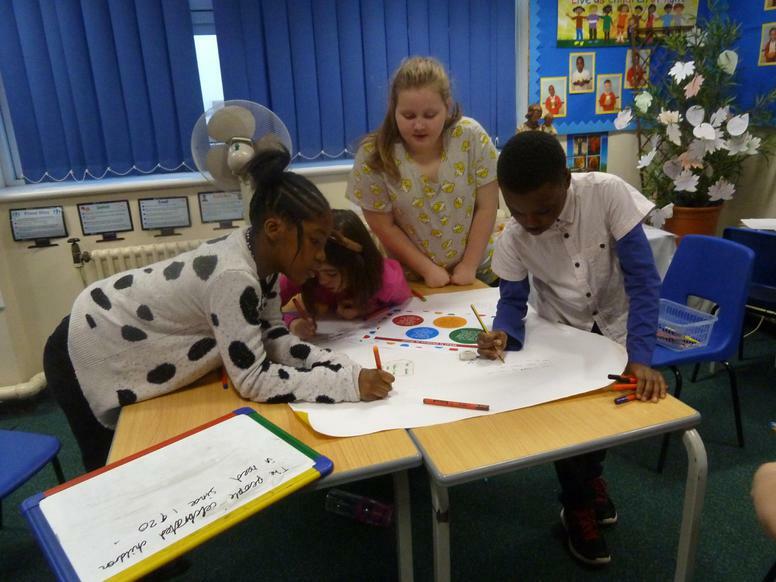 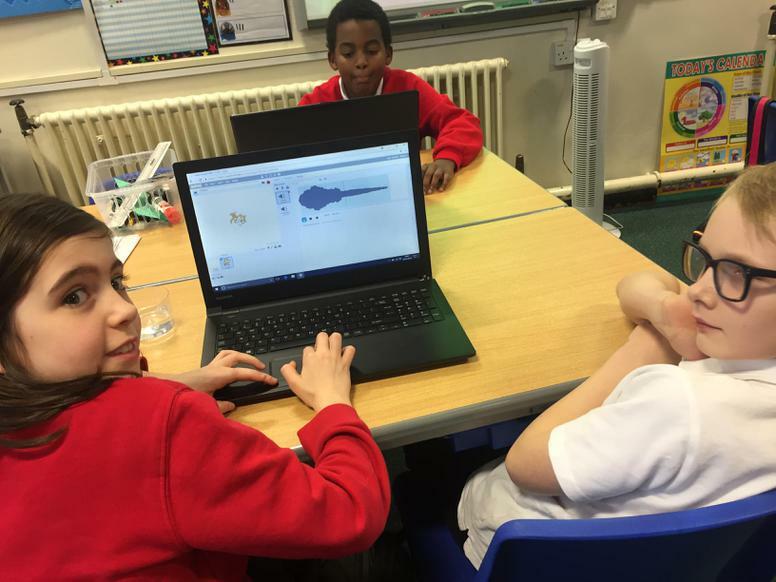 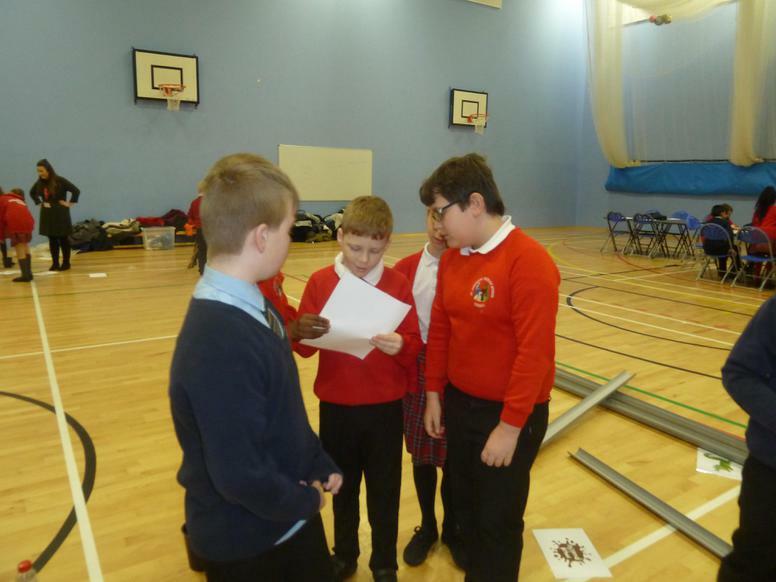 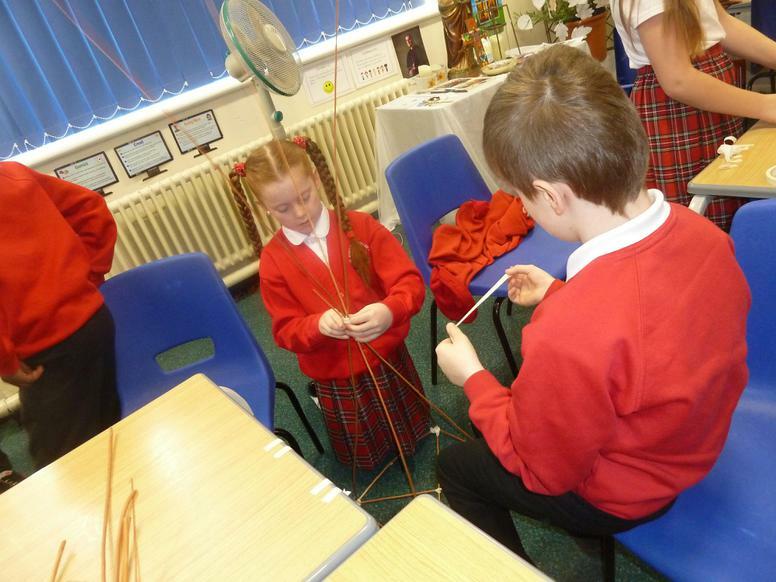 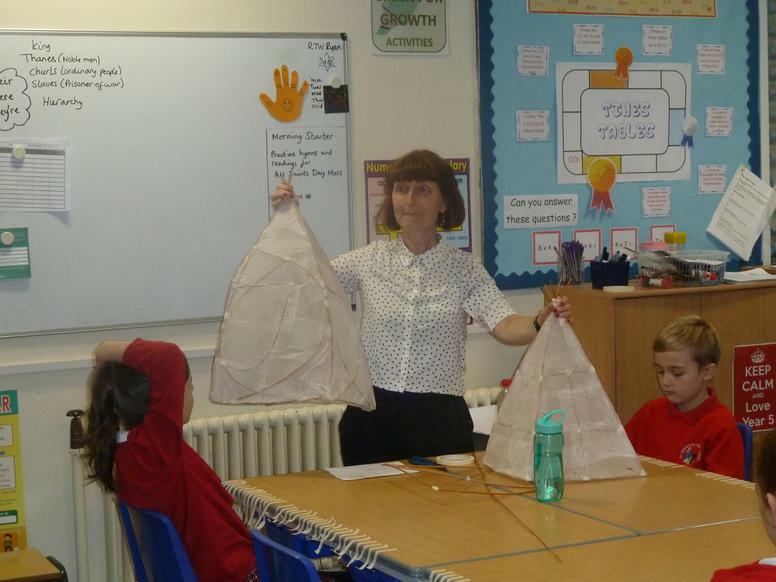 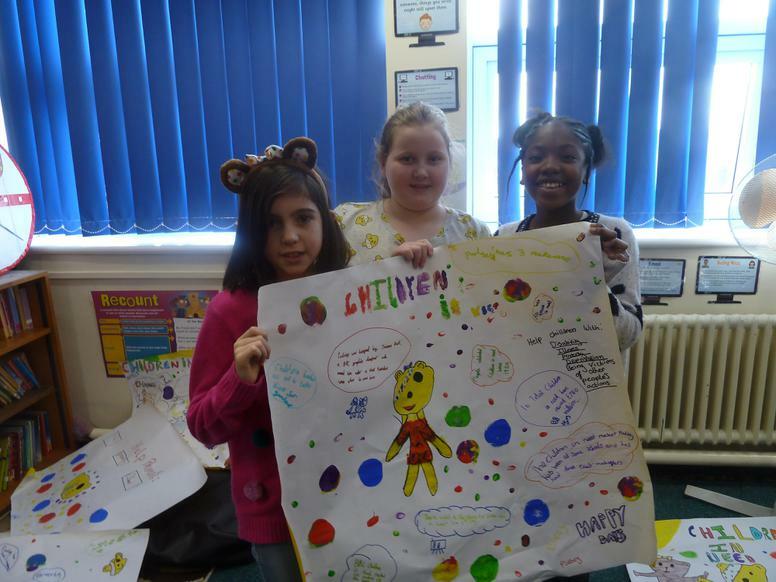 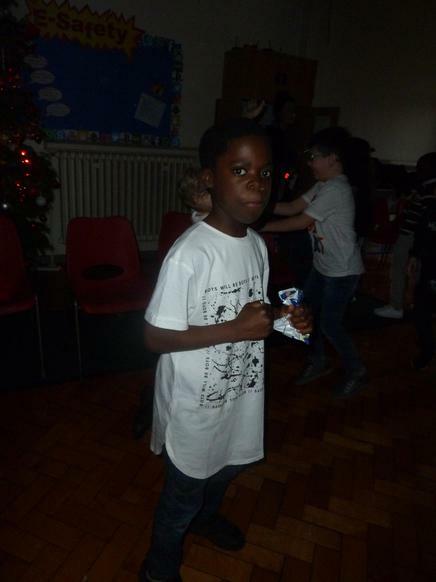 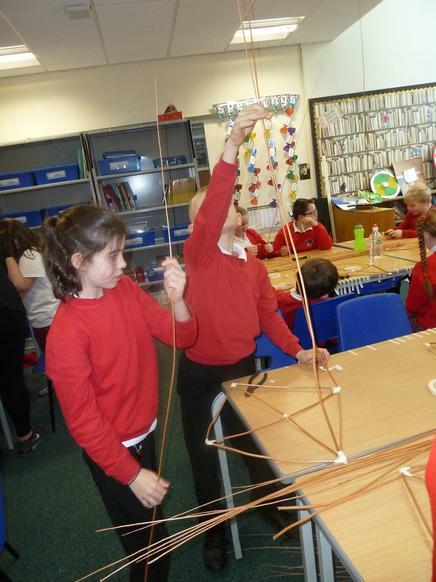 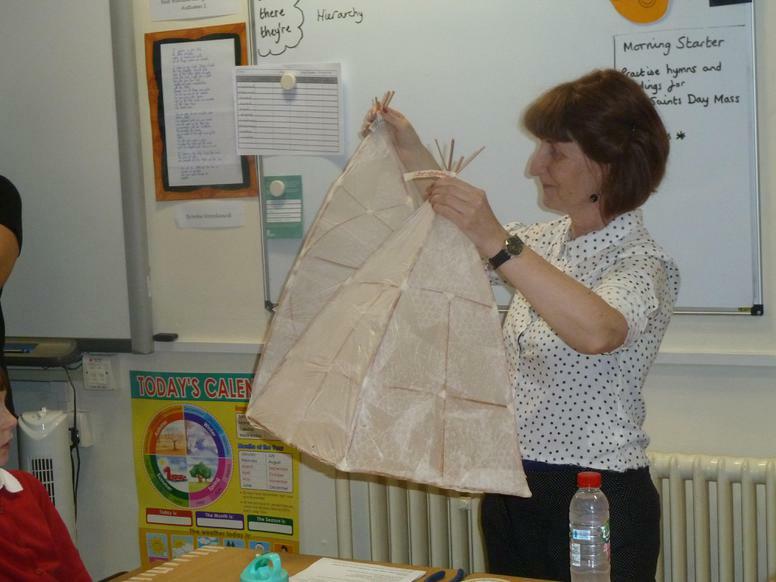 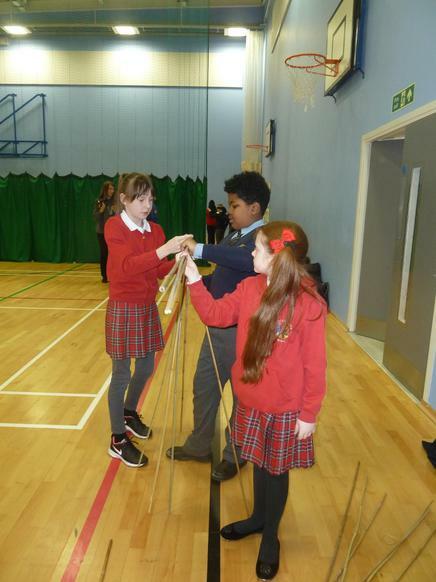 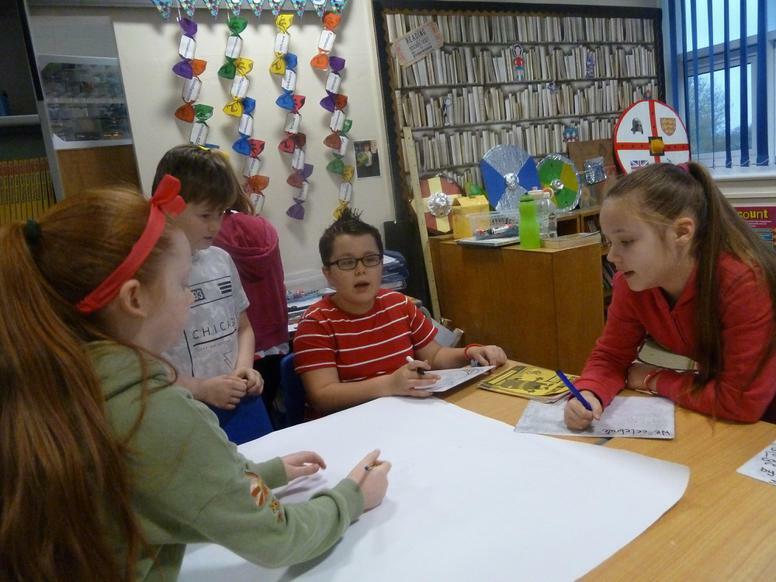 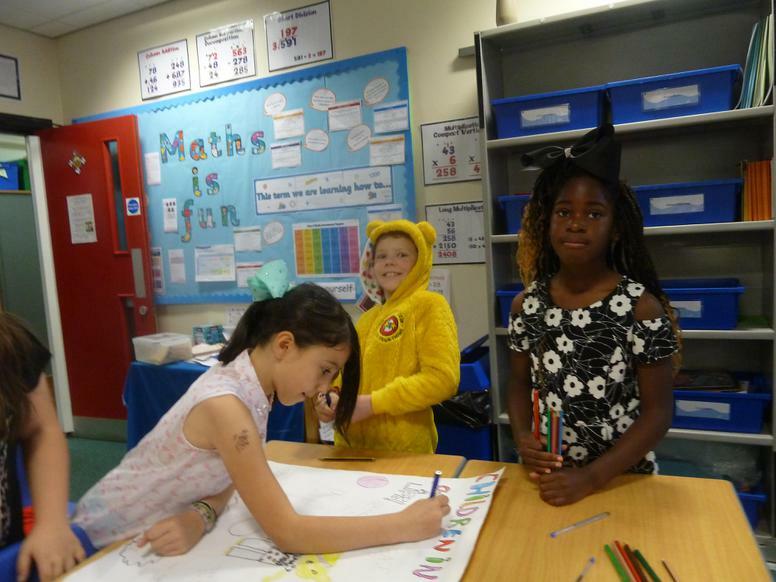 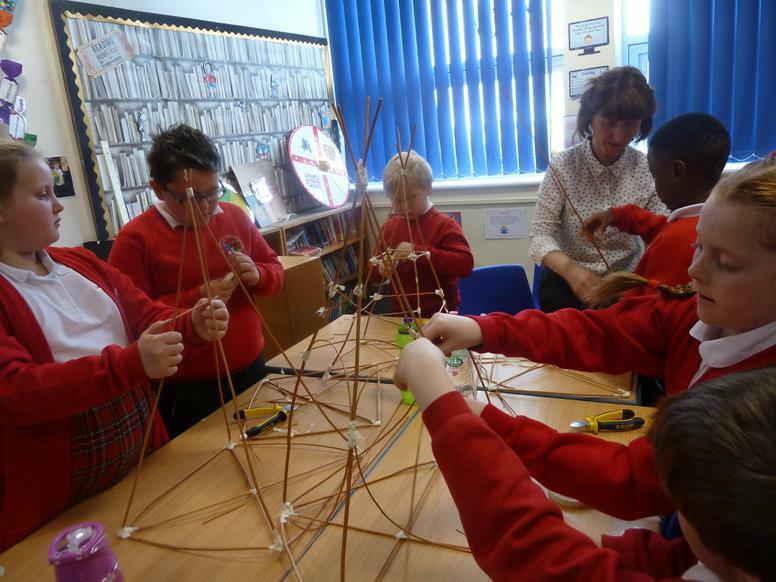 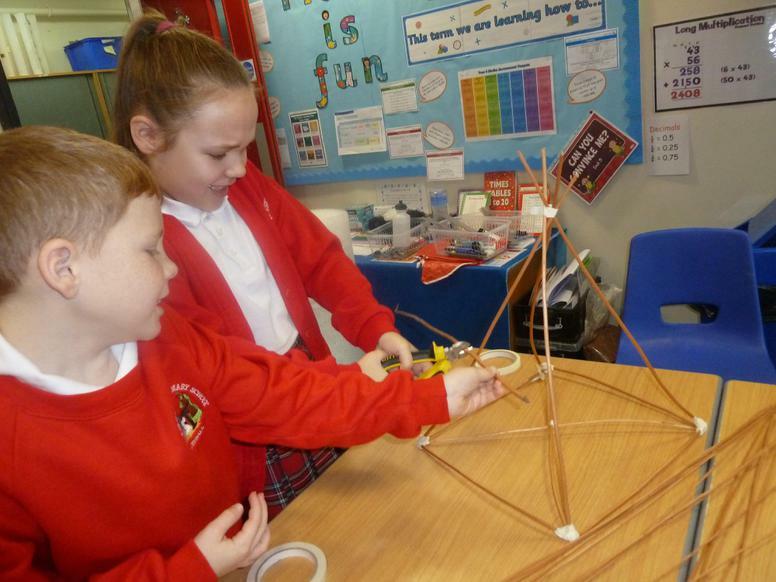 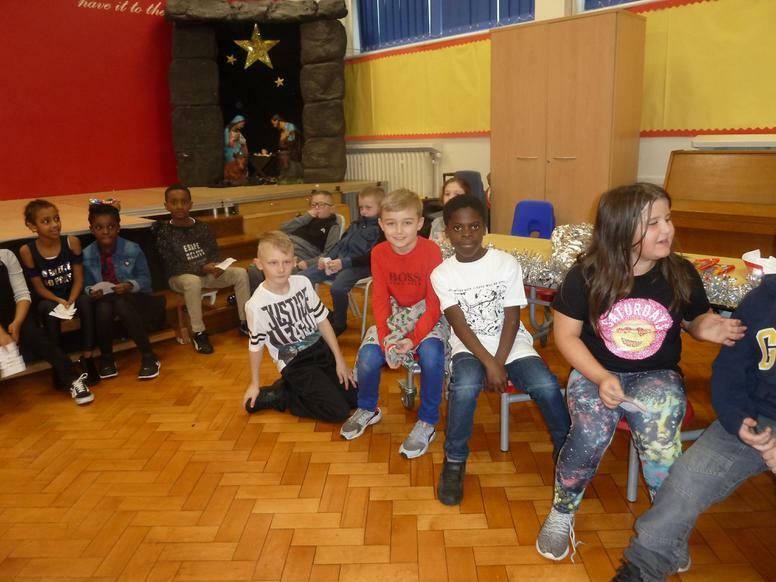 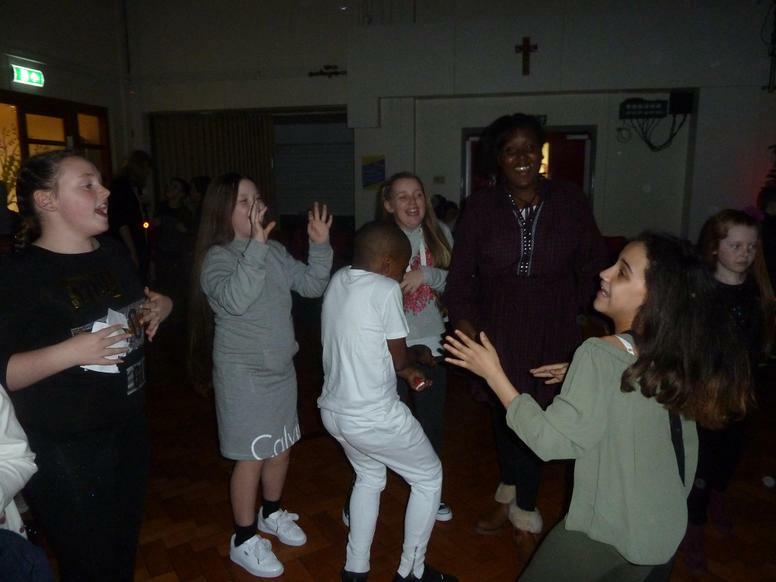 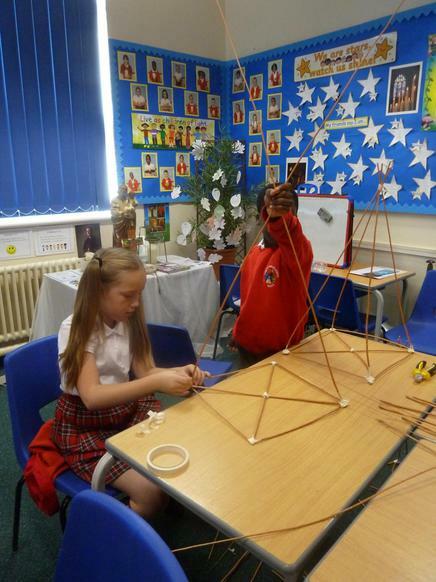 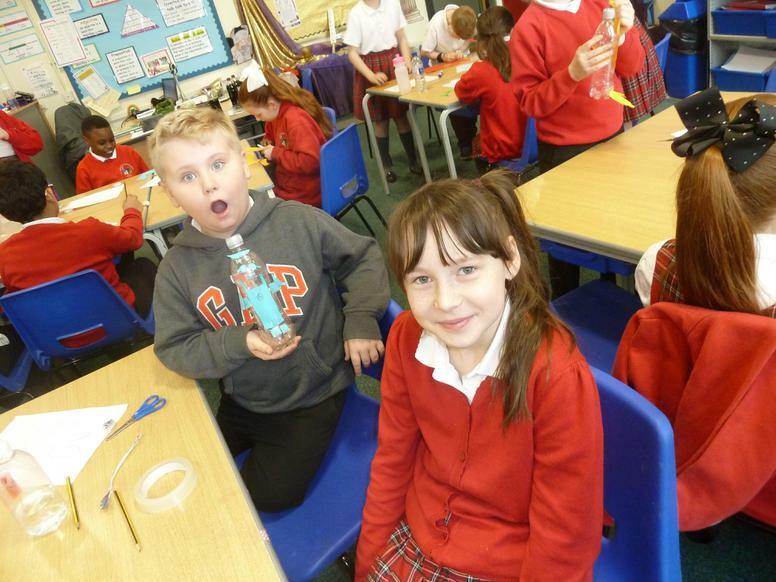 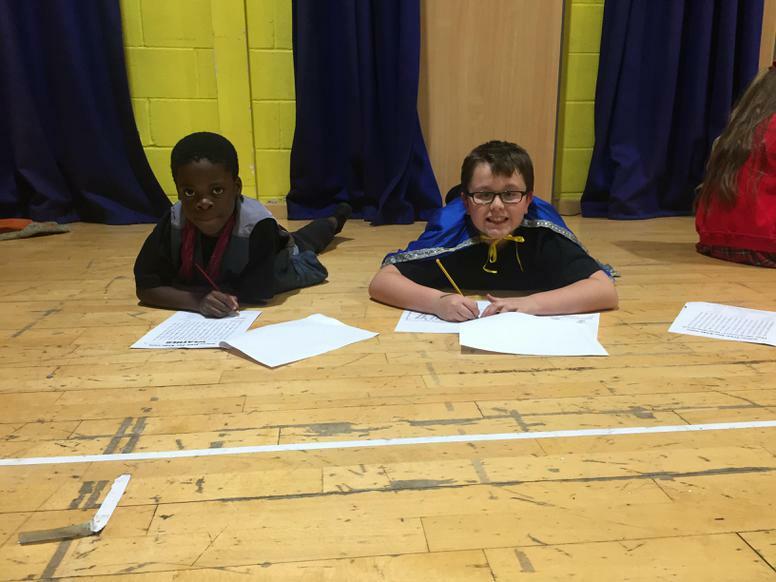 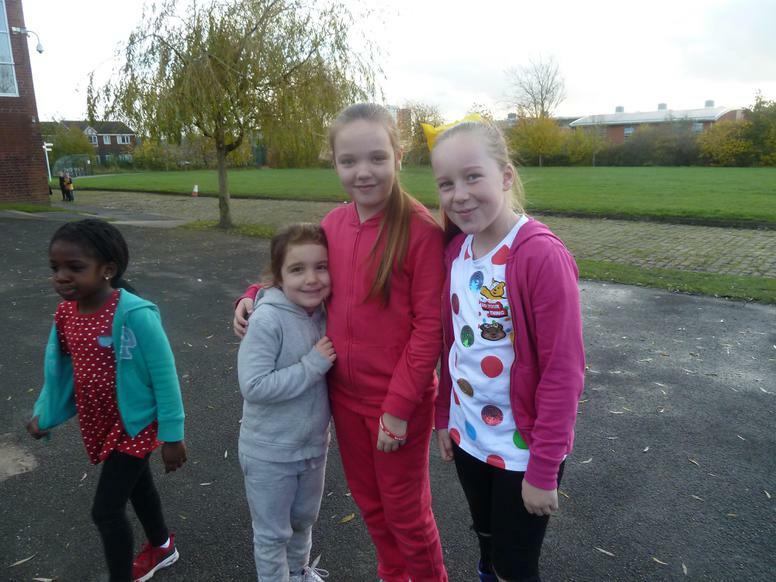 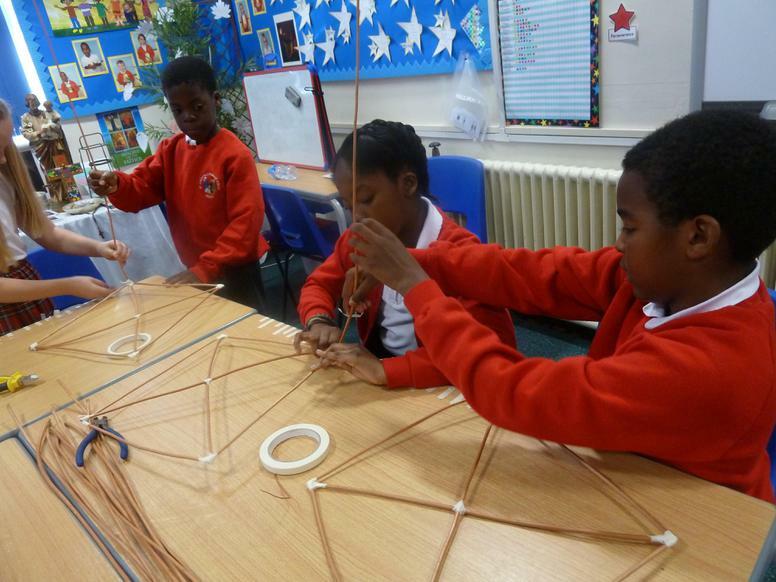 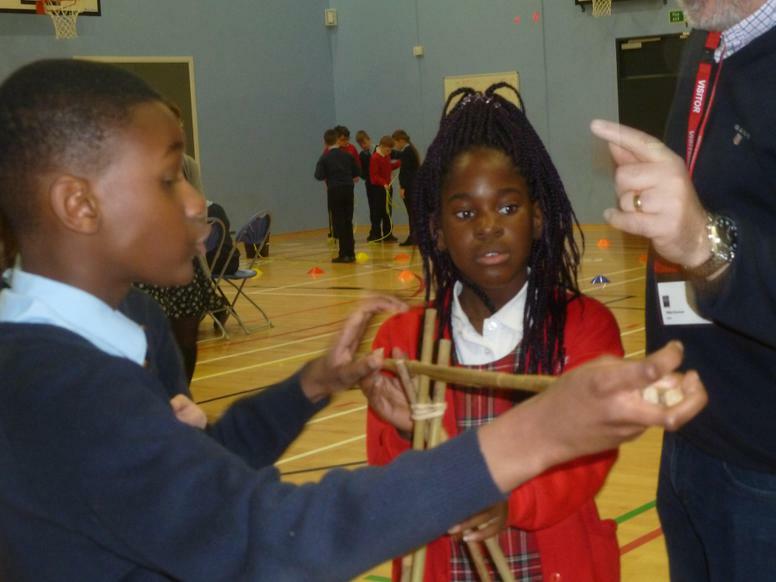 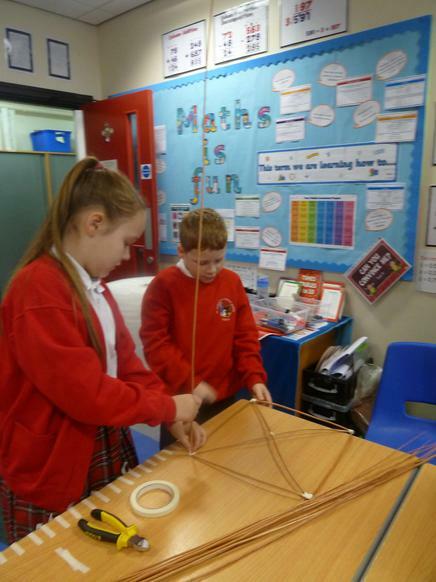 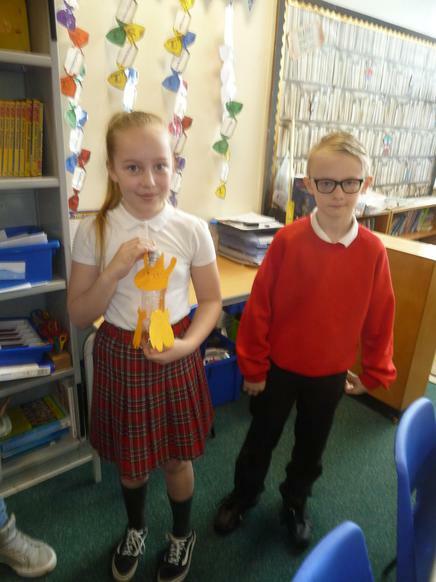 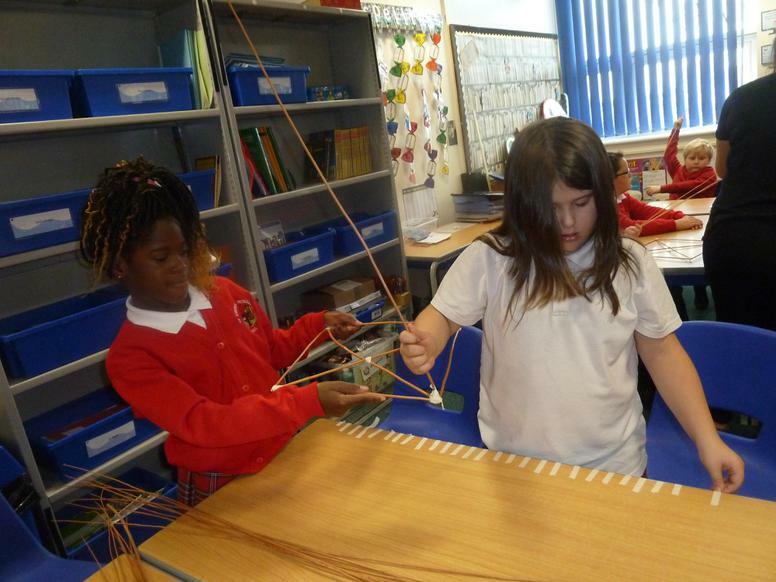 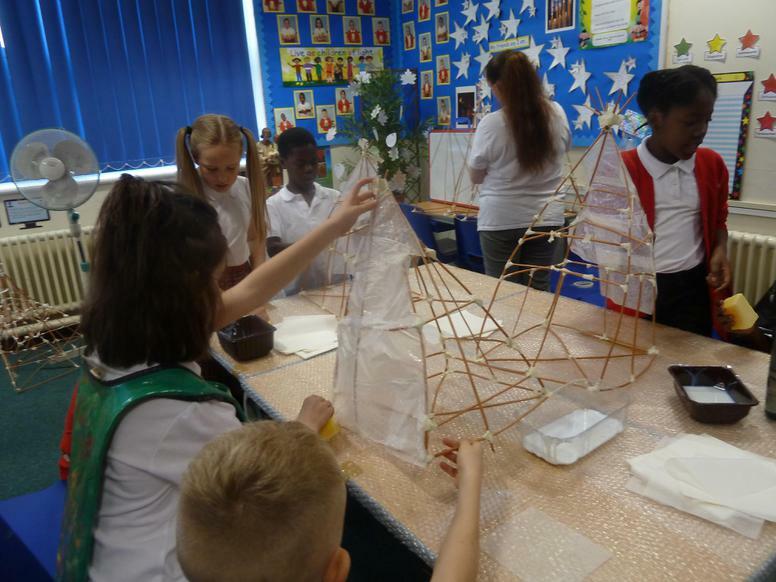 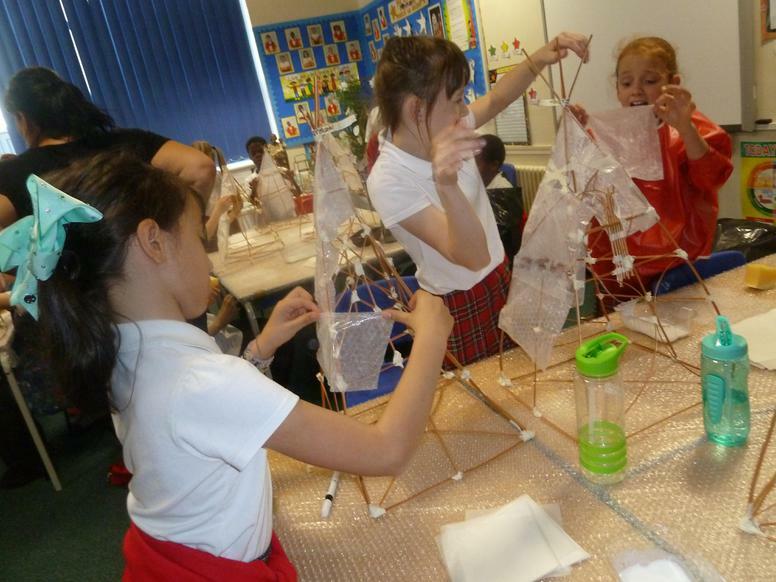 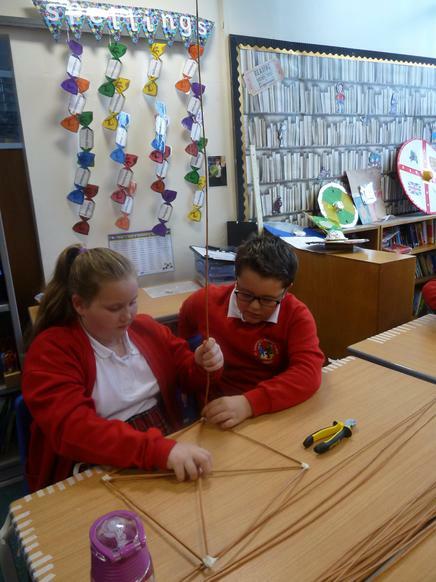 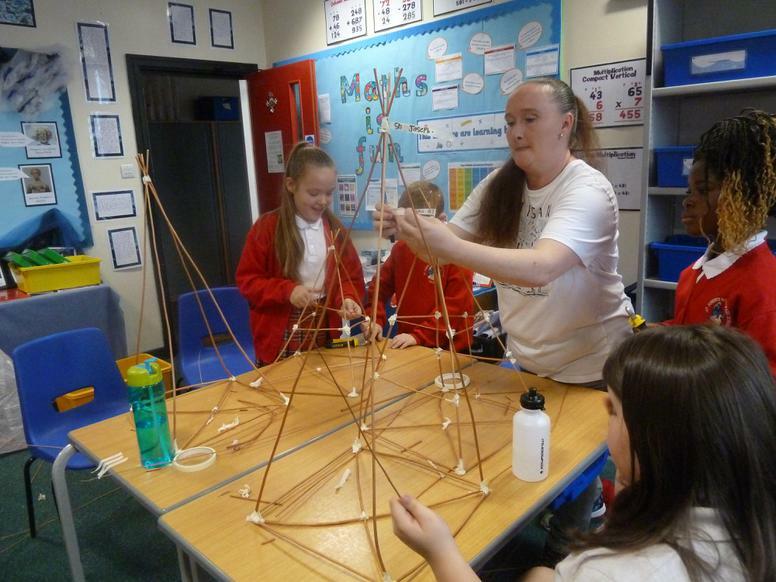 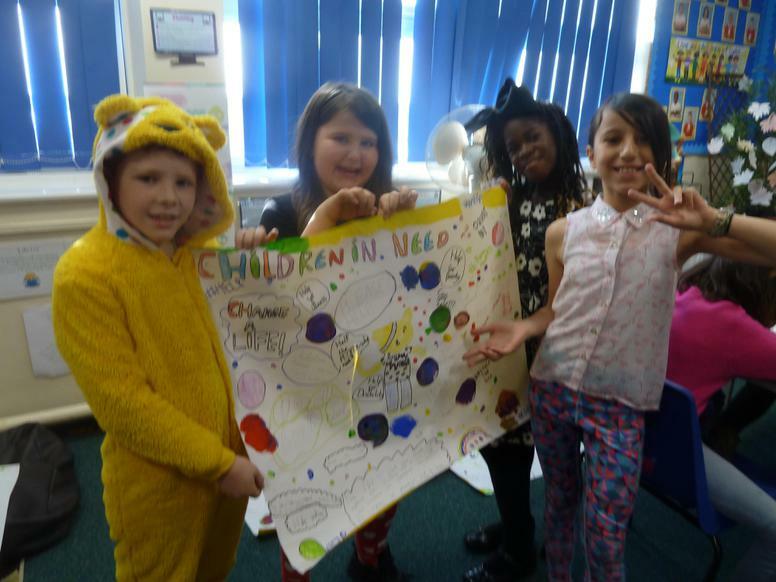 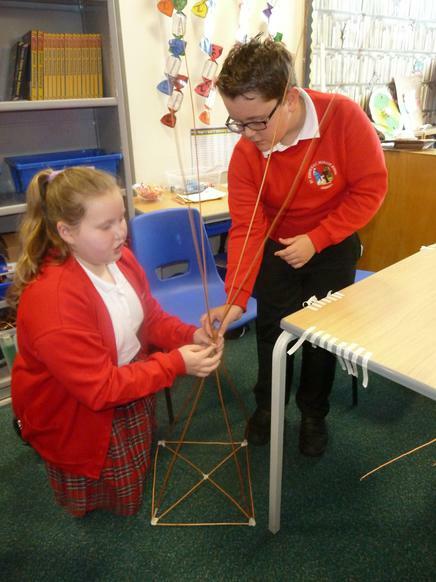 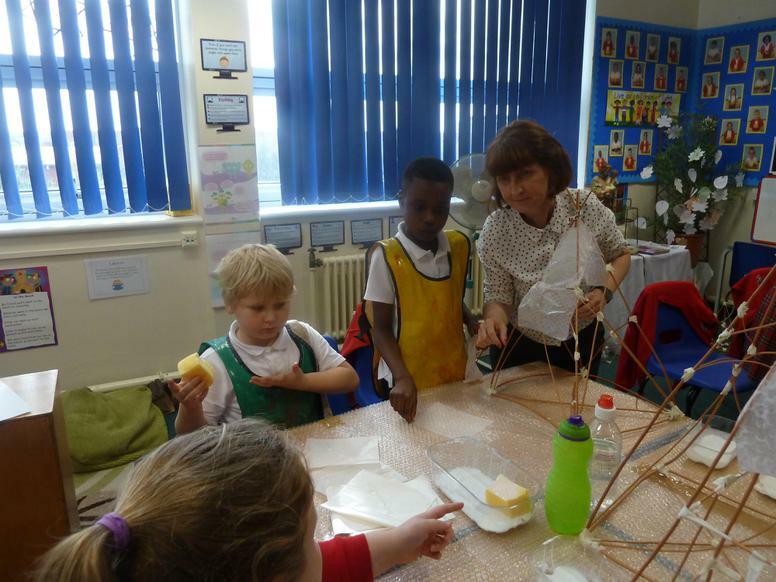 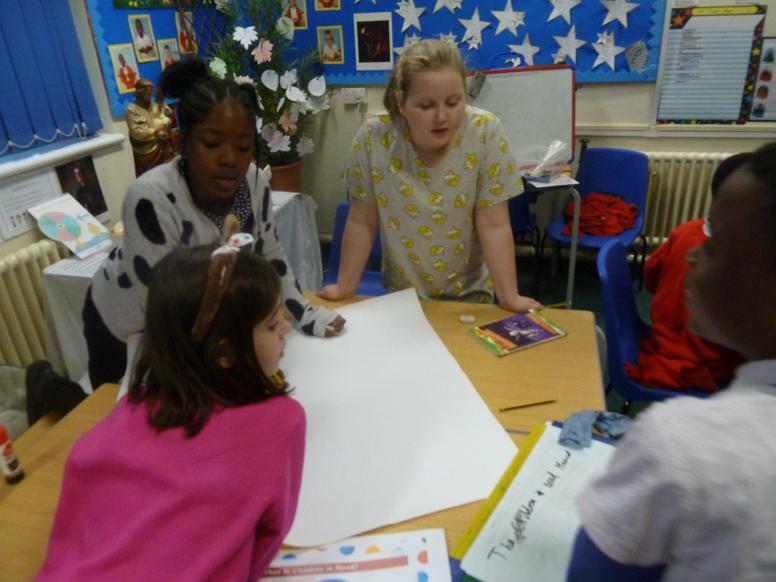 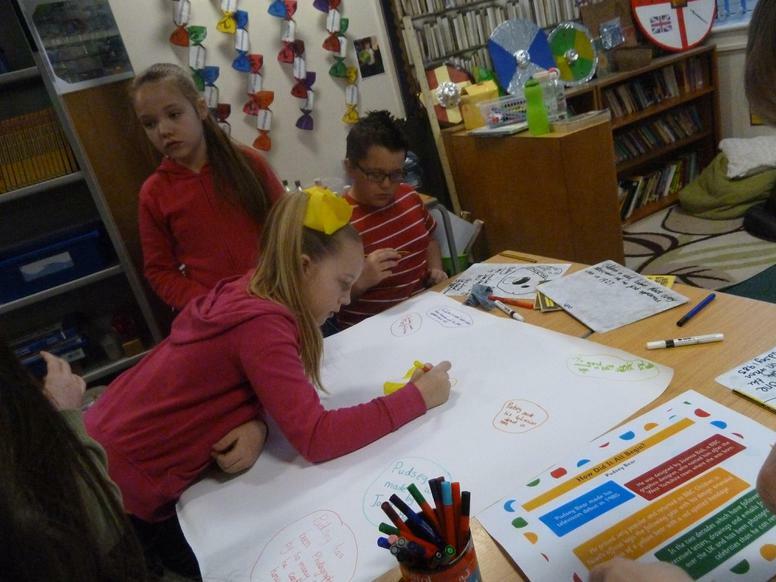 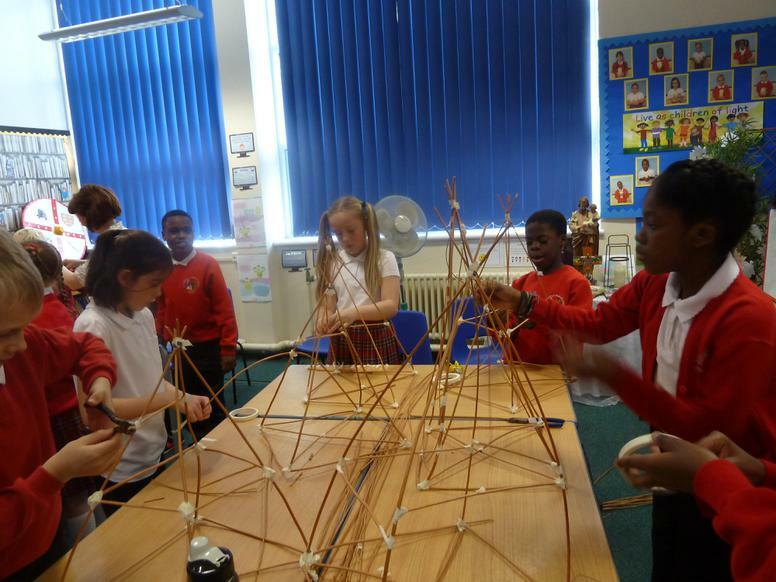 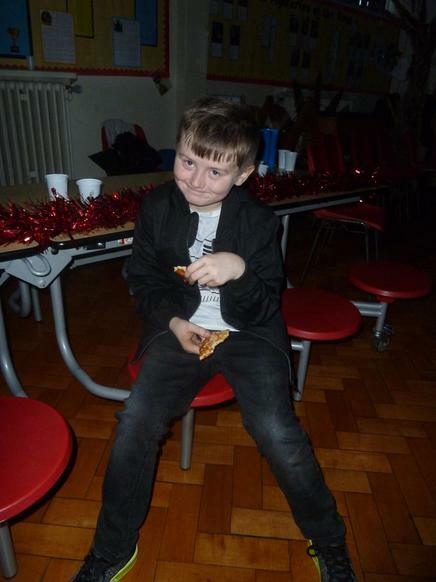 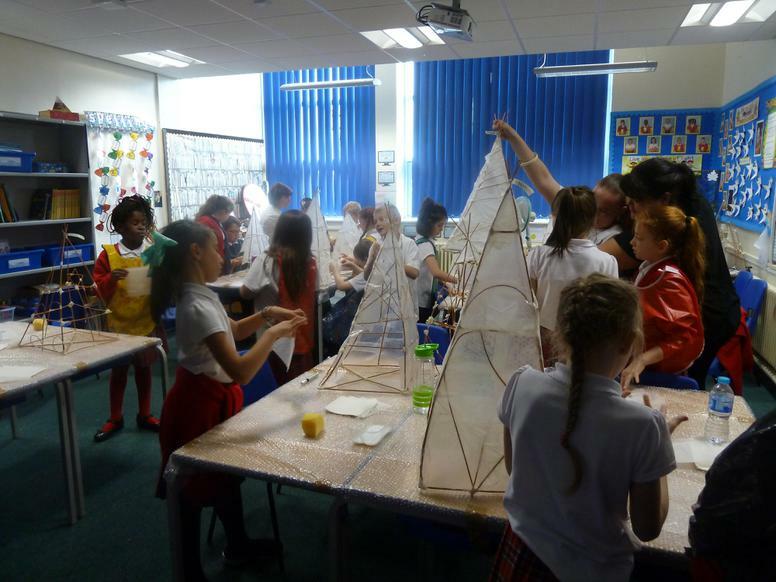 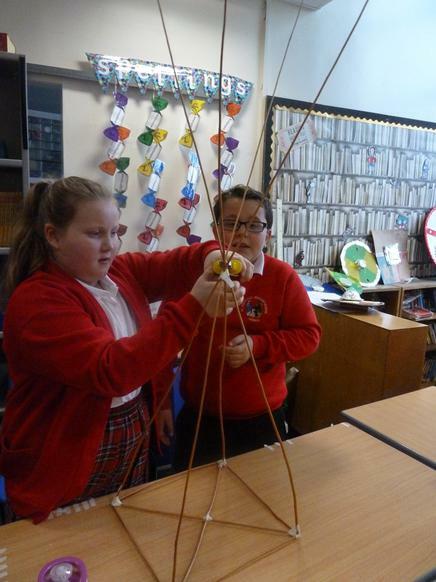 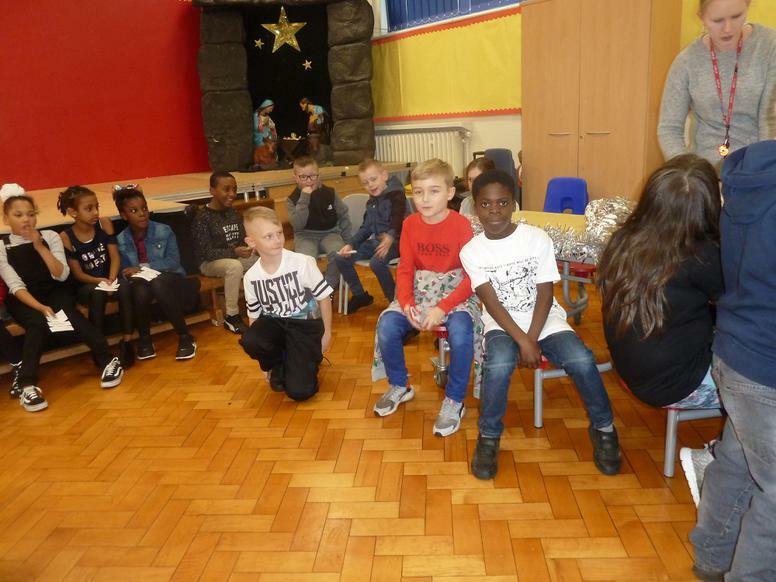 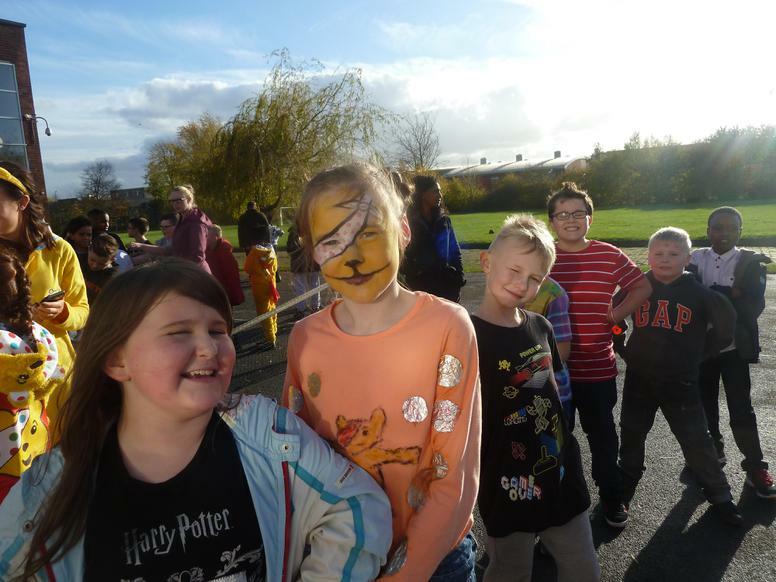 The team from 'Ordsall Arts' taught the children how to design and build creative, strong, three dimensional shapes that will be lit on the night. 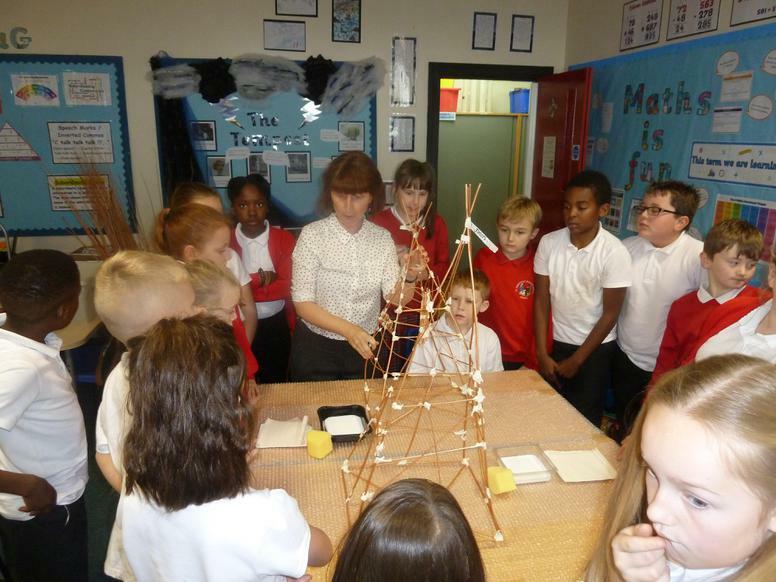 A huge thank you to Gail and her team for sharing their skills and providing a day of learning and fun! 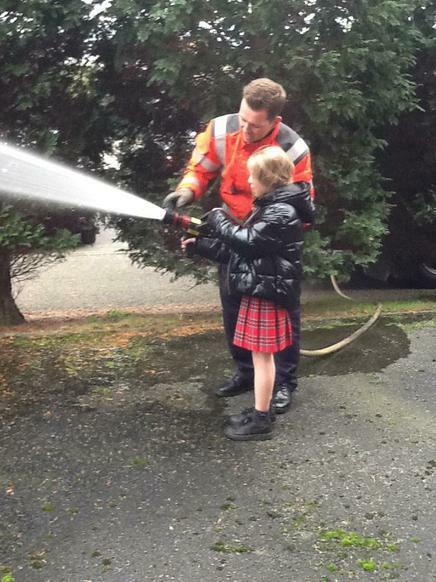 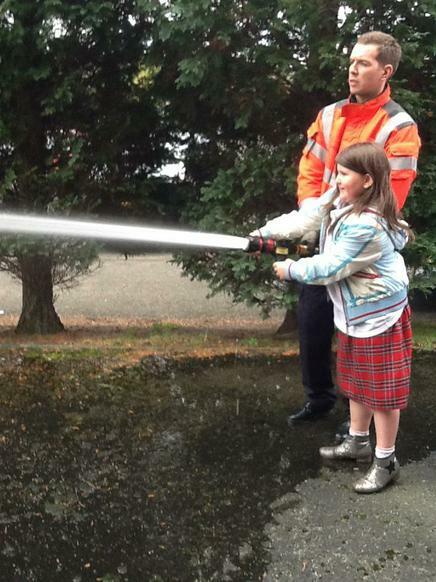 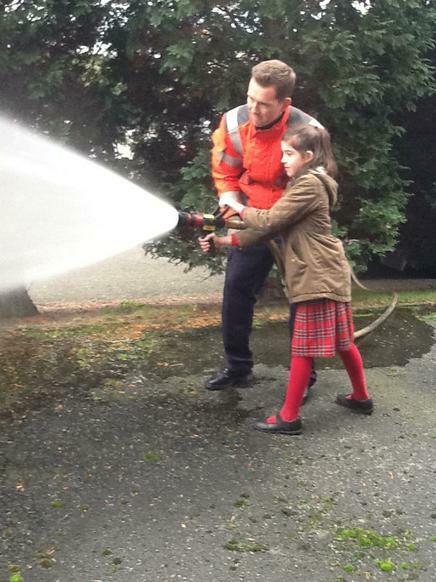 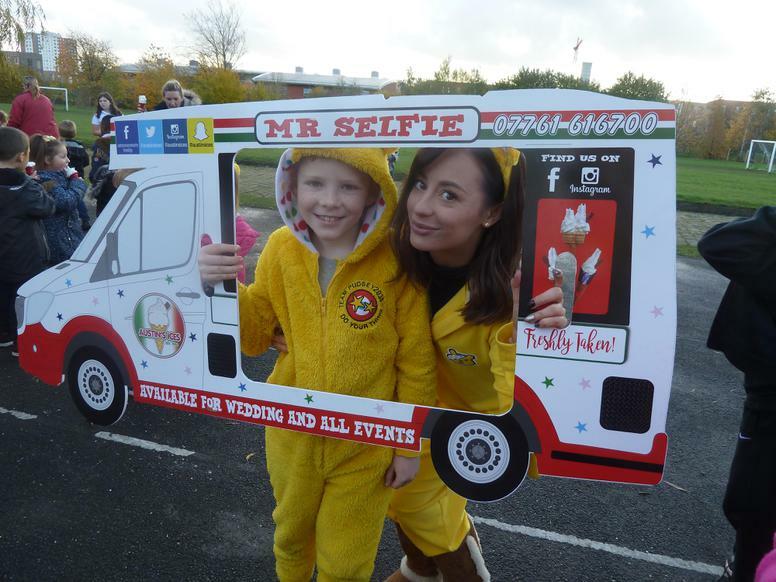 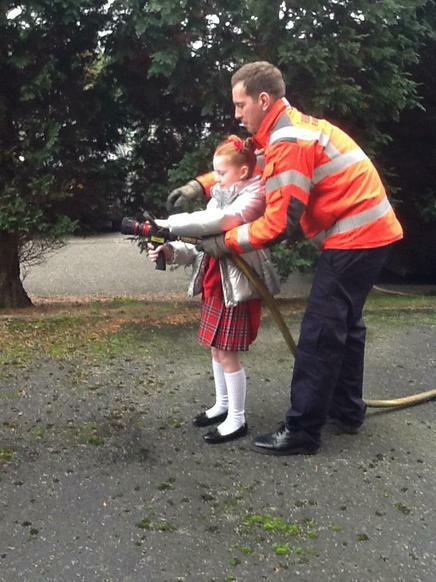 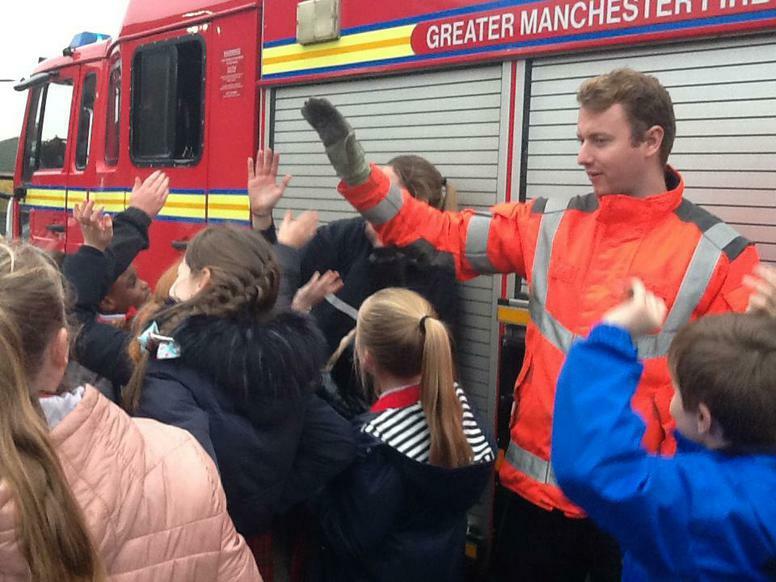 The fire brigade came to talk to the staff and children about Bonfire night. 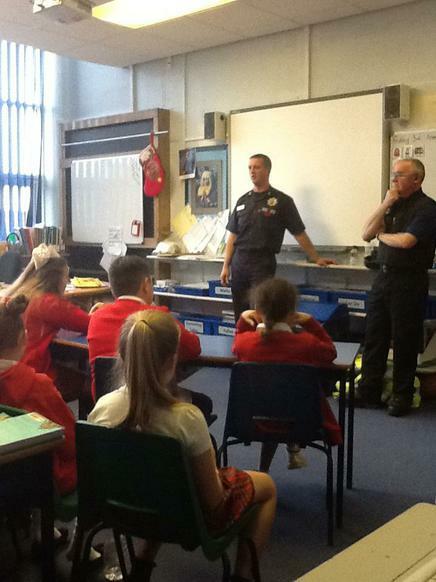 They advised us on how best to stay safe whilst enjoying the events and firework displays at this time of year. 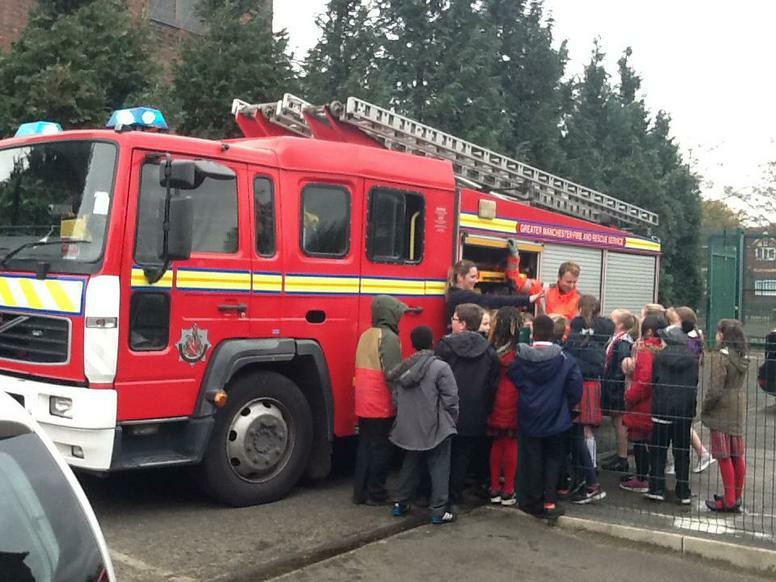 The children were also given the opportunity to see a real fire engine and discuss with fire fighters the equipment used to put out fires and rescue people. 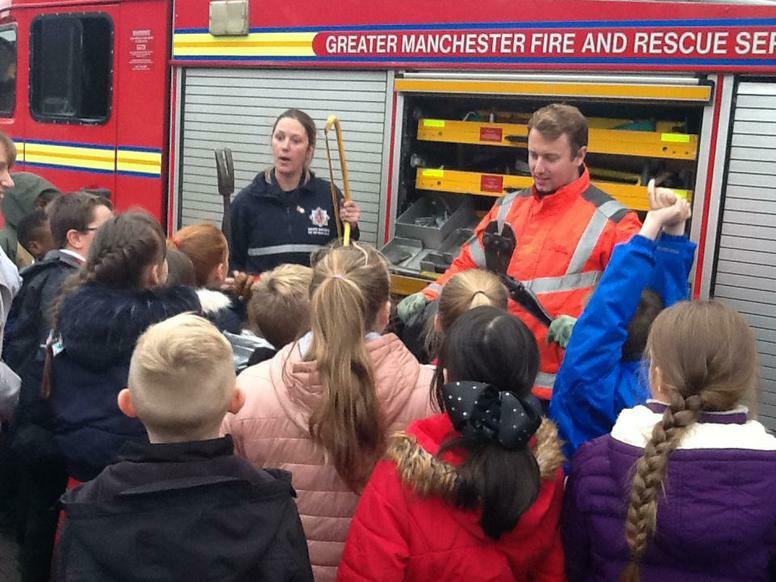 It was an excellent insight into this vital service. 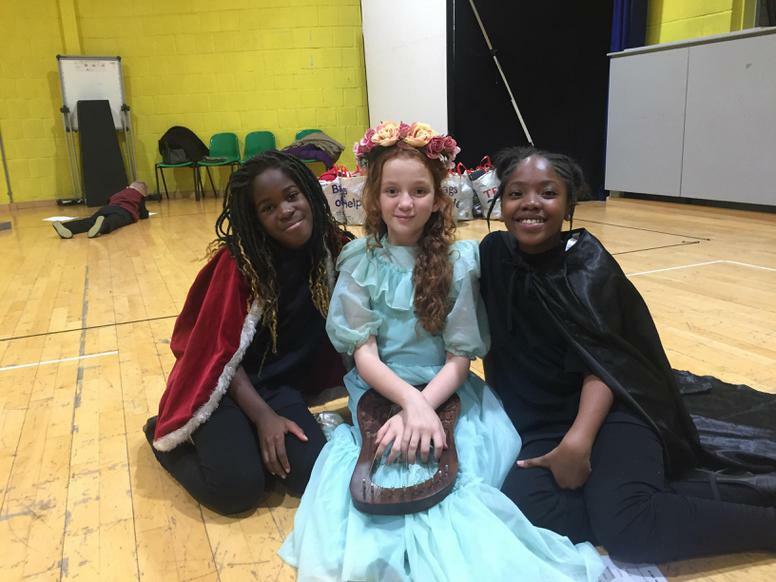 English lessons during Autumn term are extremely exciting because we are learning about the life and works of William Shakespeare; widely regarded as one of the greatest poets and playwrights of all time. 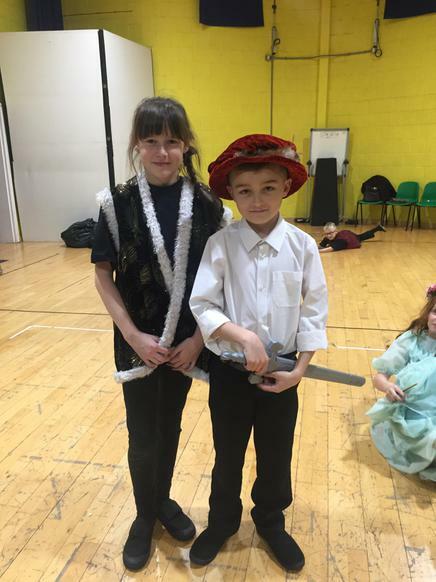 We are focusing on his wonderful play: The Tempest, which was written between 1610 and 1611 and was Shakespeare's final play. 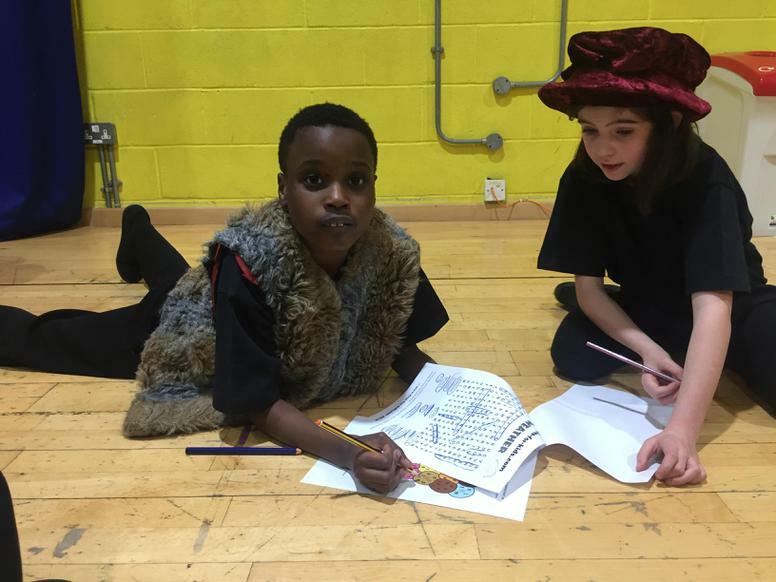 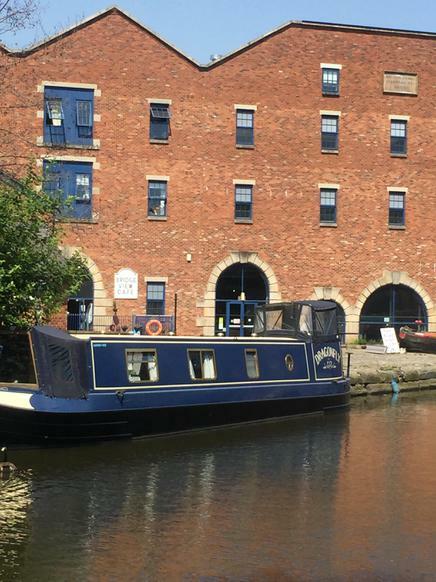 The opportunity to perform at the Contact Theatre in Manchester allows us to fully engage with the characters and be enveloped in the world of magic, revenge and love created by this extraordinary writer. 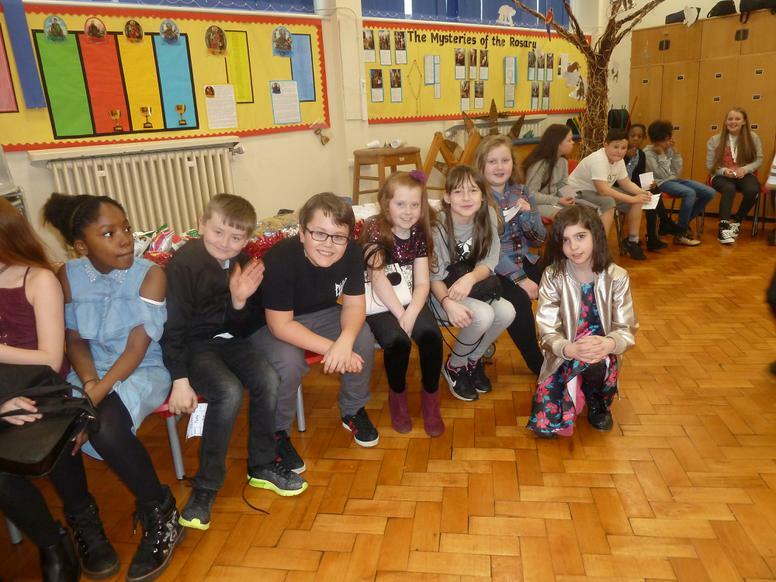 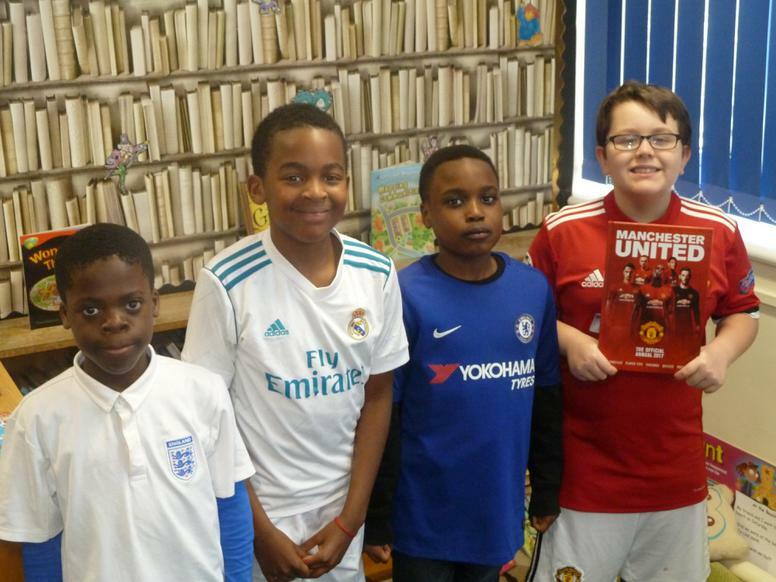 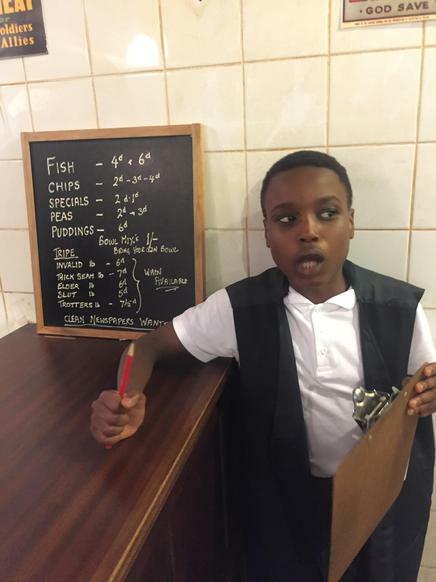 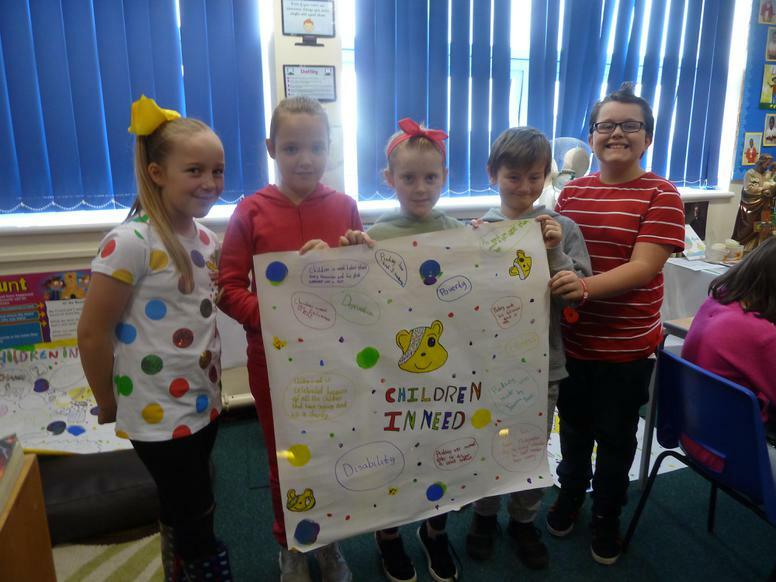 Each teacher choses a child who has impressed them with their hard work in class and also a 'child of the week' who has stood out from the crowd. 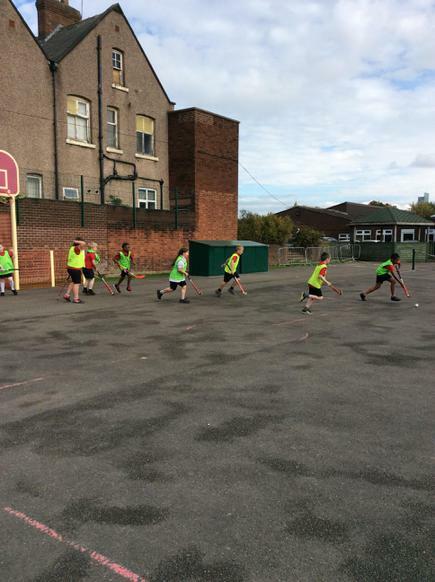 PE lessons for Year 5 take place on Monday afternoon. 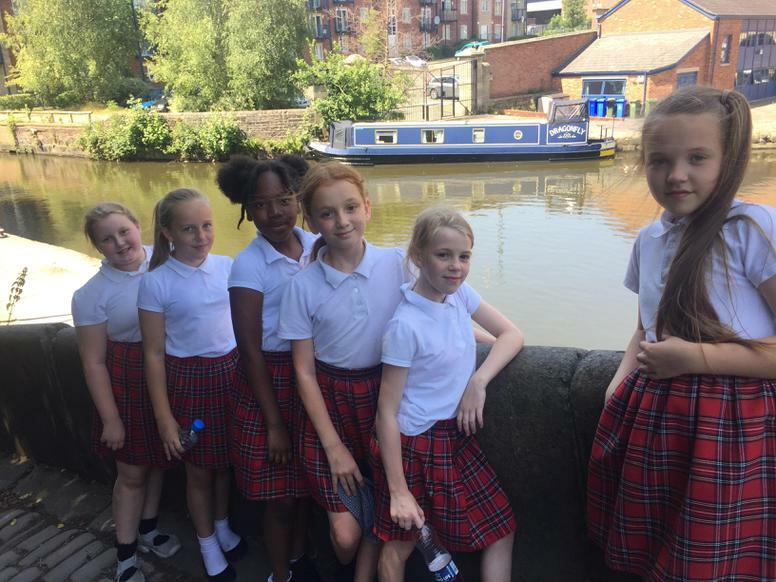 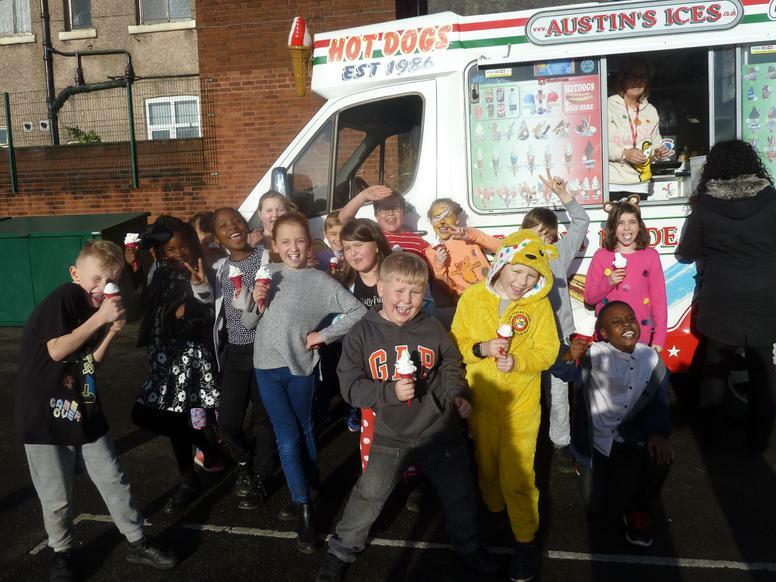 THE NEW SCHOOL YEAR - It's September 2017 and we're in Year 5!